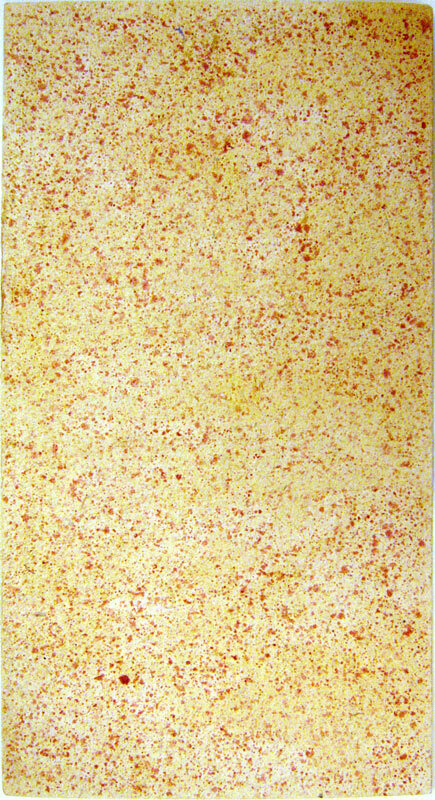 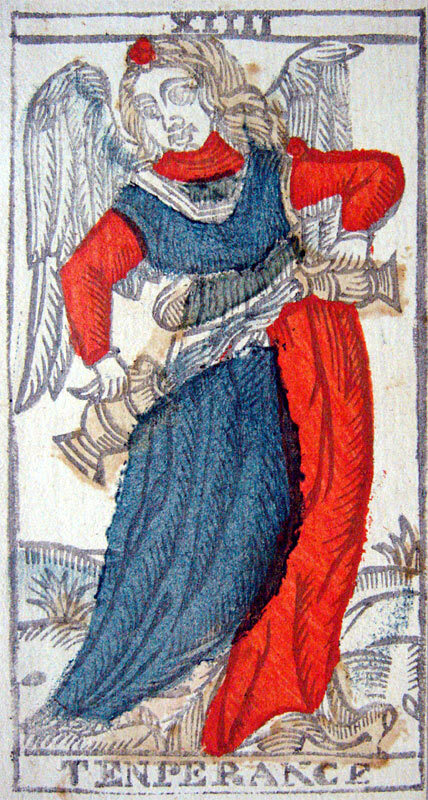 “ of Marseilles ” of reference, resulting from museums and private collections. 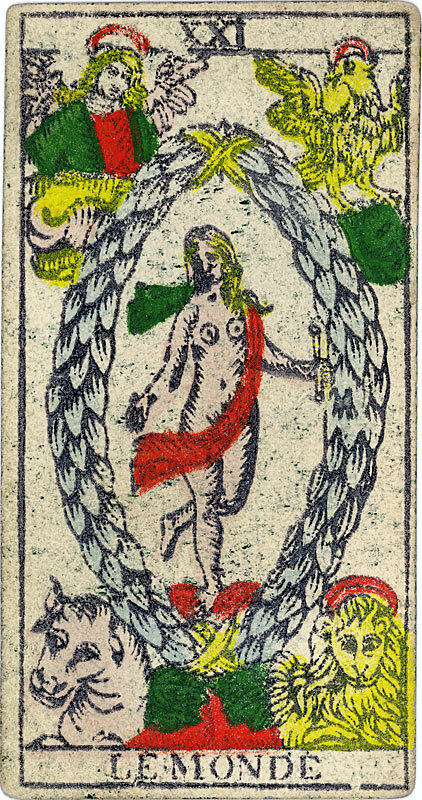 The general public can so discover decks until now almost unknown, among which some are shown, in association with the website Tarot of Marseilles Millennium Edition, in color for the first time. 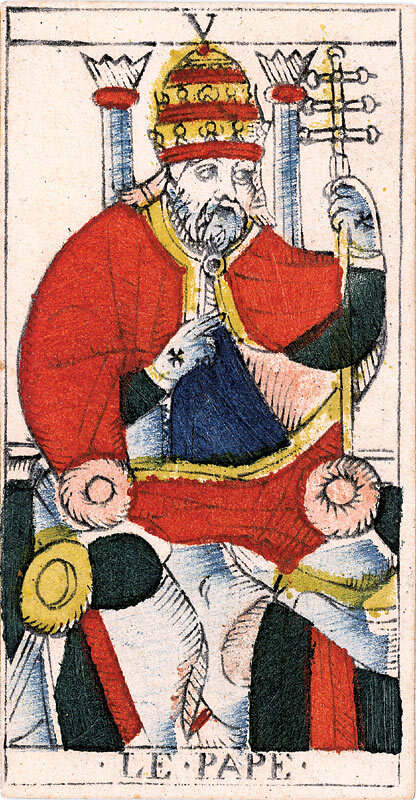 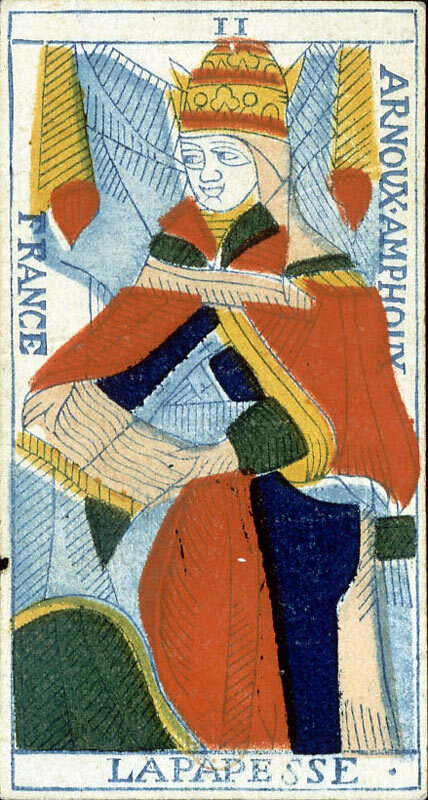 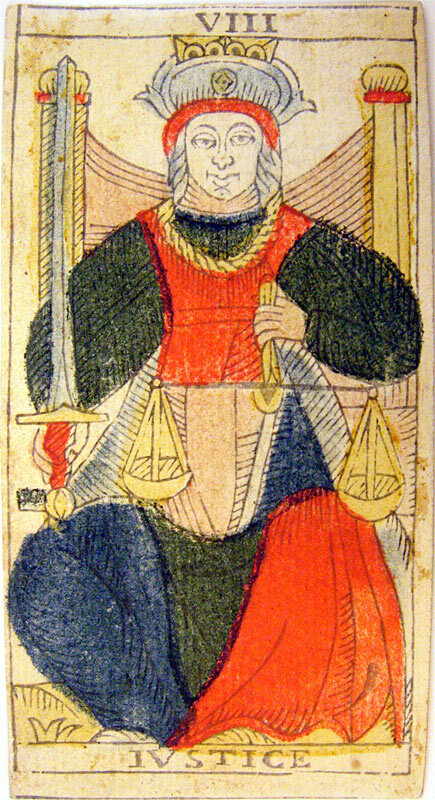 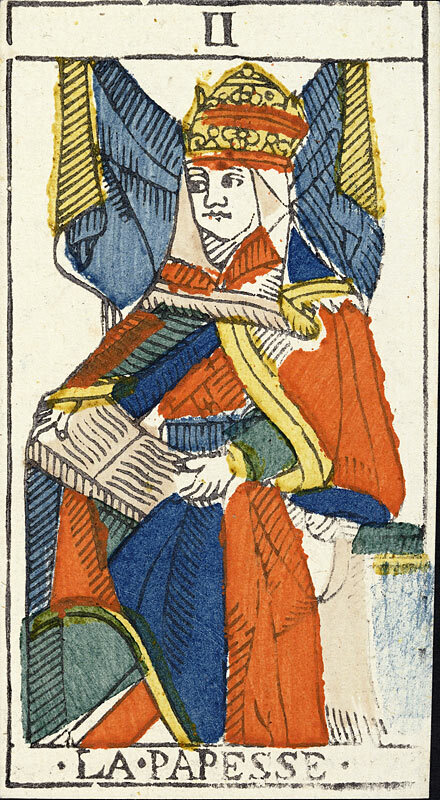 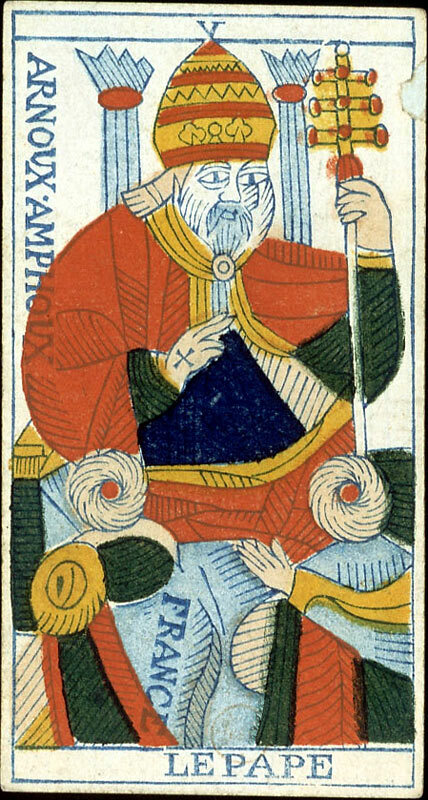 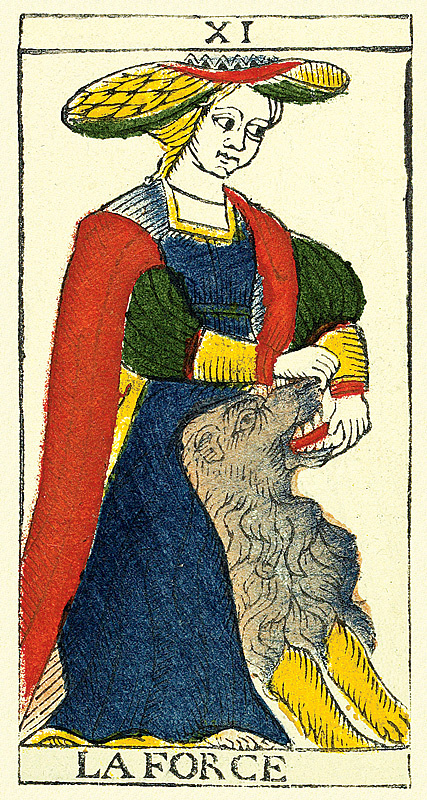 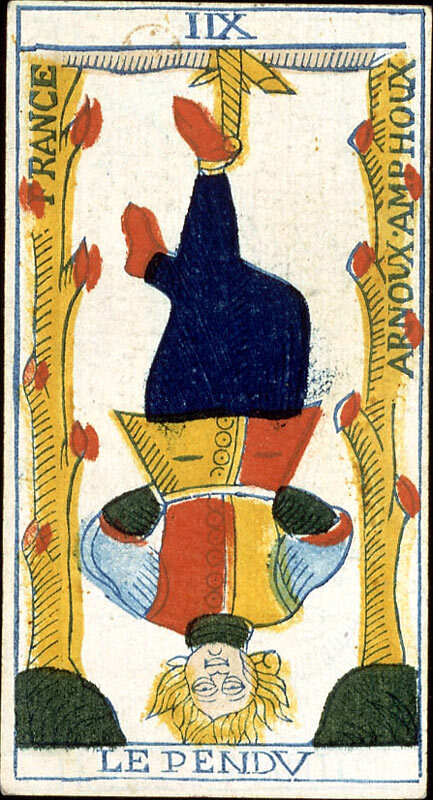 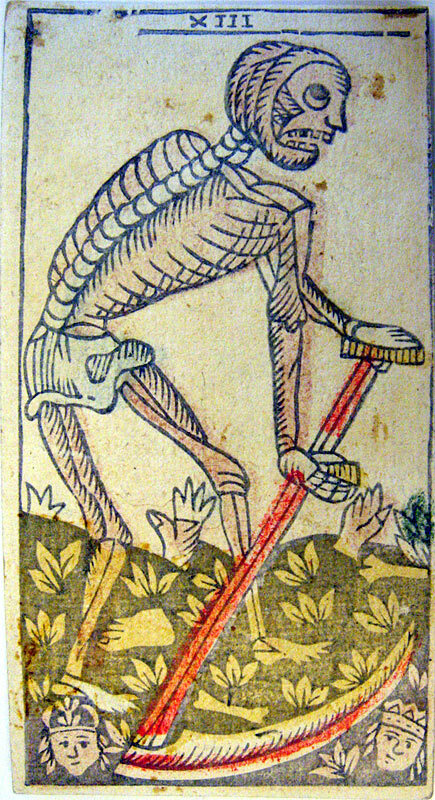 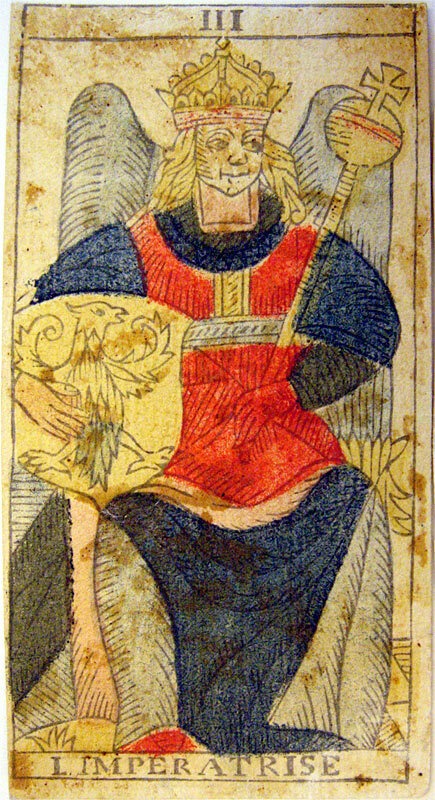 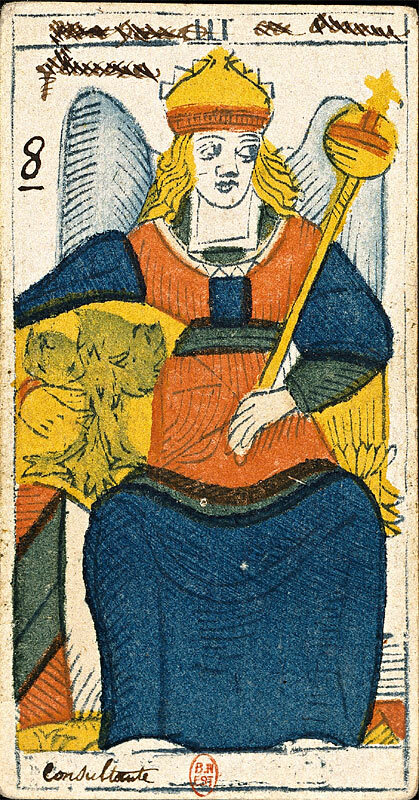 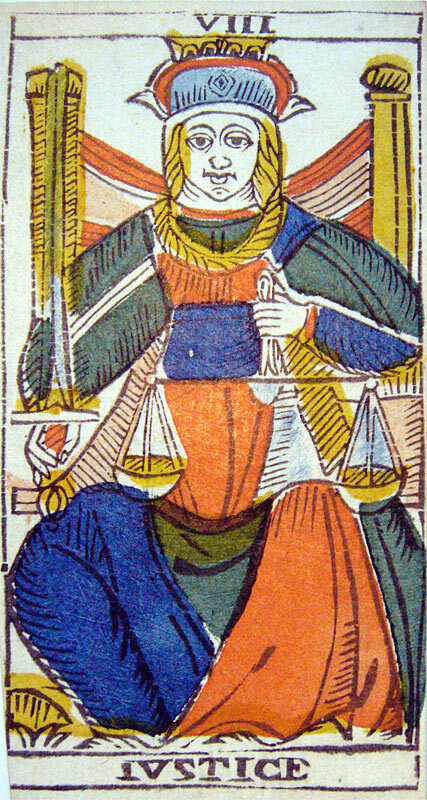 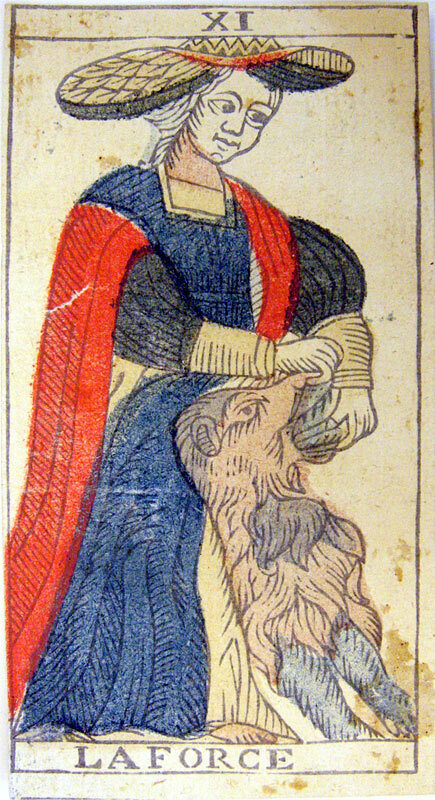 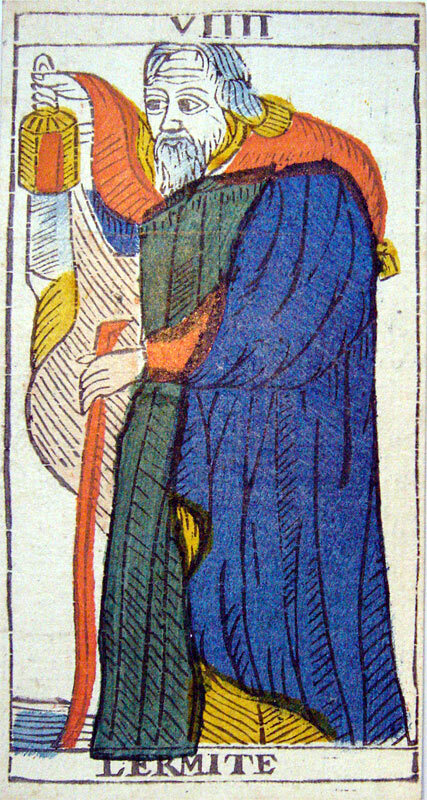 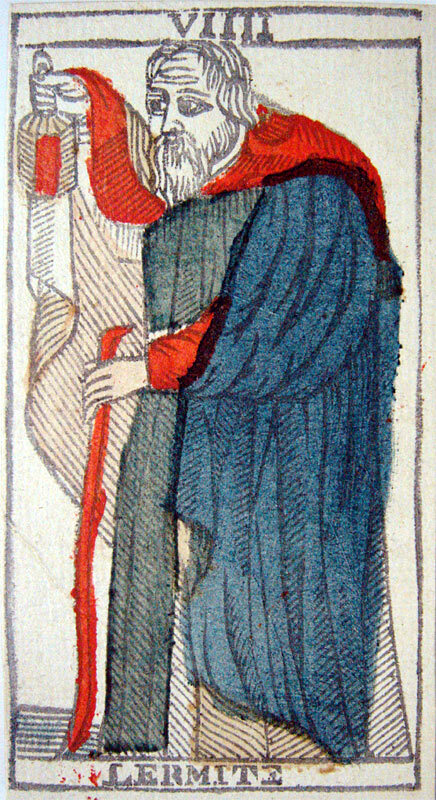 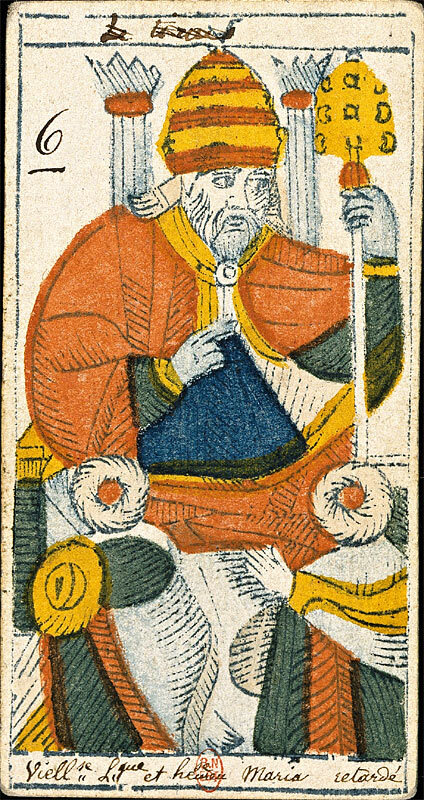 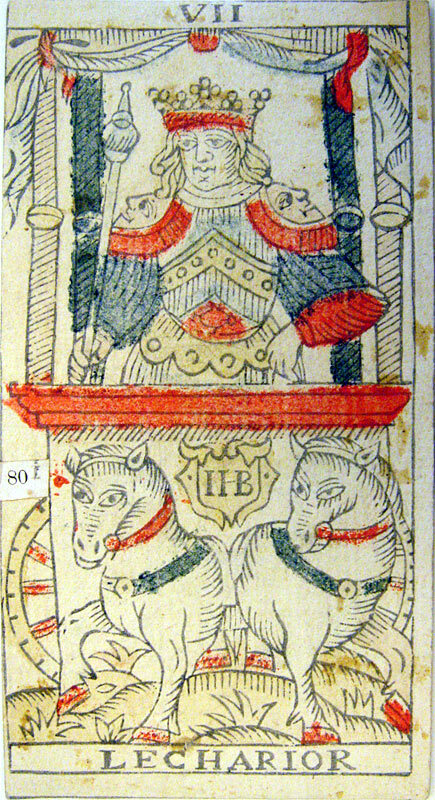 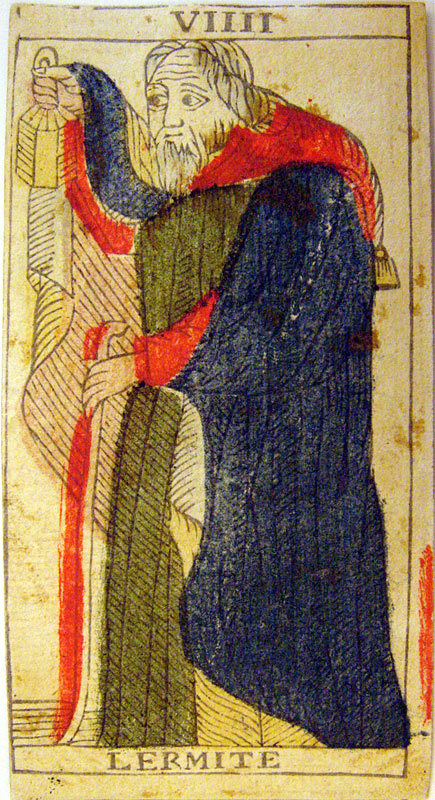 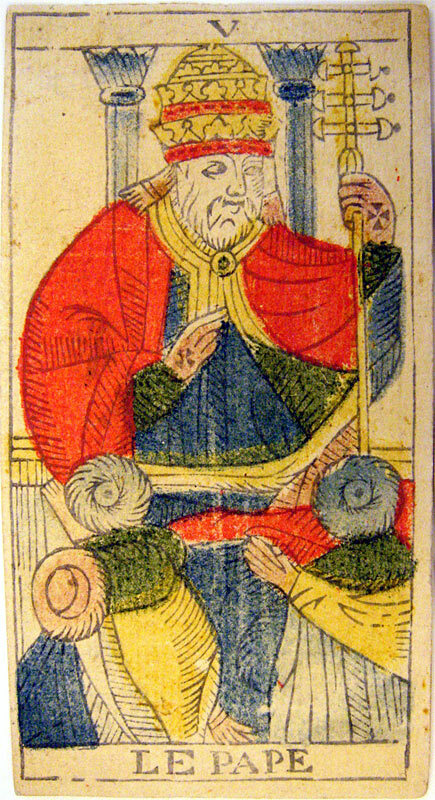 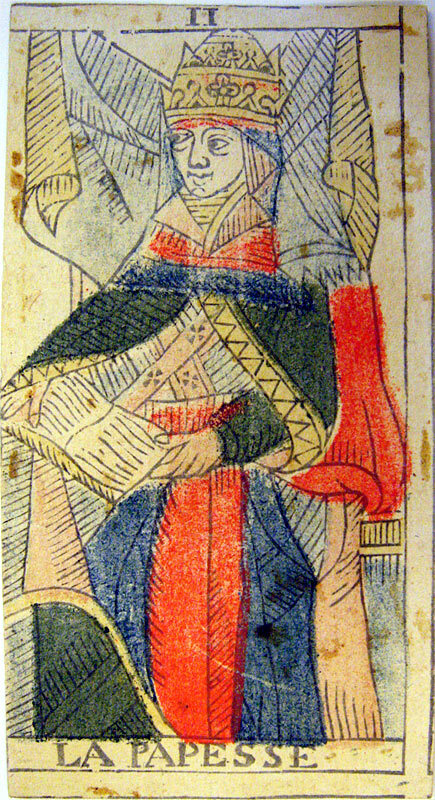 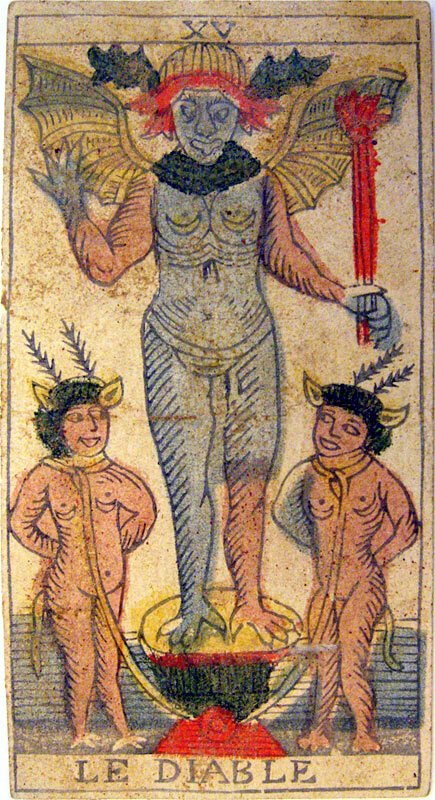 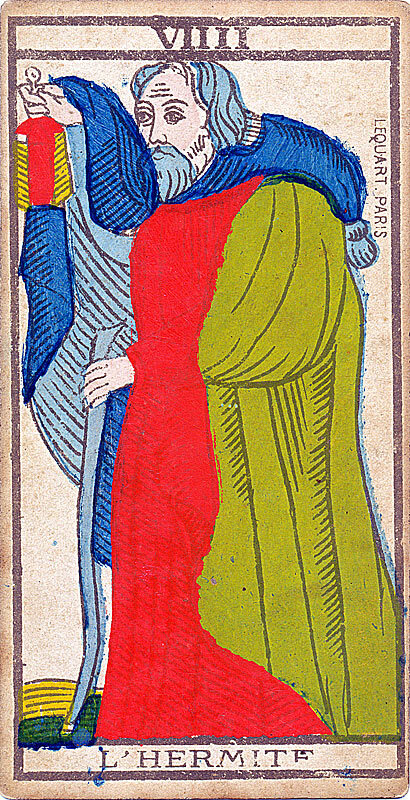 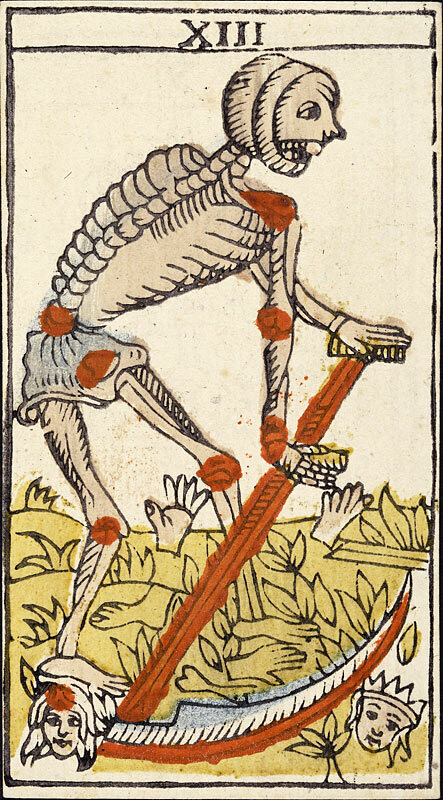 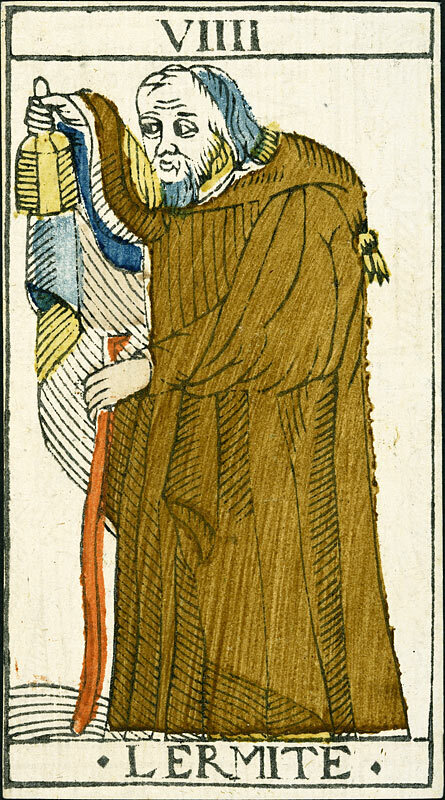 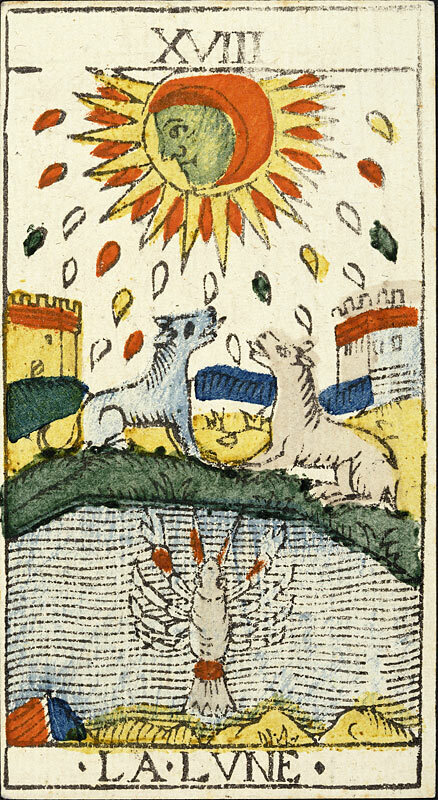 This Tarot is the oldest Tarot of Marseilles referenced of the “ type II ” category (Cf. 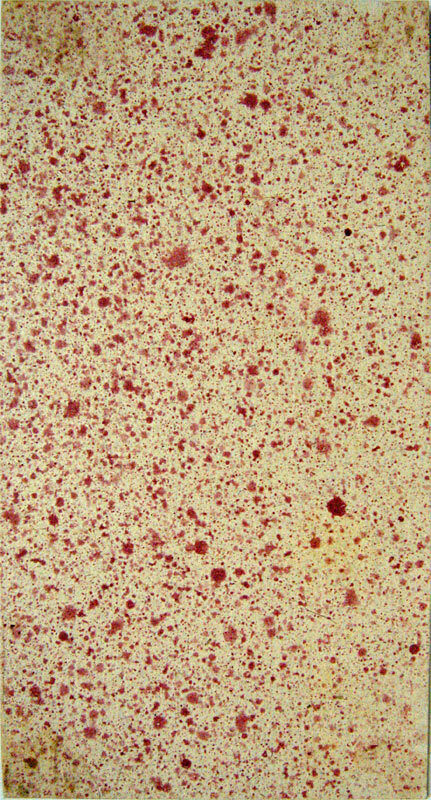 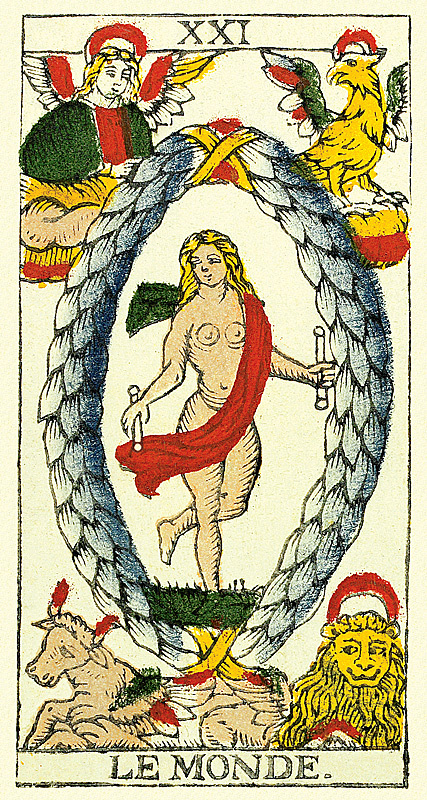 Frequently asked questions), considered all over the world as the standard model, most people commonly refer to. 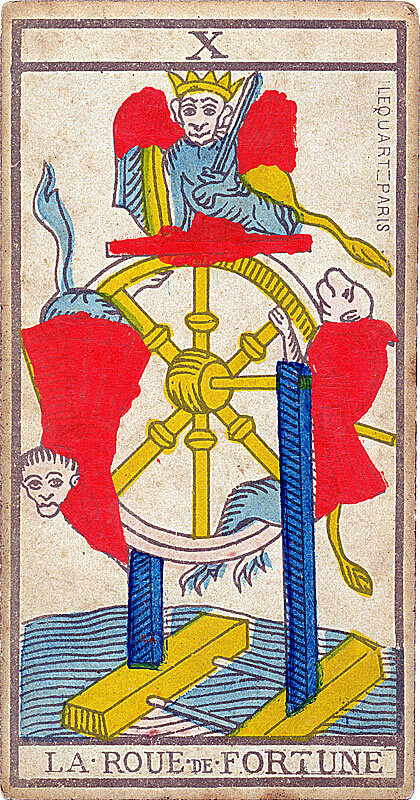 Due to the correctness of its cannon, the quality of its engraving, and the very good preservation of its colors, this deck is also one of the most beautiful. 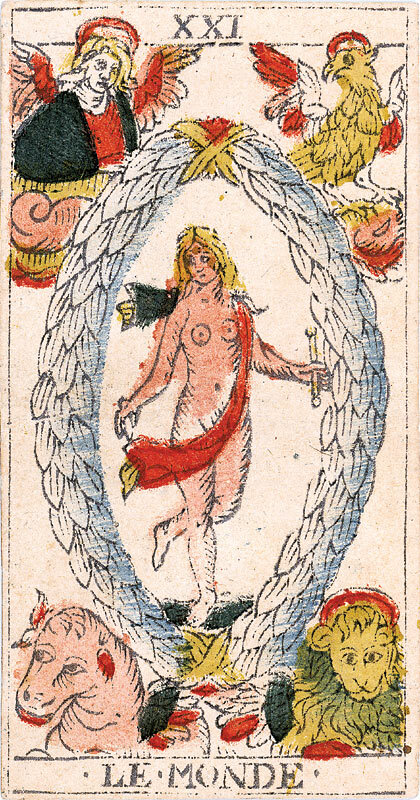 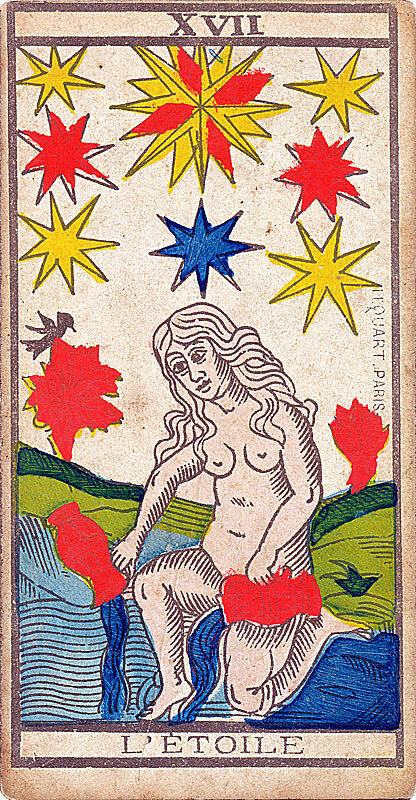 The copy presented here is preserved in the Swiss national Museum of Zurich, the only known complete copy of this deck to this day. 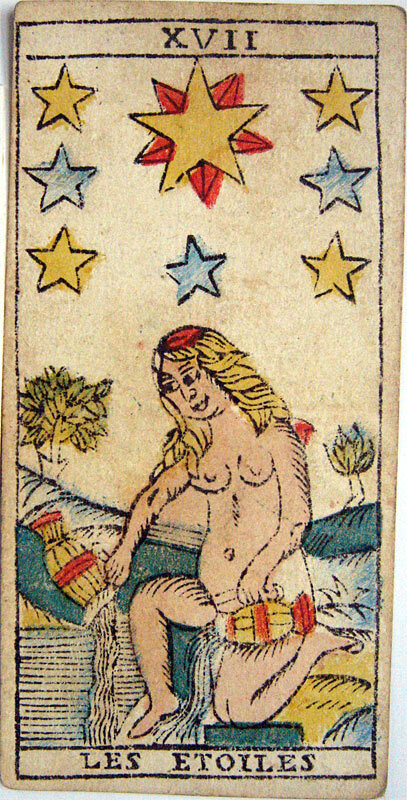 It is hoped by the above-mentioned researchers that other copies are preserved in private collections, as well as some other Tarot decks unknown by the public. 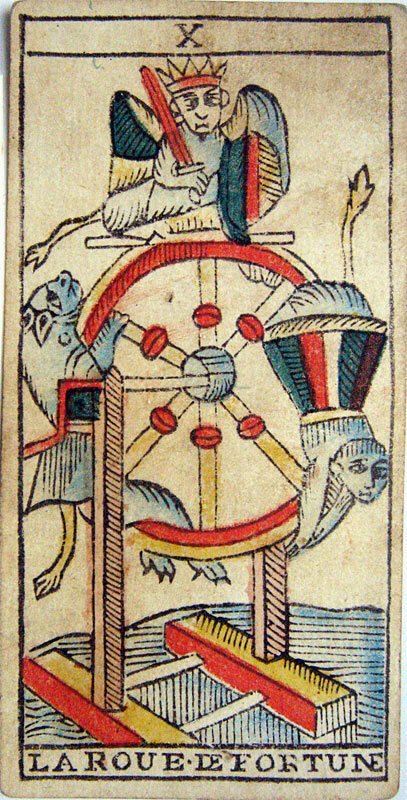 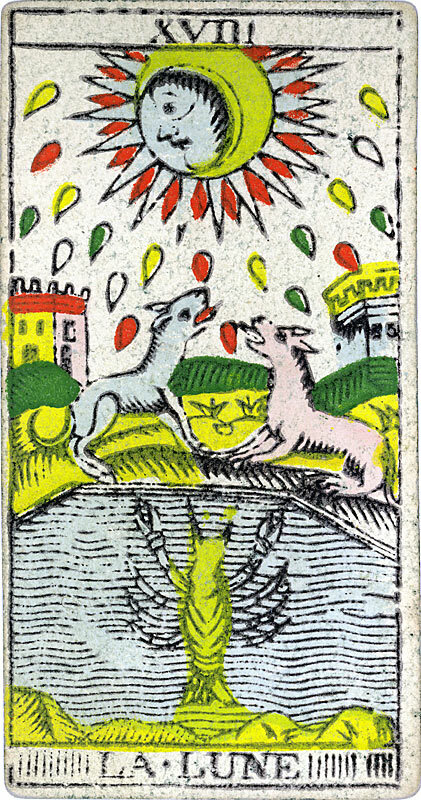 So, the collectors who wish to participate to complete the inventory of the Tarots said “ of Marseilles ”, to help advance the research and eventually to reveal these treasures to the public, are very welcome, and invited to contact the authors of this website. 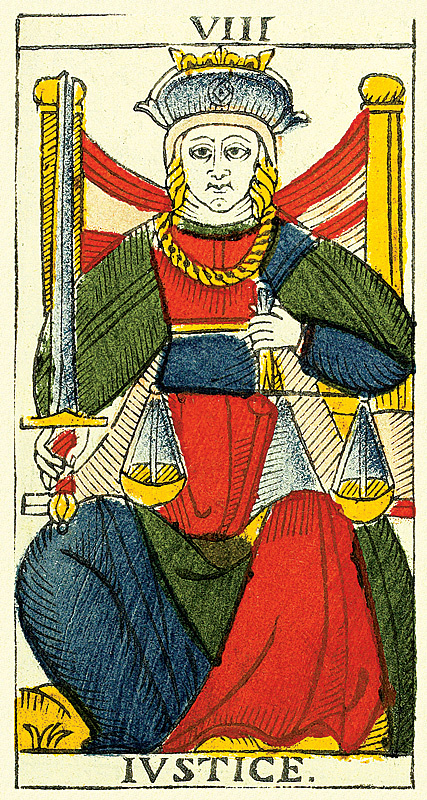 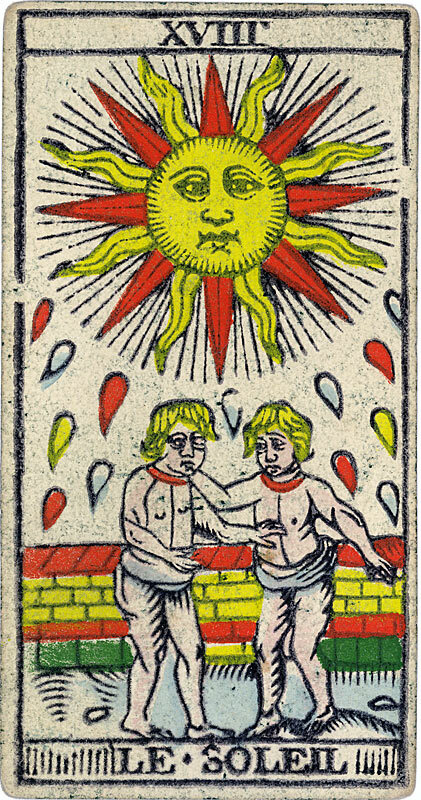 The facsimile of this Tarot is available on the sale in the Boutique of the present website. 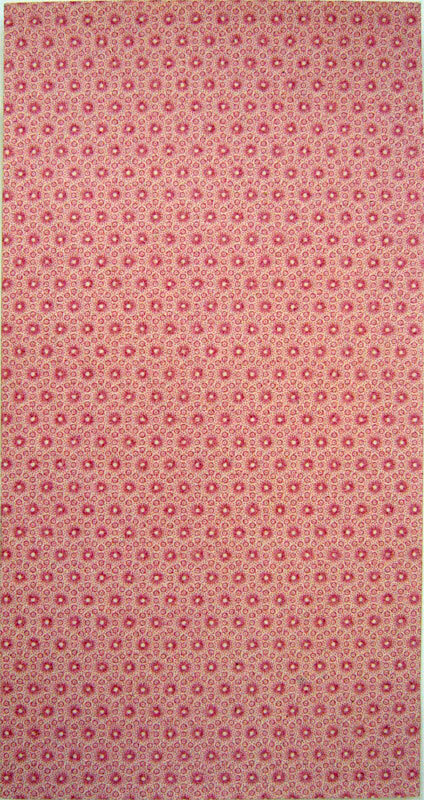 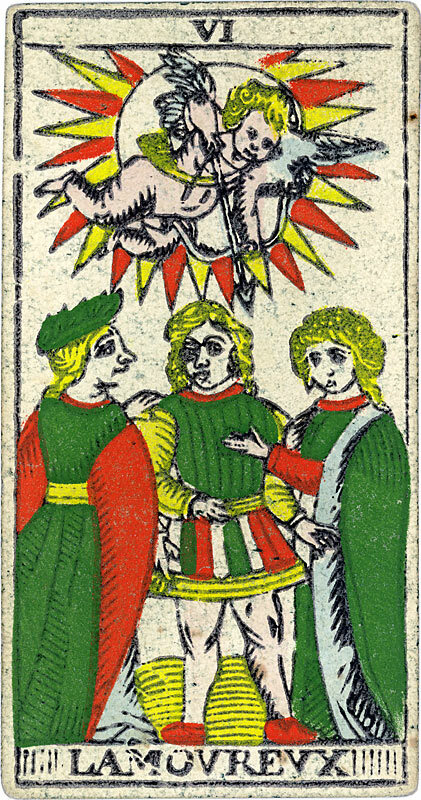 This Tarot, realized by a swiss master cardmaker having produced several other decks, is unique. 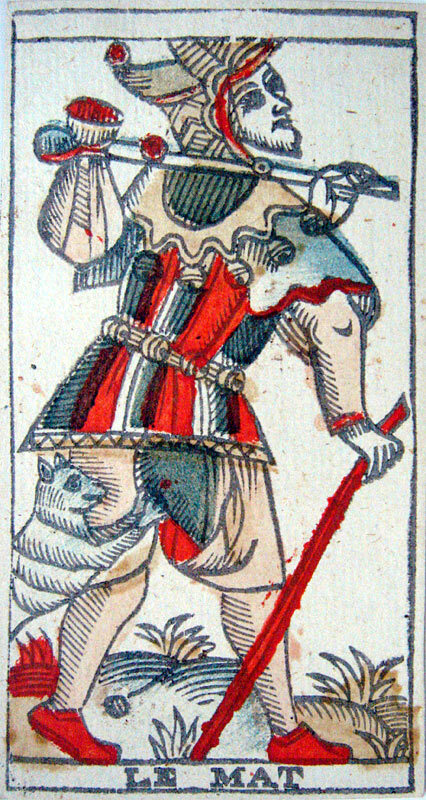 With the Tarot of Jacques Viéville (which is classified in another category), it is, among the known historic Tarots, the deck presenting the least cut down icons, the frame being, quite as the Tarot of Marseilles Millennium Edition, opened, not altering (or less, as regards the François Héri 1718), the integrity of the icons. 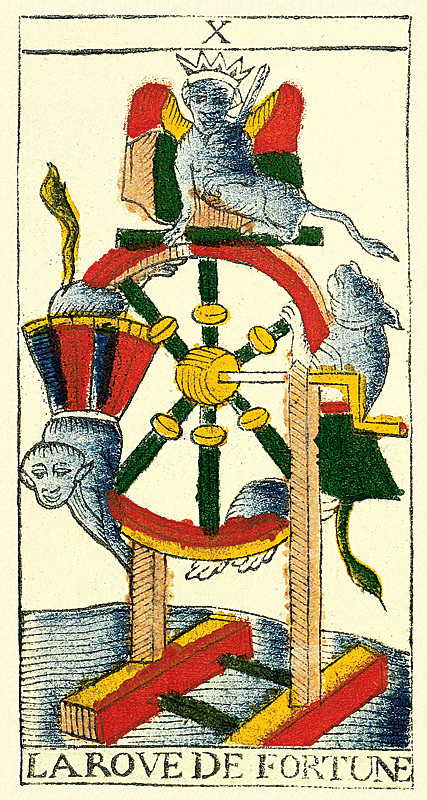 So the Arcanum LE MAT, I LE BATELEVR, and of course the throne of IIII LEMPEREVR, are whole here, or almost. 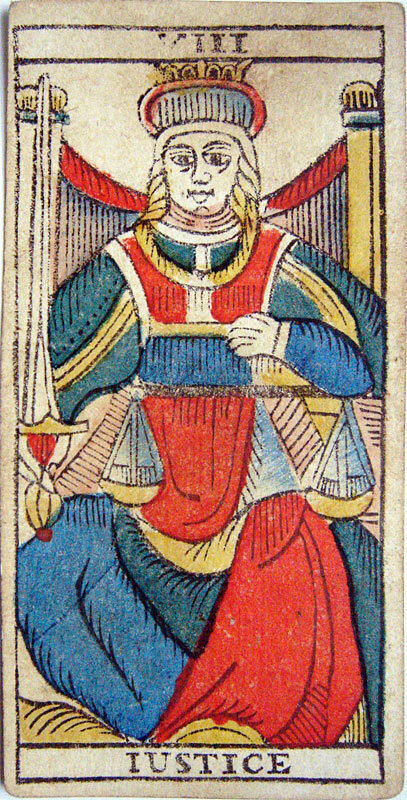 To know more about the rognage of icons in Tarot history, the reader is invited to read the answers to the Frequently asked questions. 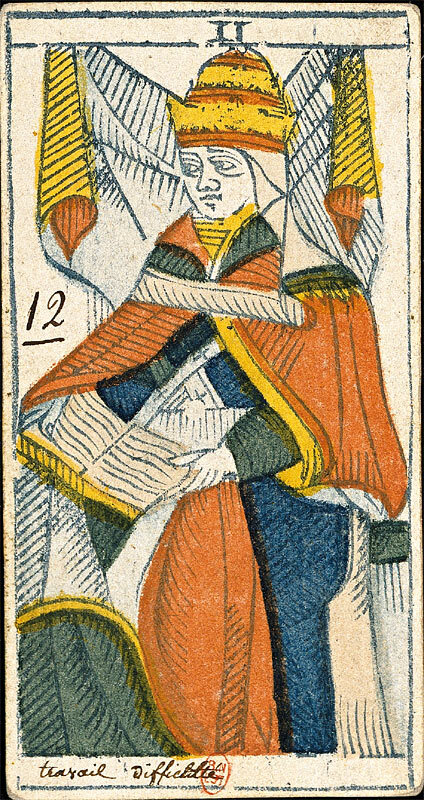 A detail, also important : XII LE PENDV stretches out the ear. 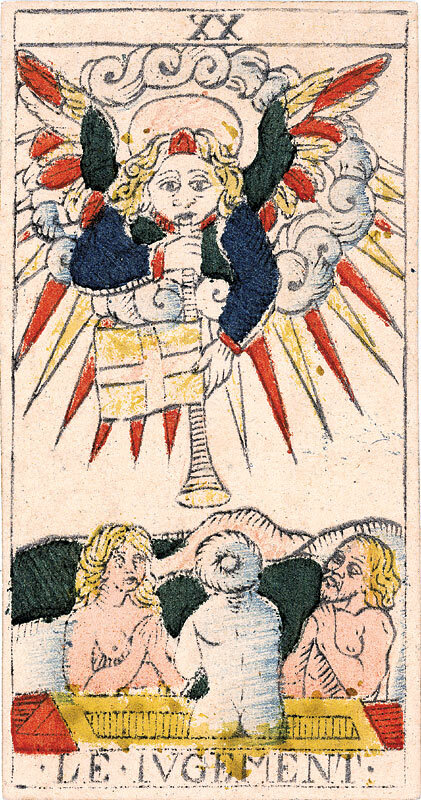 The copy presented here is preserved in the Swiss national museum of Zurich. 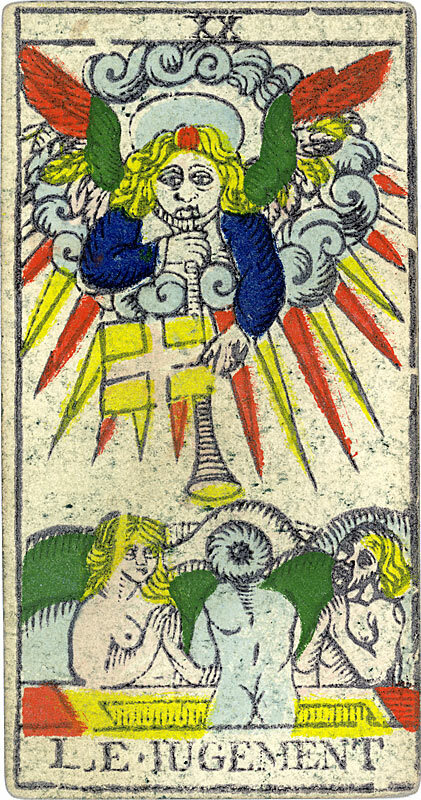 Note: the original “ taroted ” back will soon be added. 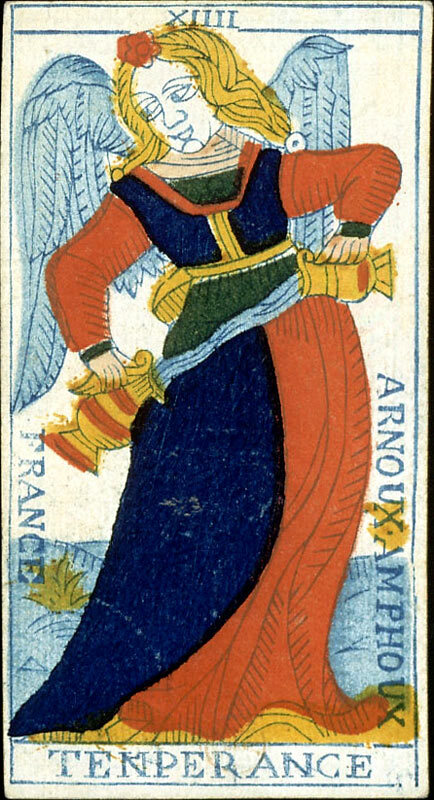 This Tarot of Marseilles was realized by François Chosson in the town of Marseilles by 1736, date attributed to the envelope of its Tarot, deposited the same year by this master cardmaker at the police registers of Marseilles (Archives of Marseilles - quote FF 308). 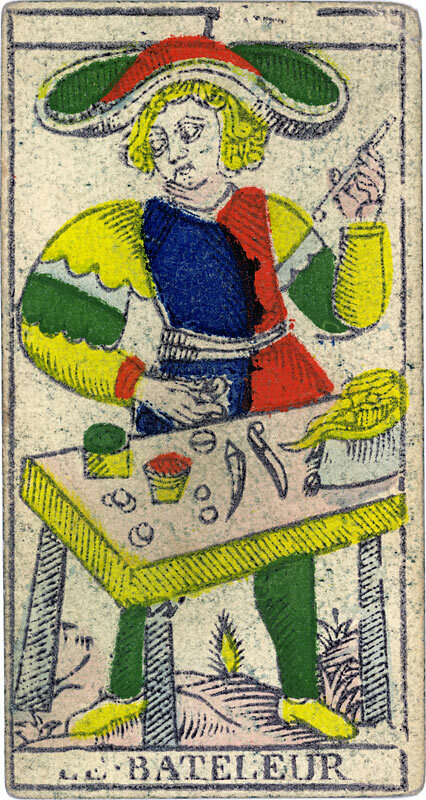 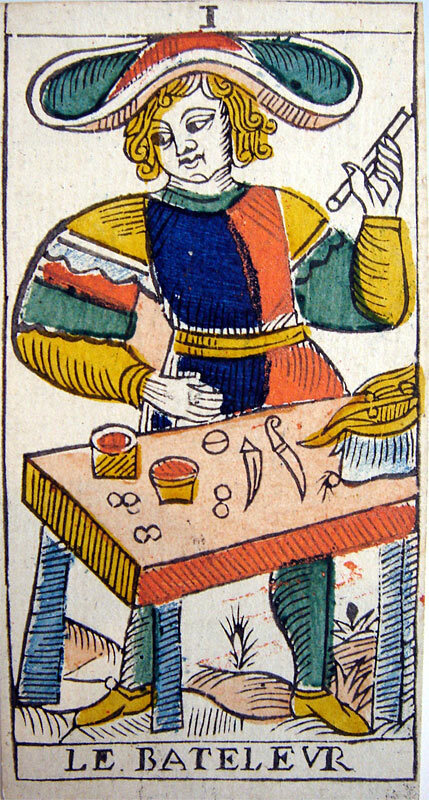 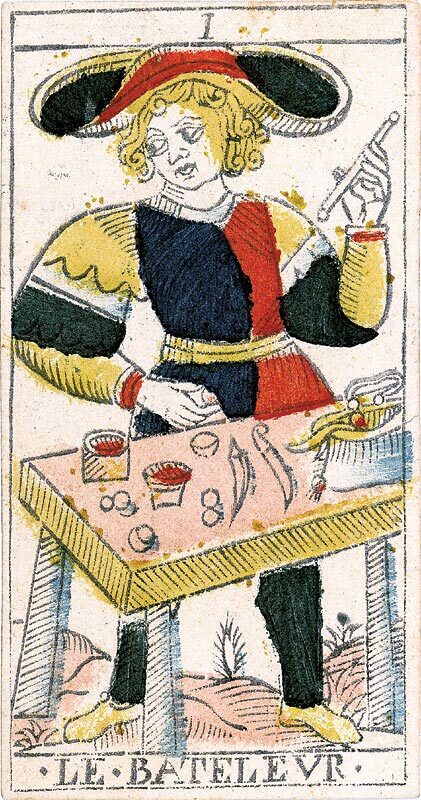 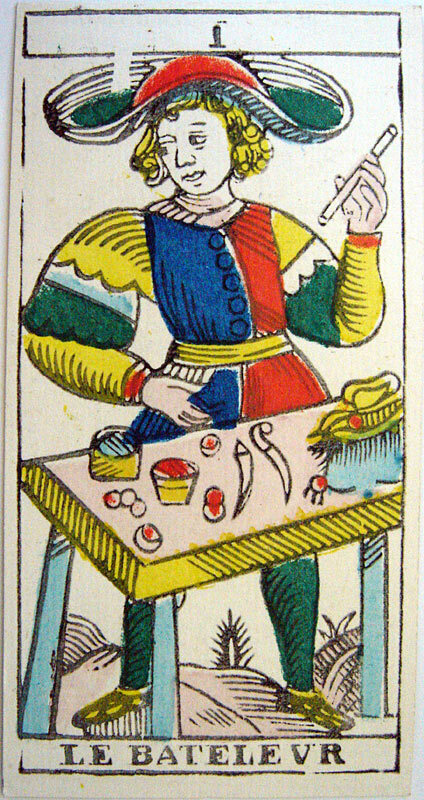 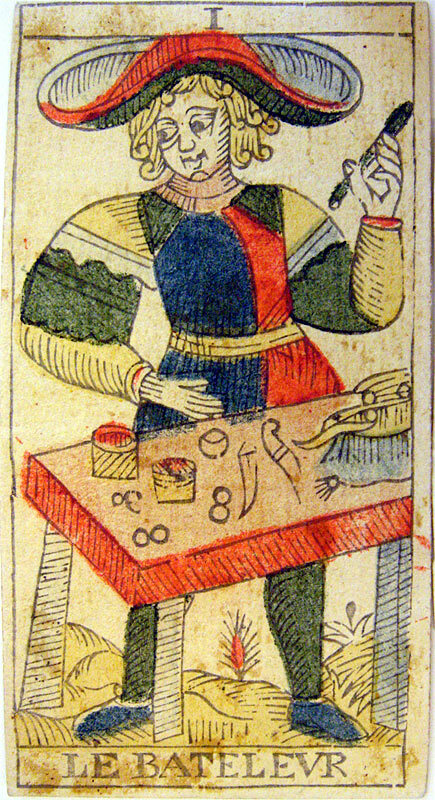 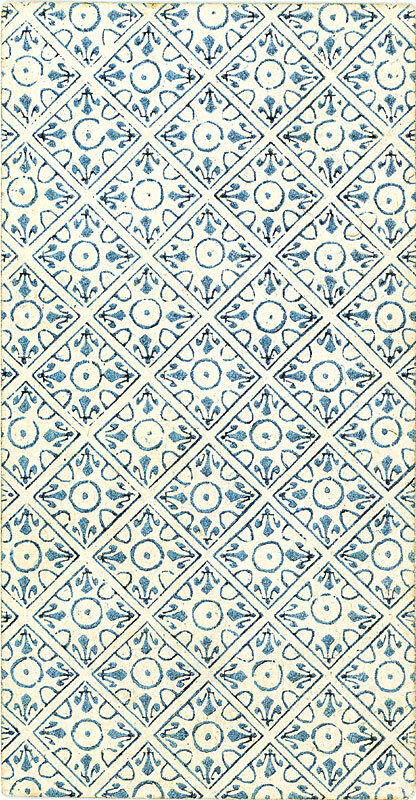 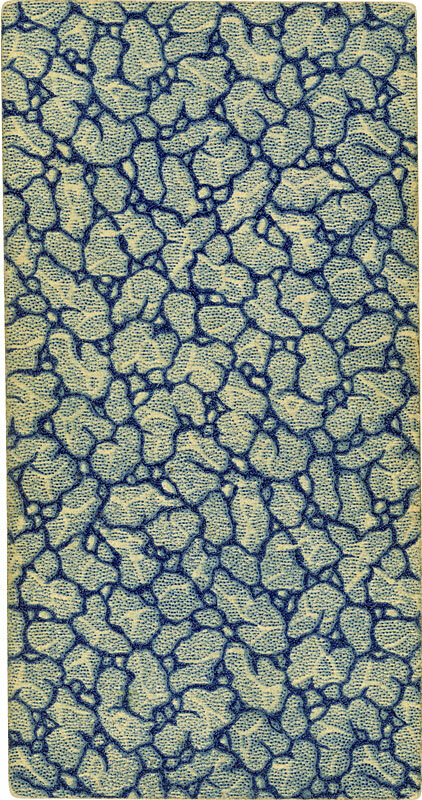 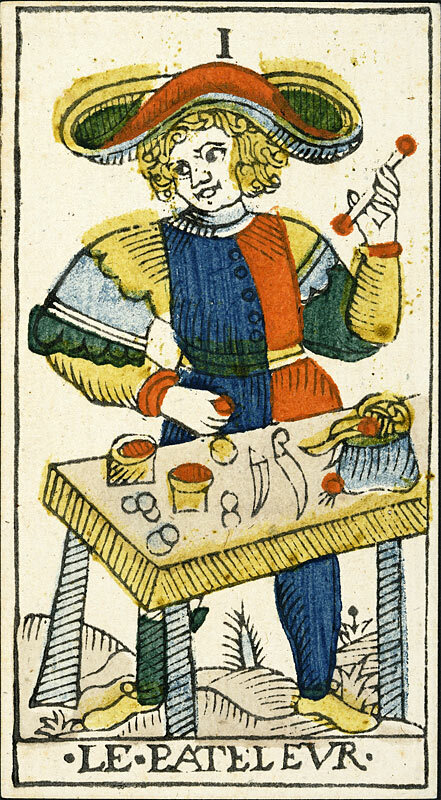 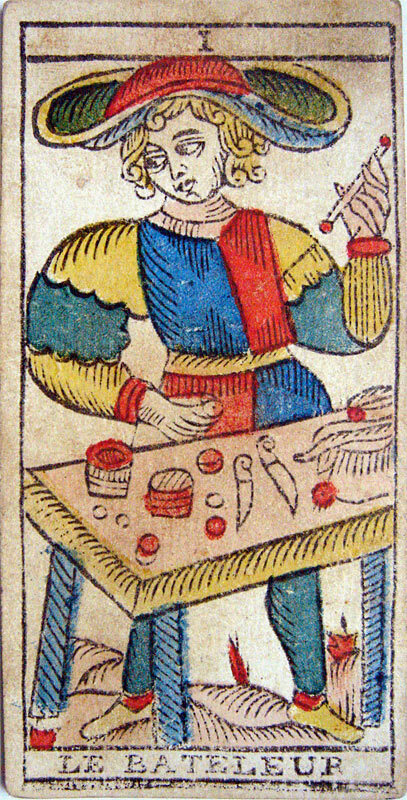 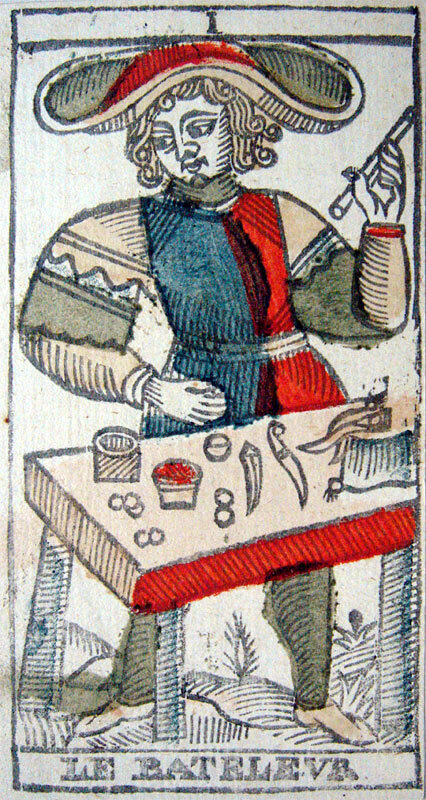 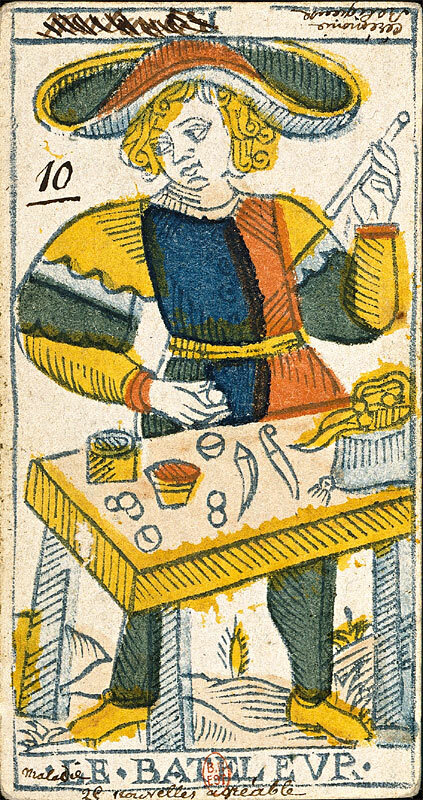 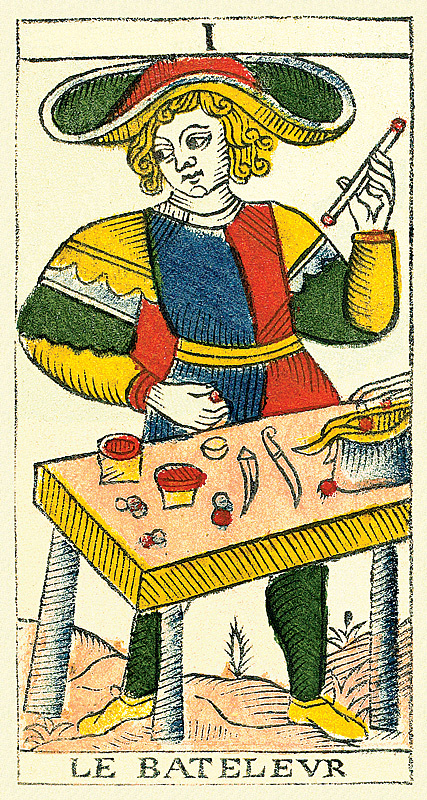 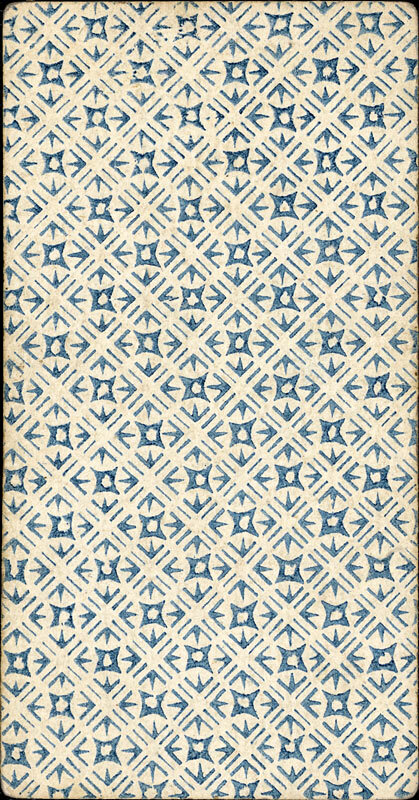 According to the work Les cartes à Jouer Du XIVe Au XXe Siècle ( The deck of cards of the XIVth In the XXth century) of Henri-René D’allemagne (published in two volumes by Hachette and Cie in 1906), this master cardmaker from Marseilles indeed practiced from 1734 till 1756. 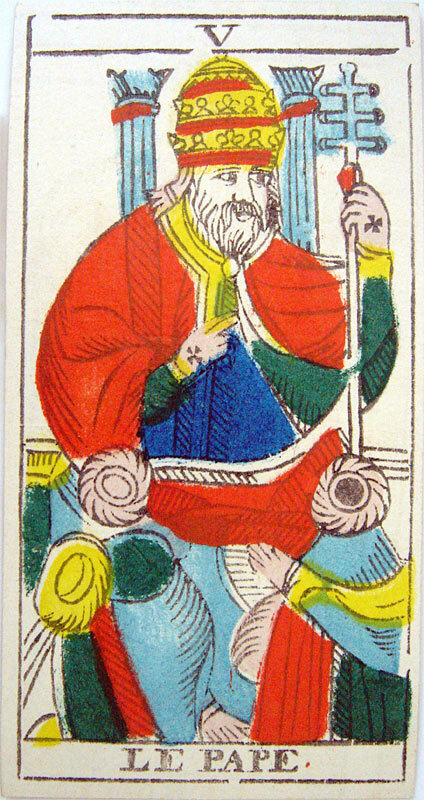 This period corresponds well to the characteristics of this Tarot, representative of the end of the first half of the XVIIIth century : loss of detaisl and rigorous graphs, representations aiming towards the realism. 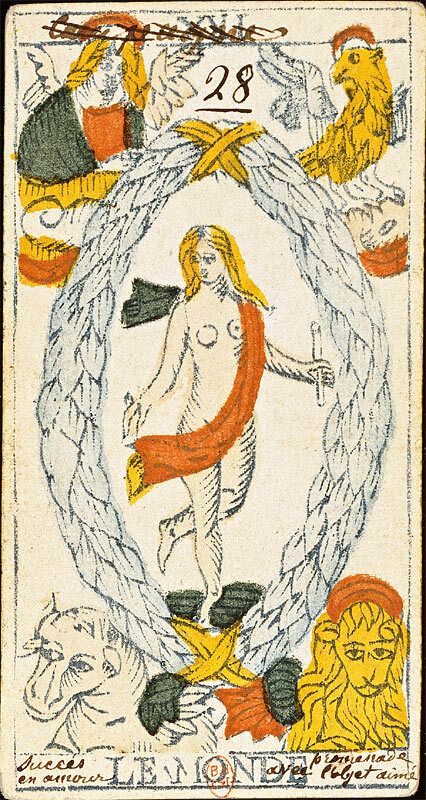 It thus certainly does not date the XVIIth century, that is the date engraved on the II of Denier – supposedly 1672 (for the engraving is chipped) – card on which are traditionally registered the name of the master cardmaker and the year of production, lets believe. 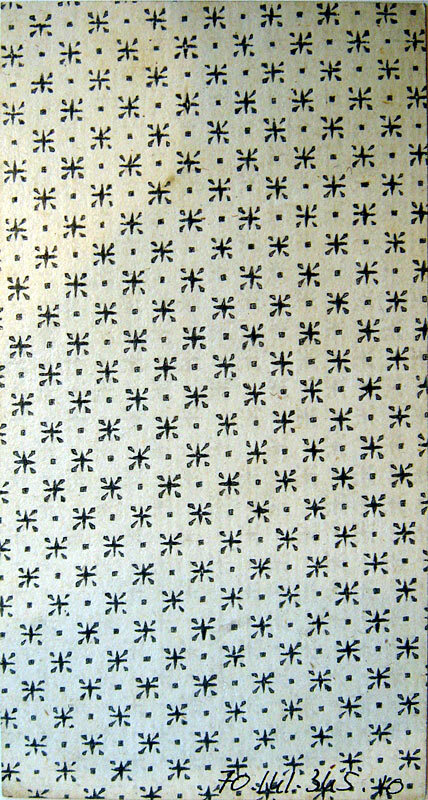 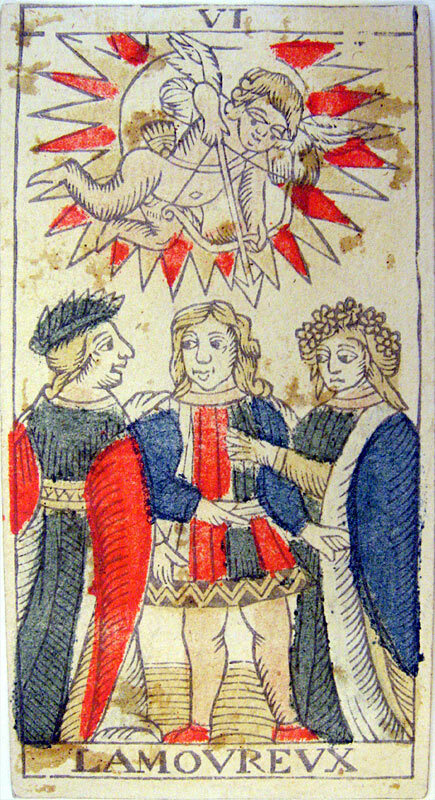 The copy presented here (the unique known this day) is preserved in the Blumenstein Museum of Solothurn, in Switzerland. 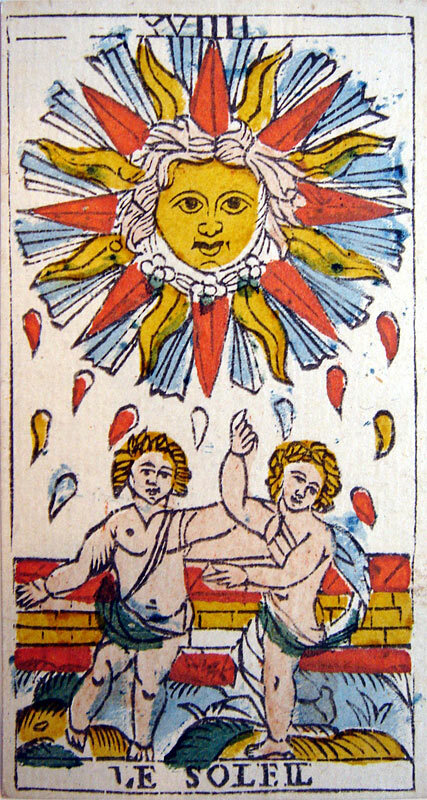 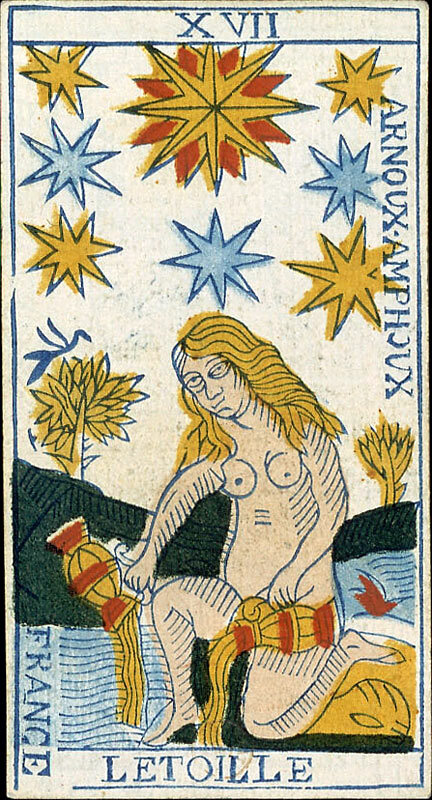 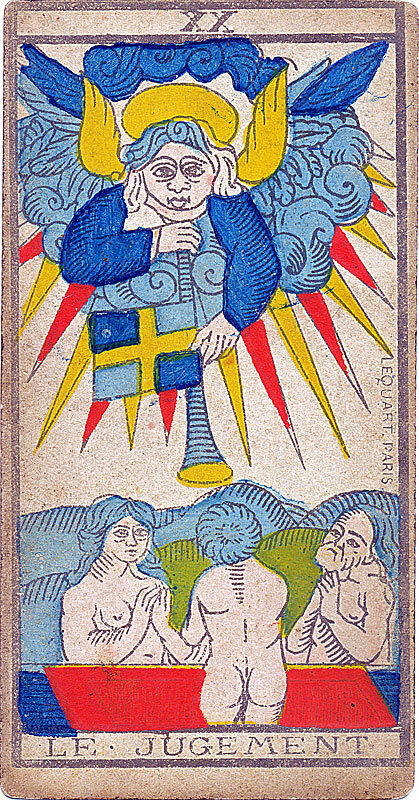 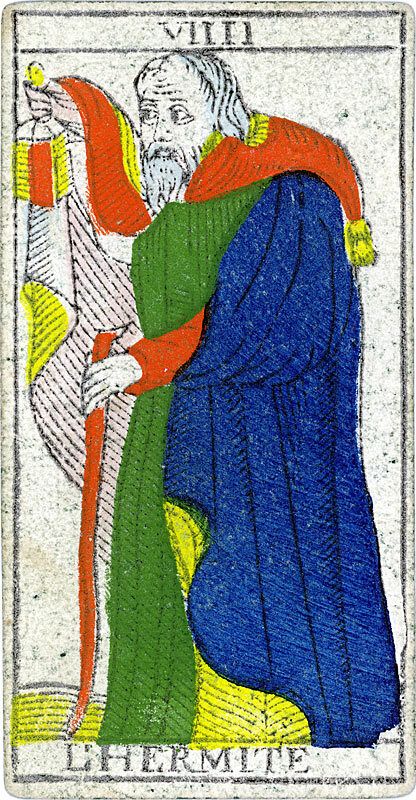 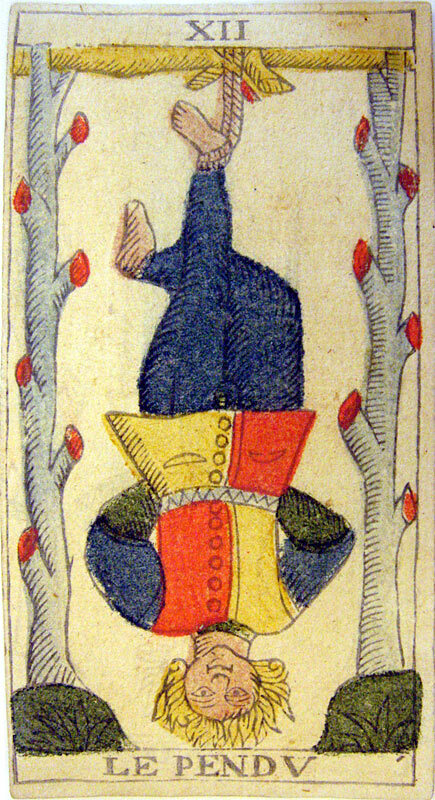 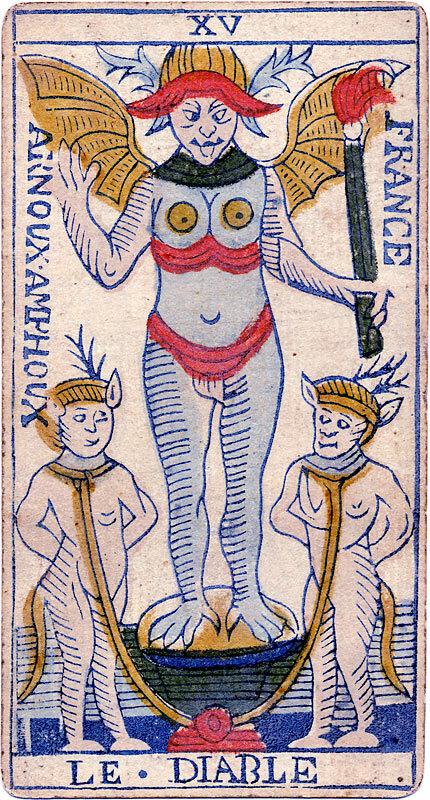 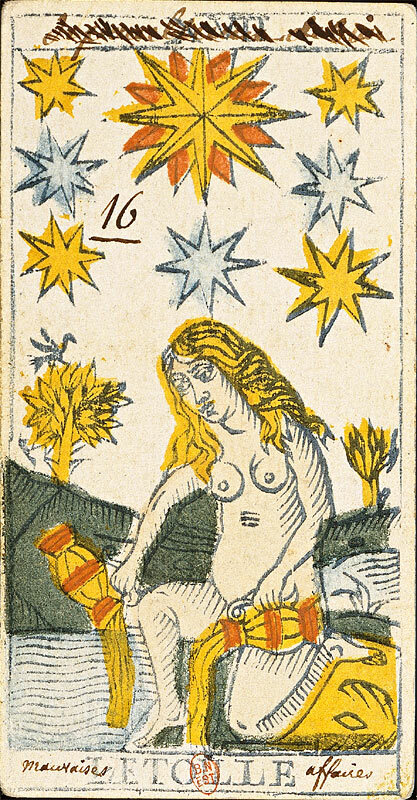 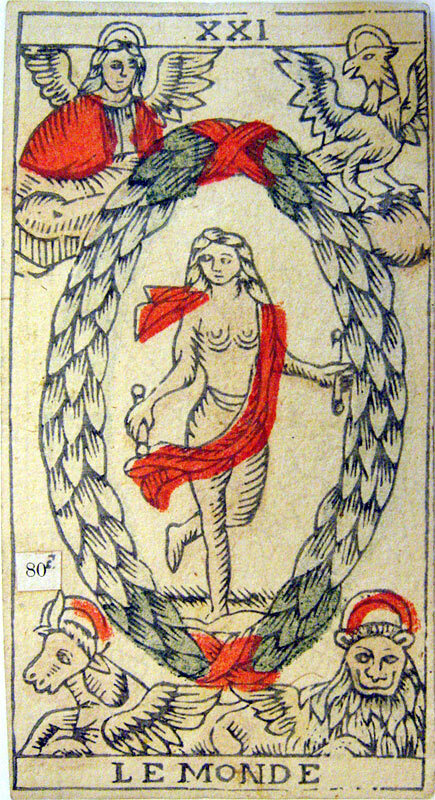 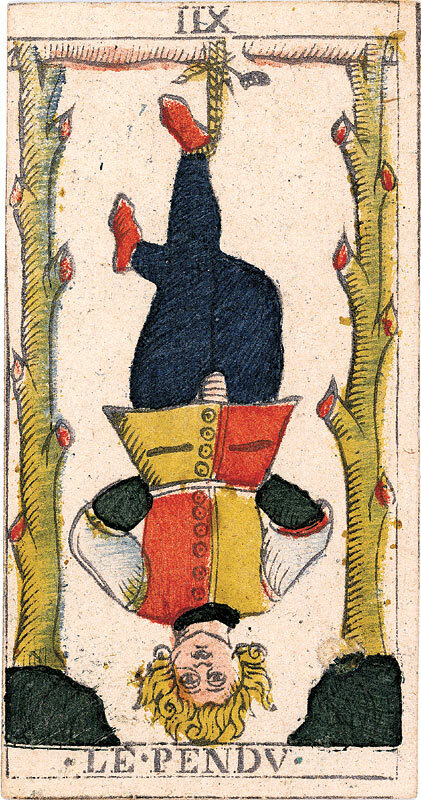 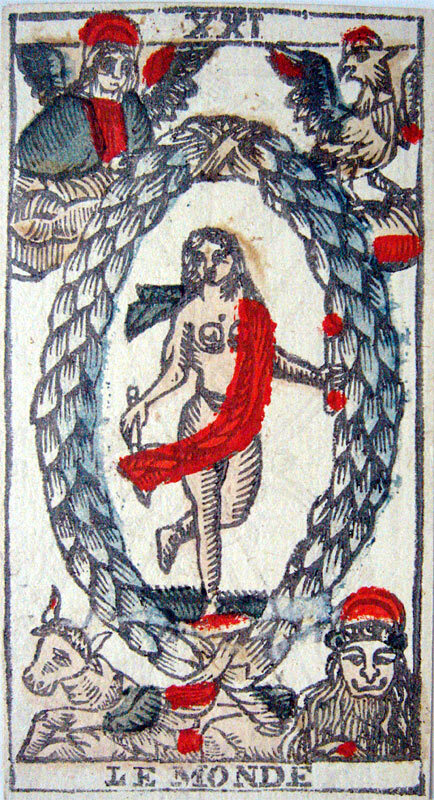 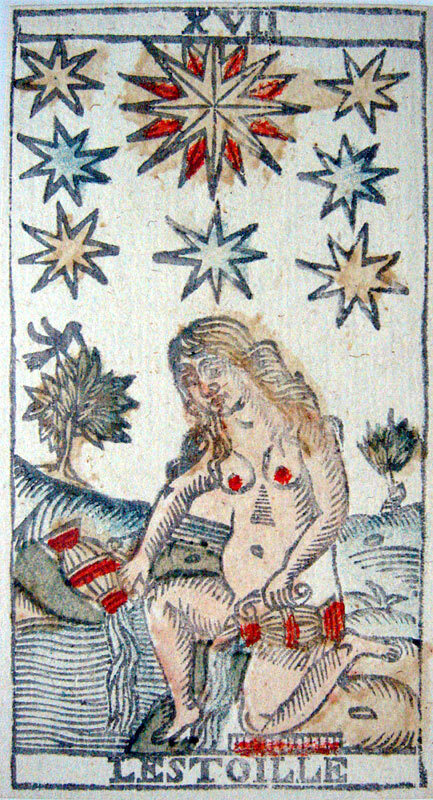 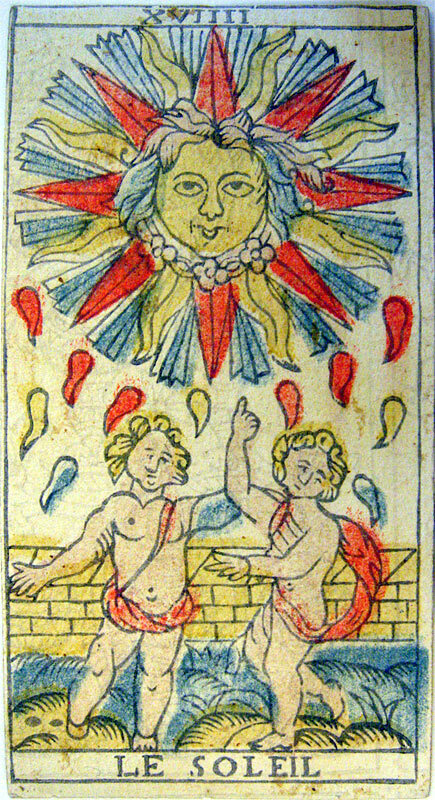 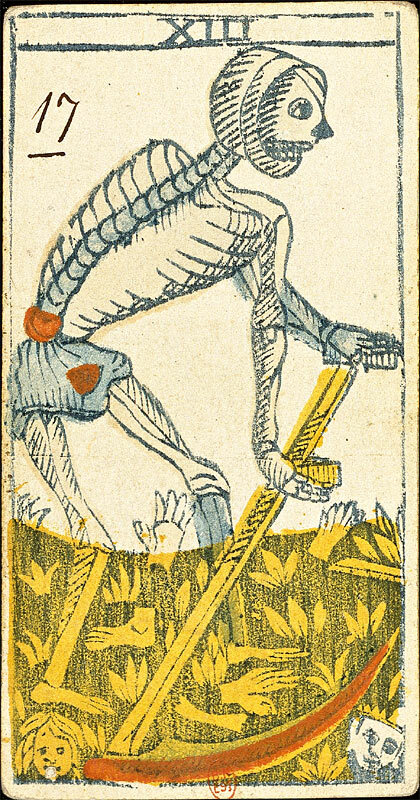 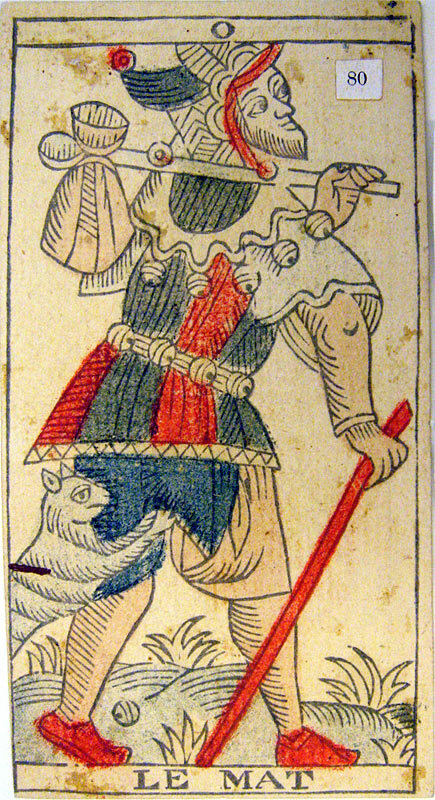 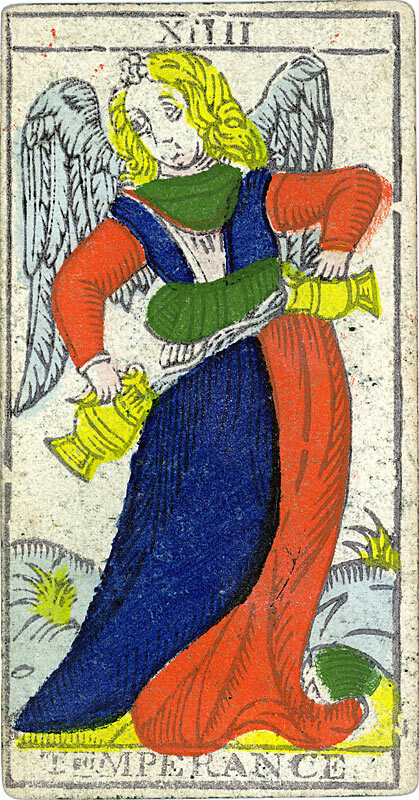 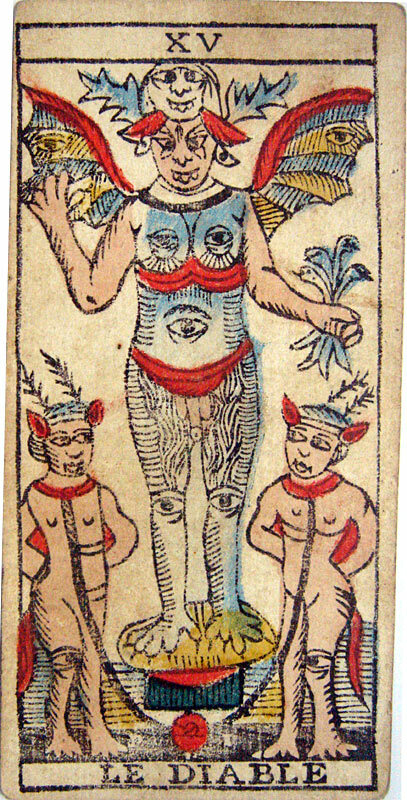 This Tarot was realized by the son of Pierre Madenié, author of the oldest Tarot of Marseilles (1709) referenced in the “ type II ” category (Cf. 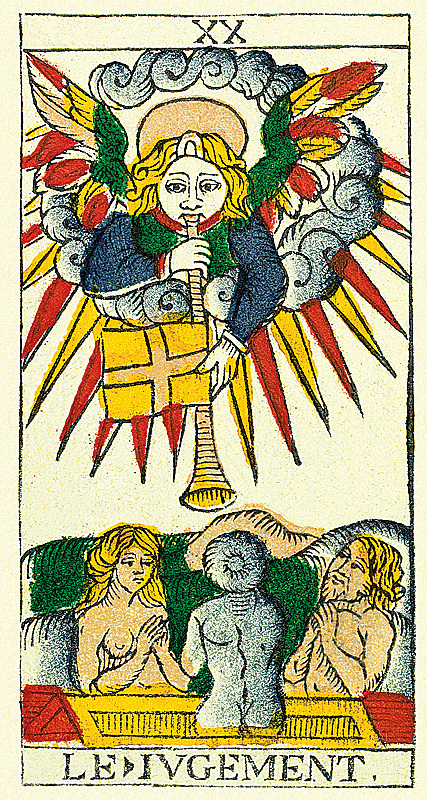 Frequently asked questions), considered all over the world as the standard model. 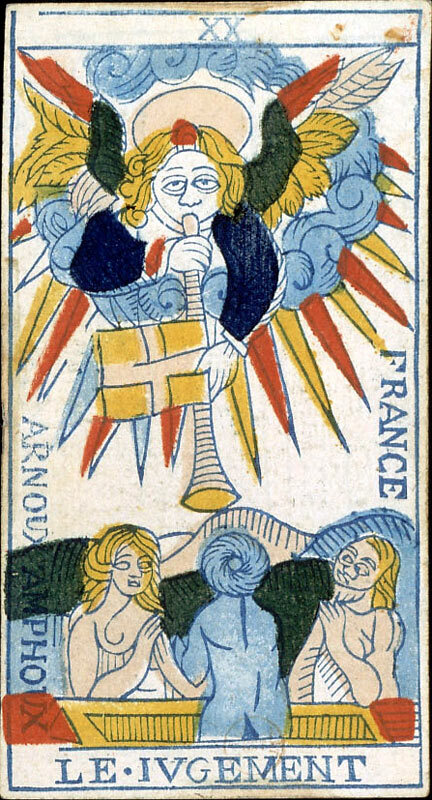 If this edition realized by Jean-Baptiste is altogether less fine than that of his father, and if its cannon gets closer to that of Switzerland (the Arcana XVIIII LE SOLEIL for example), the cards present on the other hand certain details omitted or erased by the wear in the Tarot of Pierre Madenié, 1709. 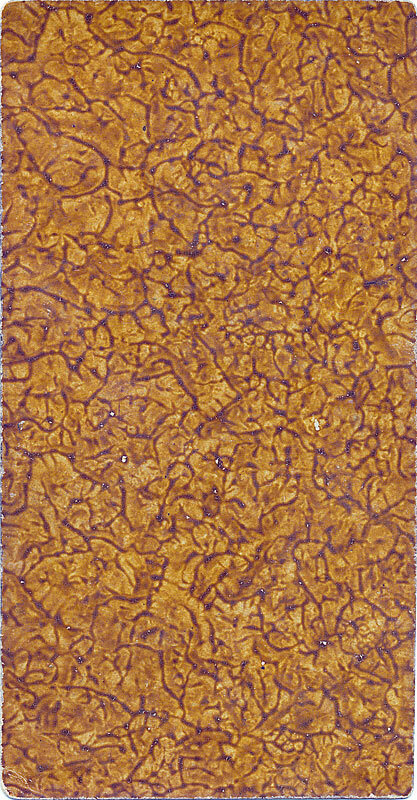 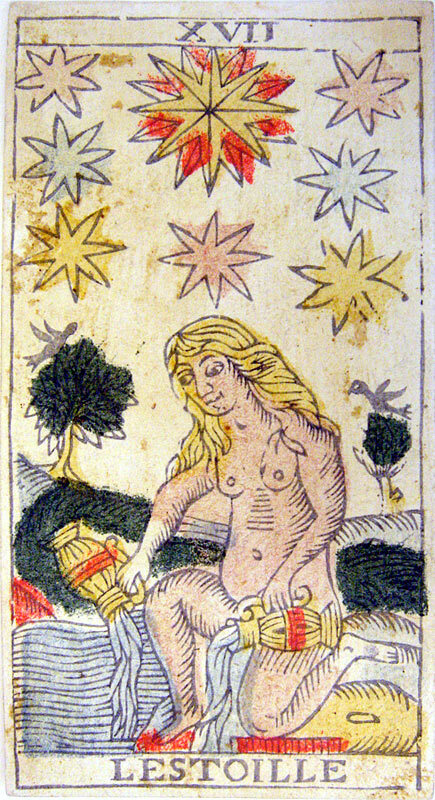 Indeed, the analysis of the copy reproduced above reveals that it is not about a first print, and that moulds were already worn out when it was printed. 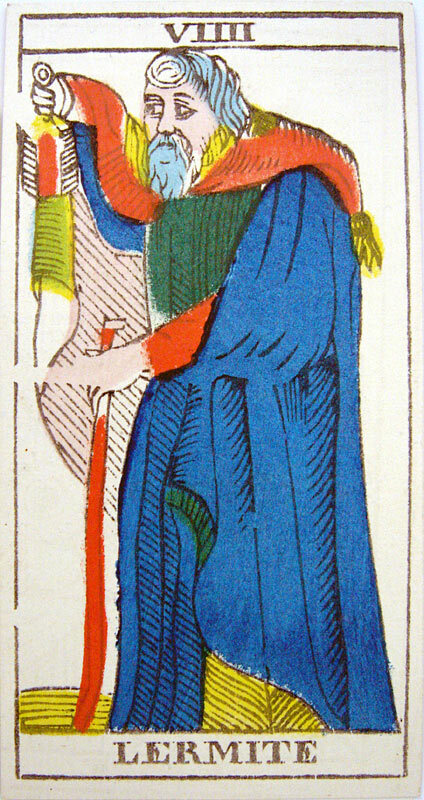 Thus, this edition of Jean-Baptiste Madenié is very precious for researchers of engraving lines and original details. 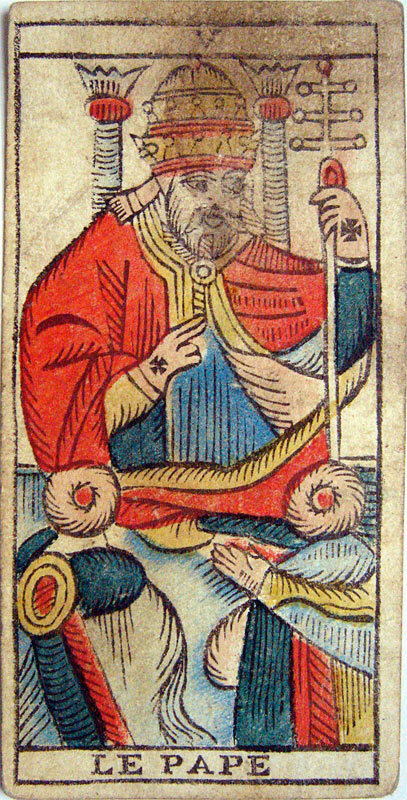 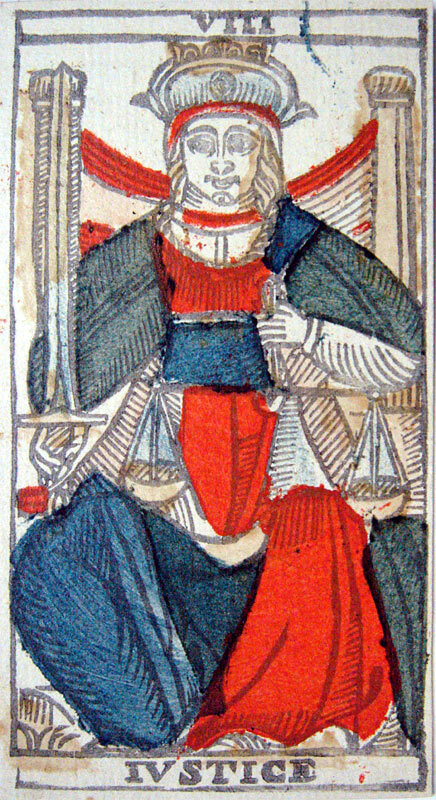 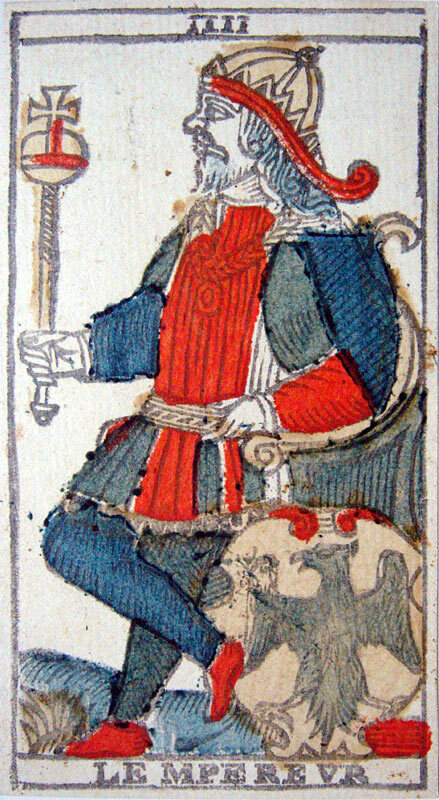 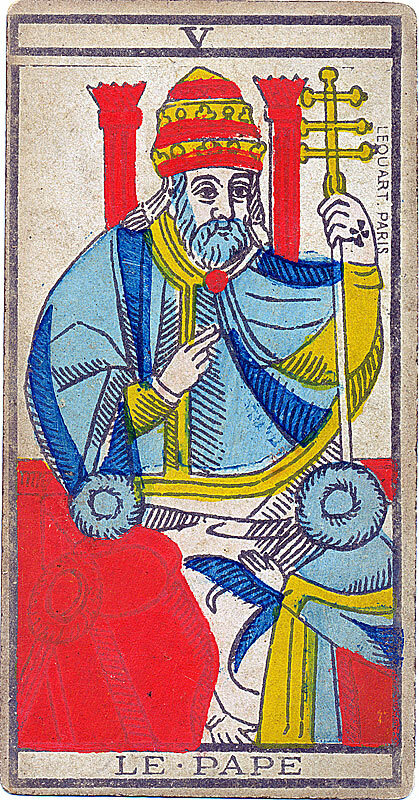 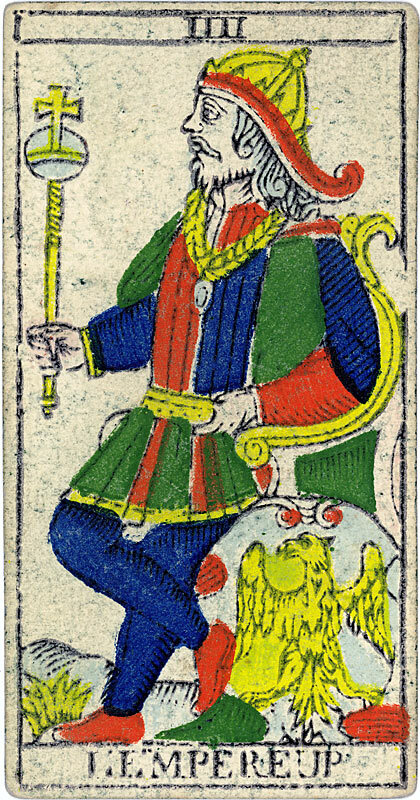 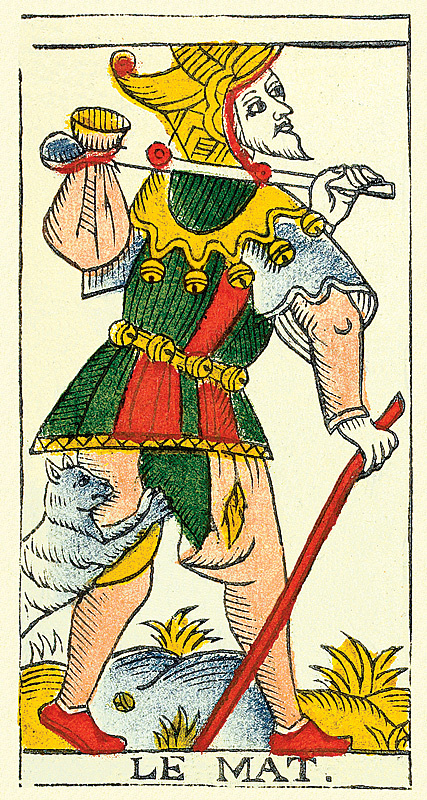 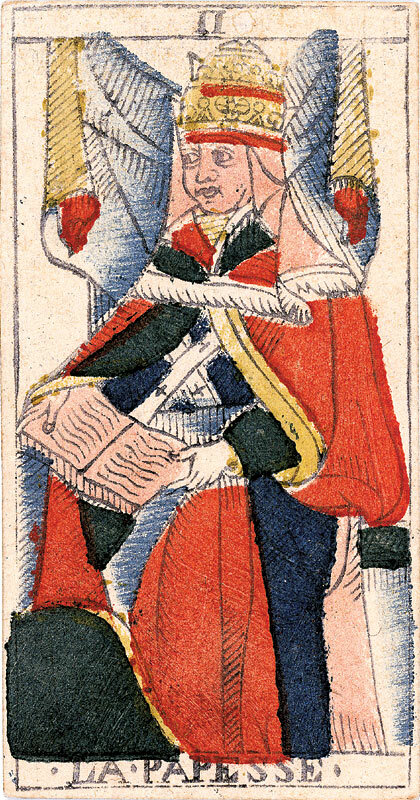 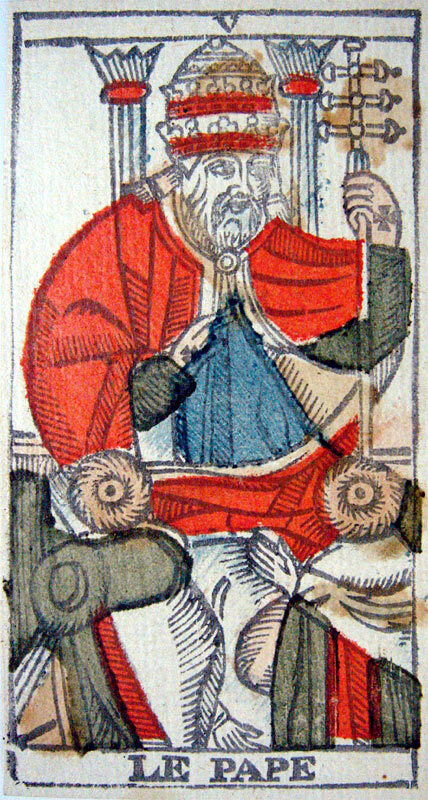 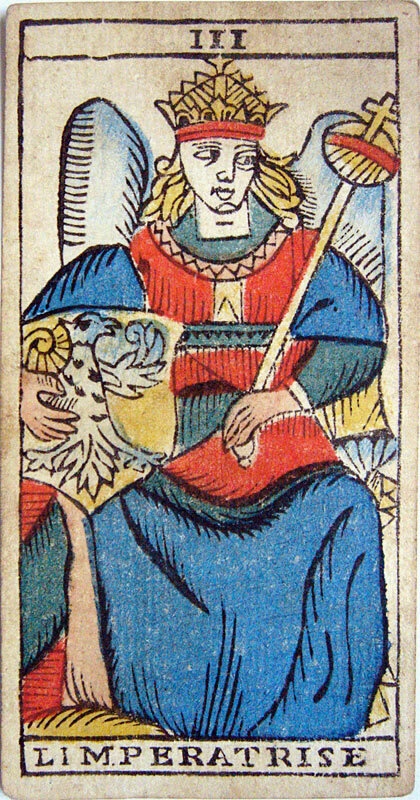 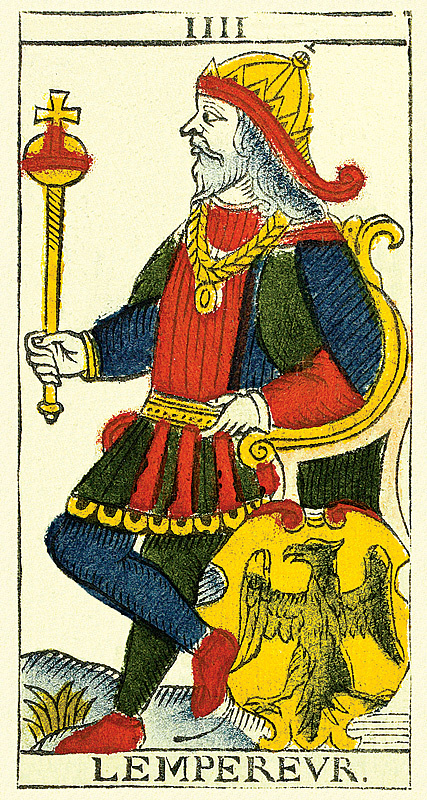 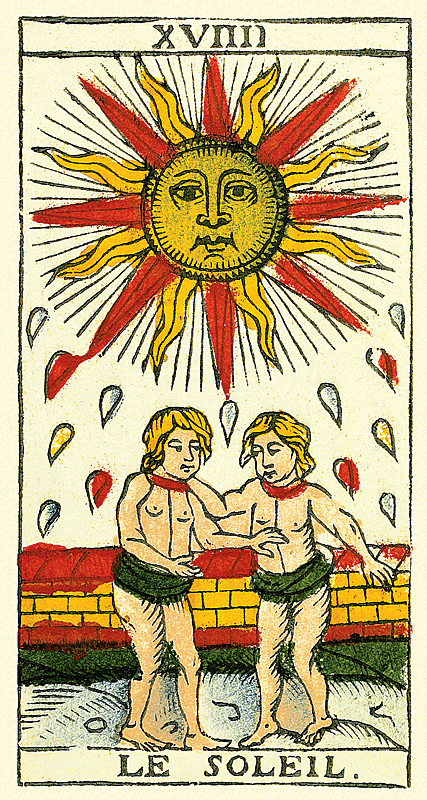 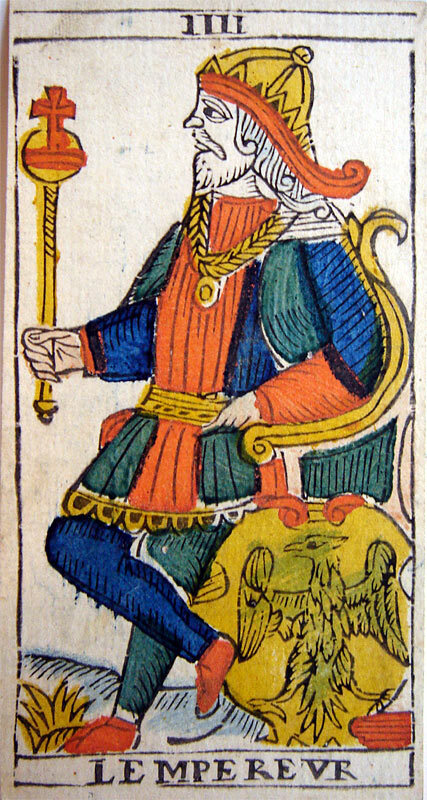 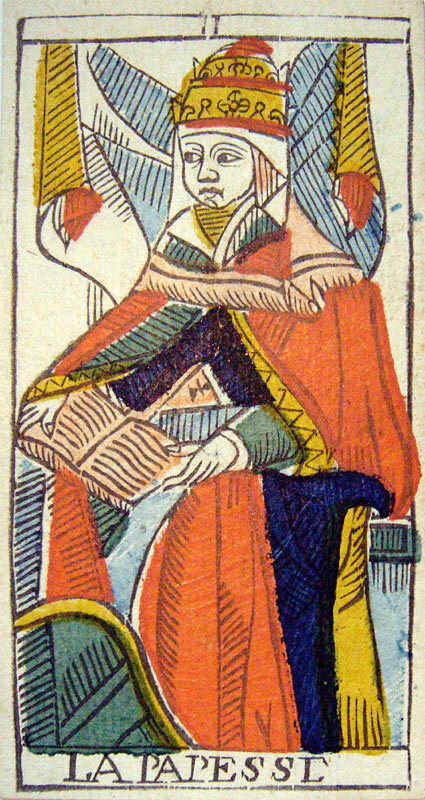 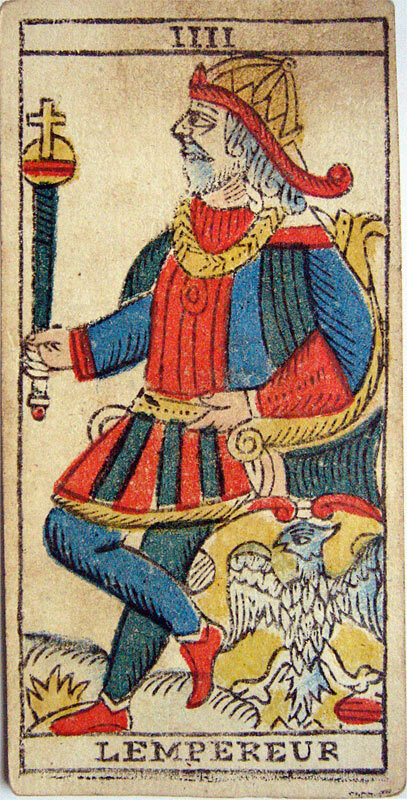 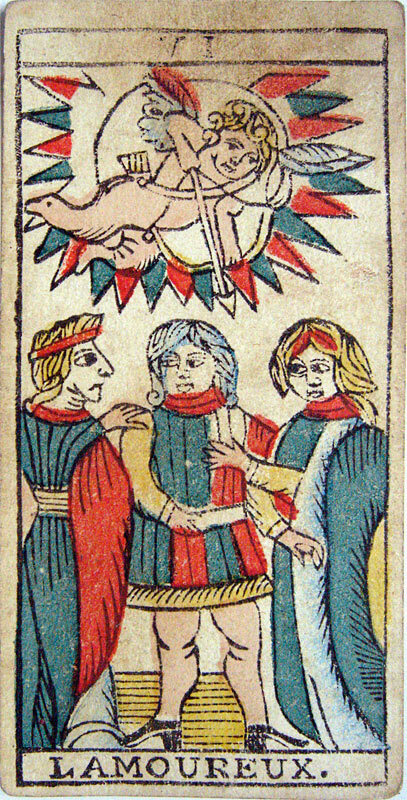 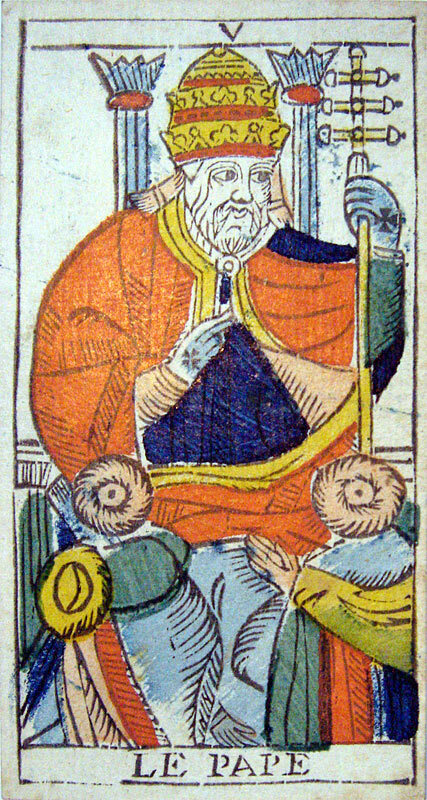 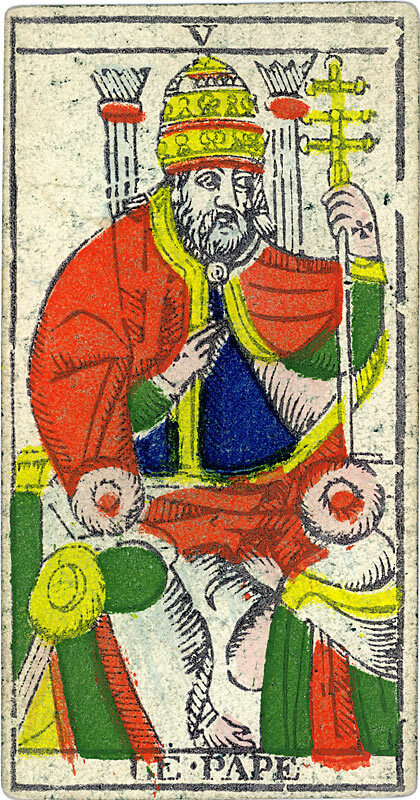 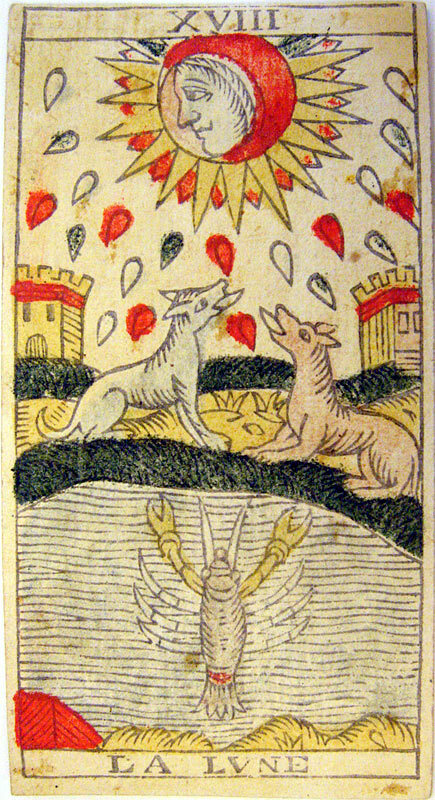 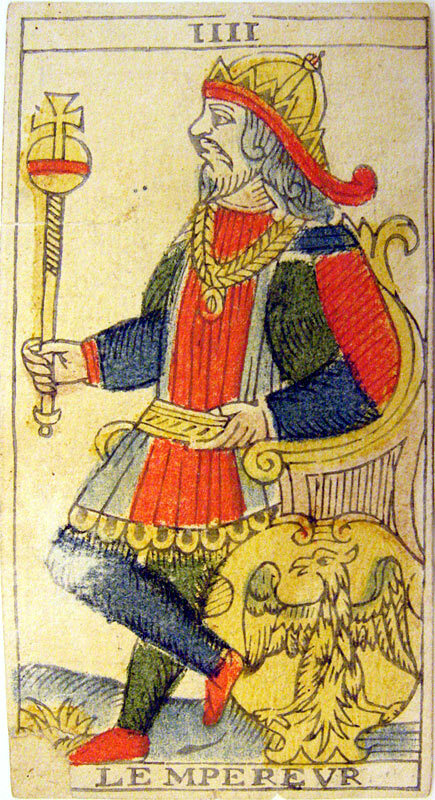 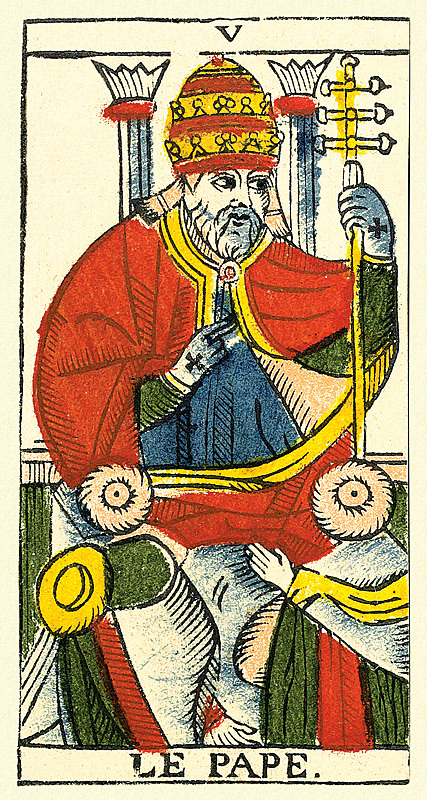 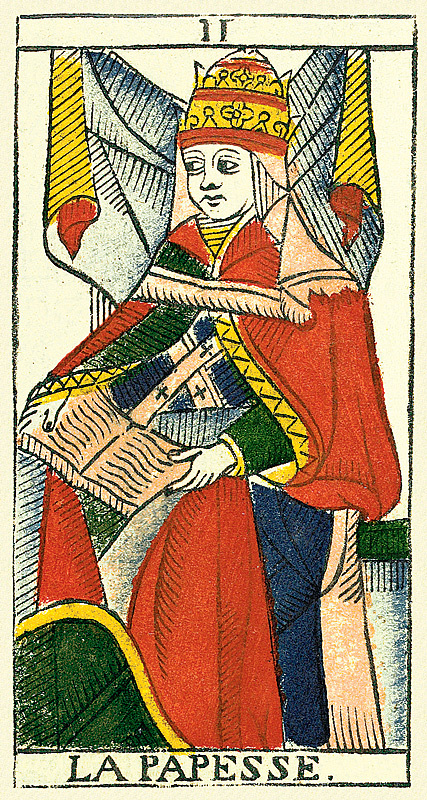 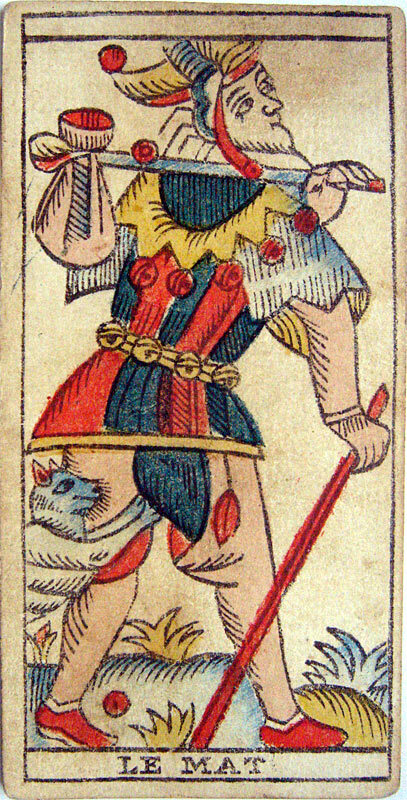 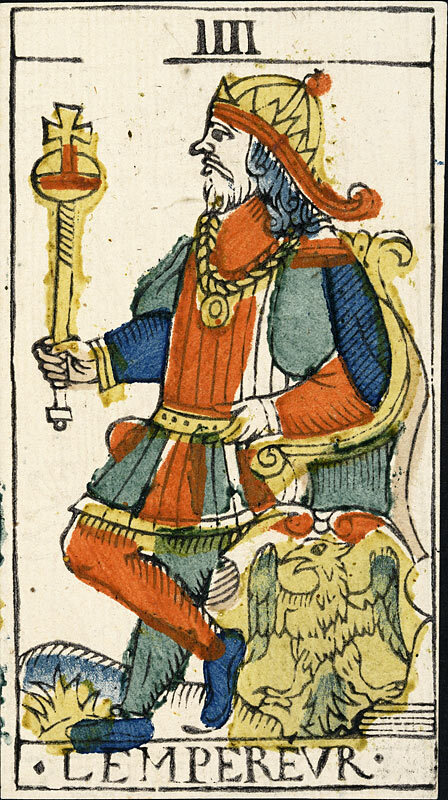 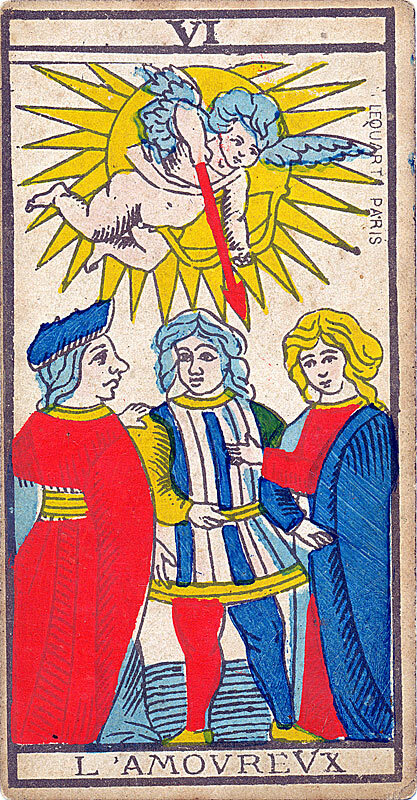 Besides, the fact that the Tarot of the son preserved certain details missing in the Tarot of the father, implies that the first one had at his disposal ancient editions, and that the publishing of the second, although it is the oldest tarot of Marseilles referenced by its category, does not constitute an original model, but resumes a model dating at least of the XVIIth century. 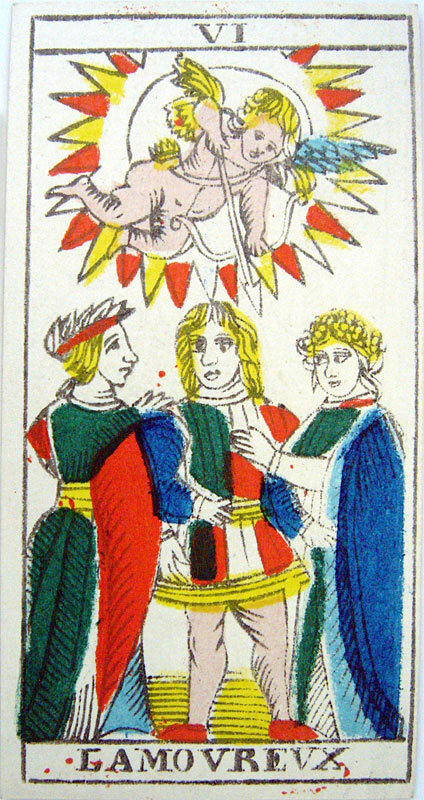 This example, among the others, reminds that one should not confuse the historic anteriority of a deck with the originality of the model. 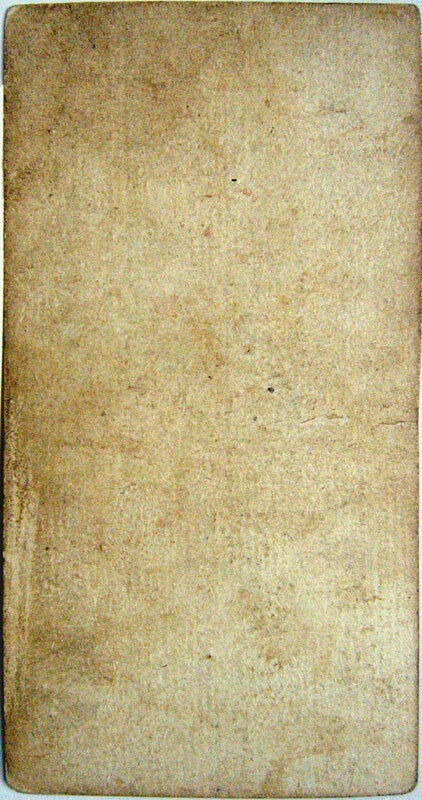 The copy presented here is preserved in the Swiss national Museum of Zurich, Switzerland. 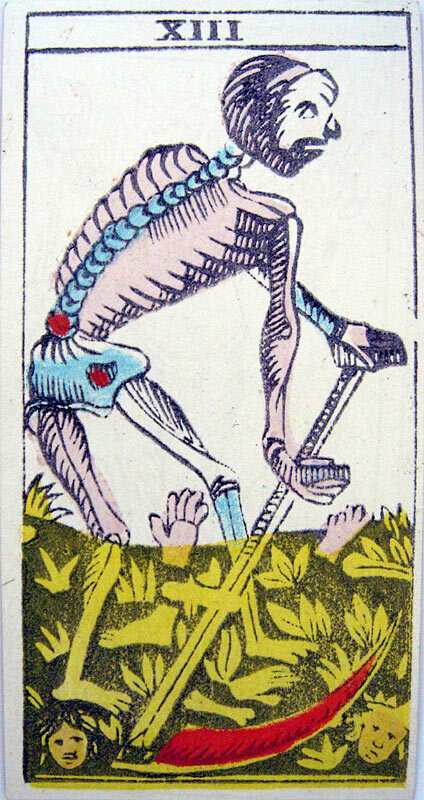 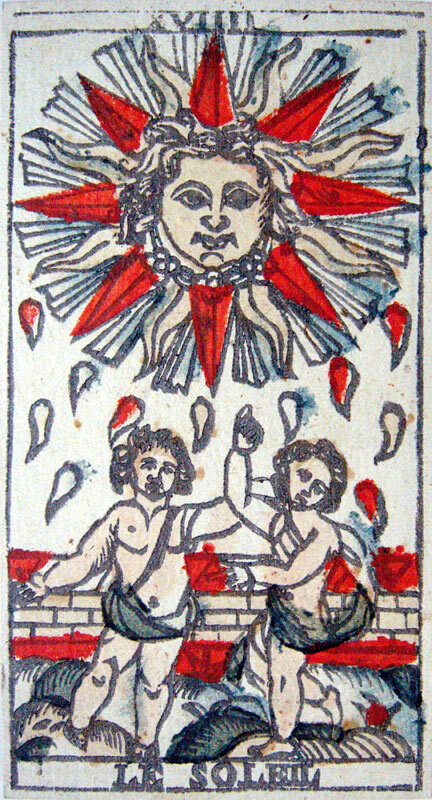 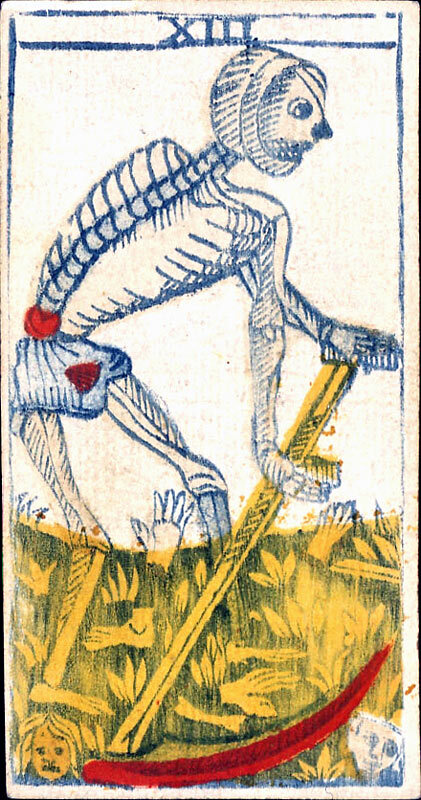 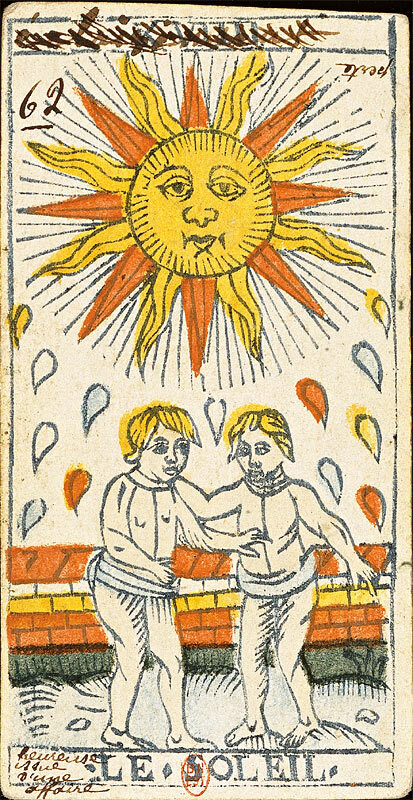 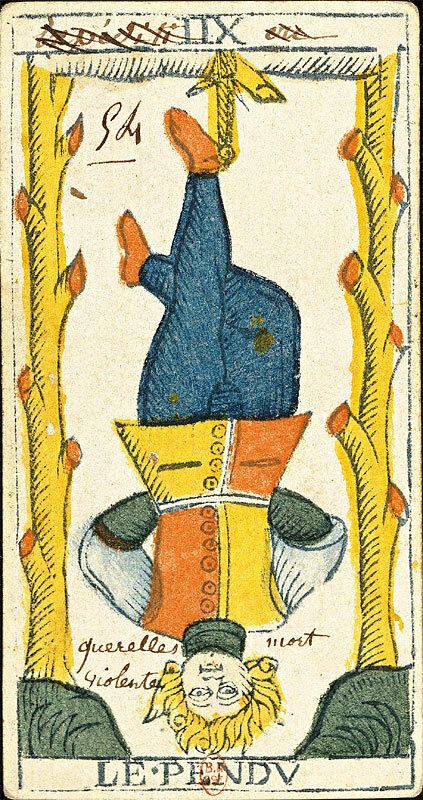 This Tarot was realized in Marseilles around 1745, by the son of Jean-François Tourcaty, also master cardmaker in Marseilles. 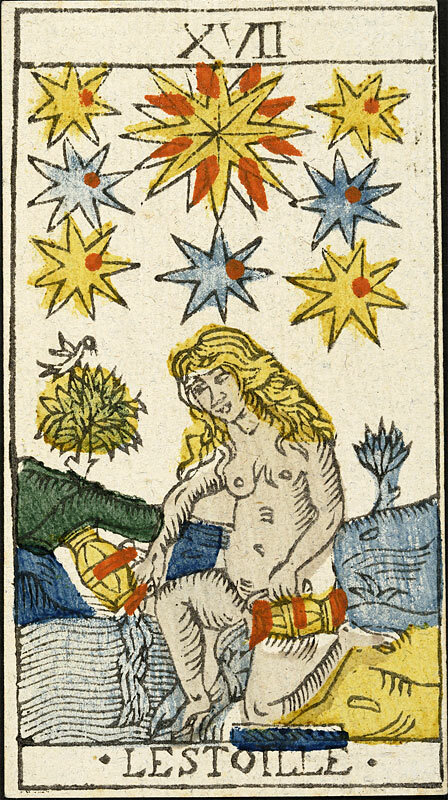 The copy presented here, preserved in the Bibliothèque Nationale de France (BNF french national library), Paris, constitutes a late edition of this deck. 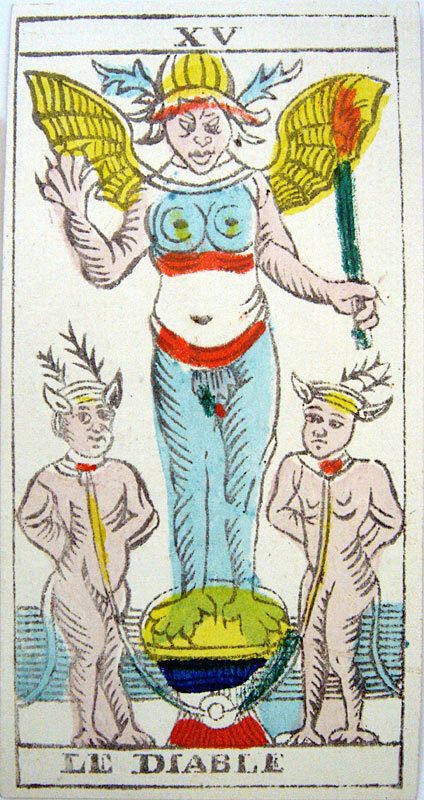 Indeed, as shows its vandalized figures, it was printed after the French Revolution. 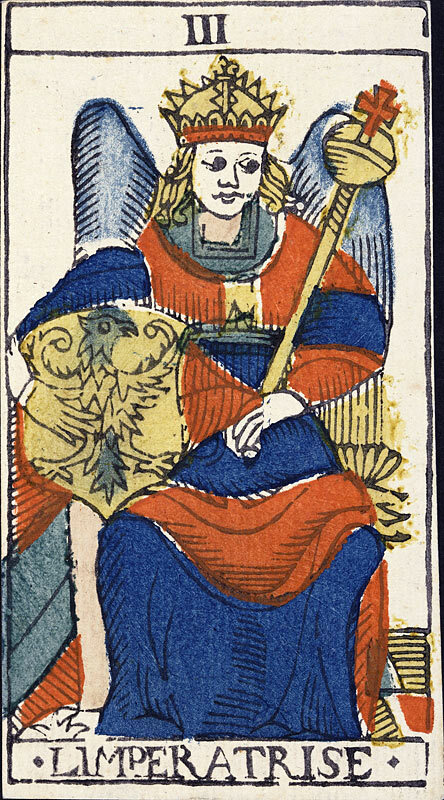 This one indeed opposed to all which related to religion and kingship. 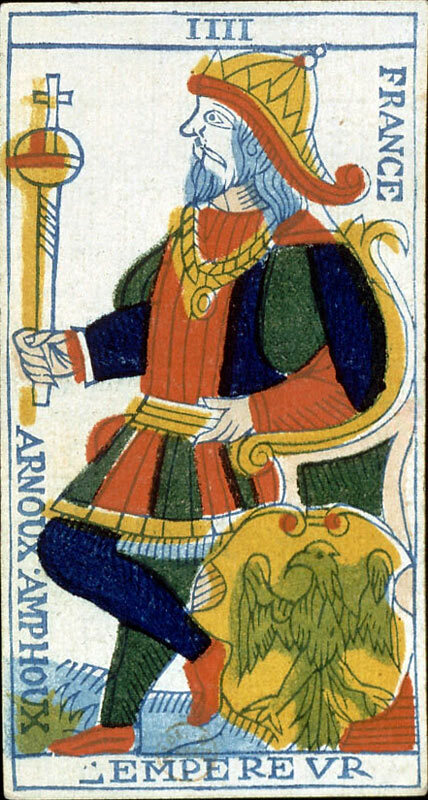 So, the connoted names, the crowns, the crosses, and the other imperial signs were systematically removed from the moulds. 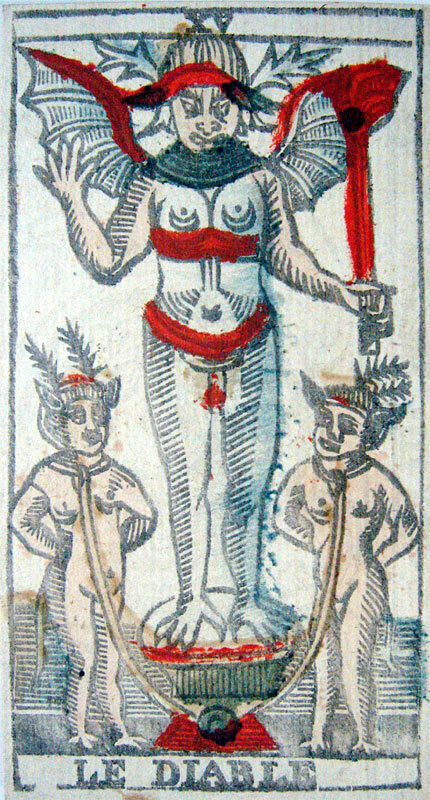 Oddly enough, only the religion connoted name LE DIABLE (the Devil) was preserved. 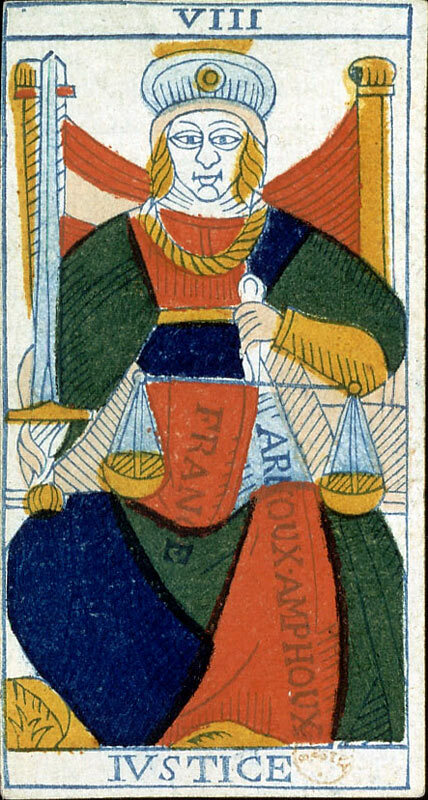 Is this omission significant ? 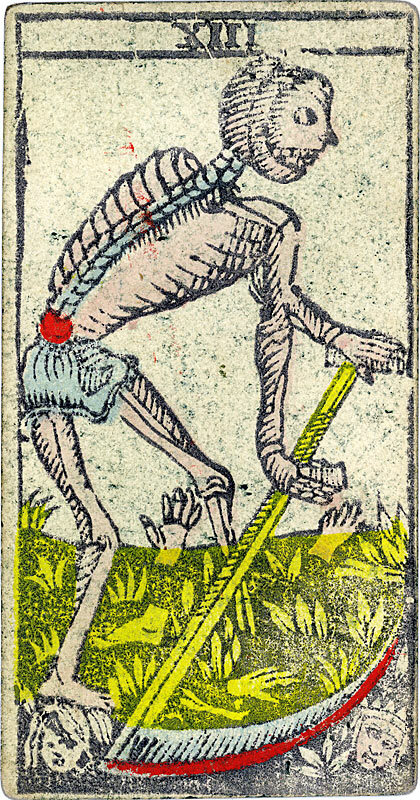 Be that as it may, if the engraving of the Tarot of François Tourcaty is rather unrefined, this deck is very precious. 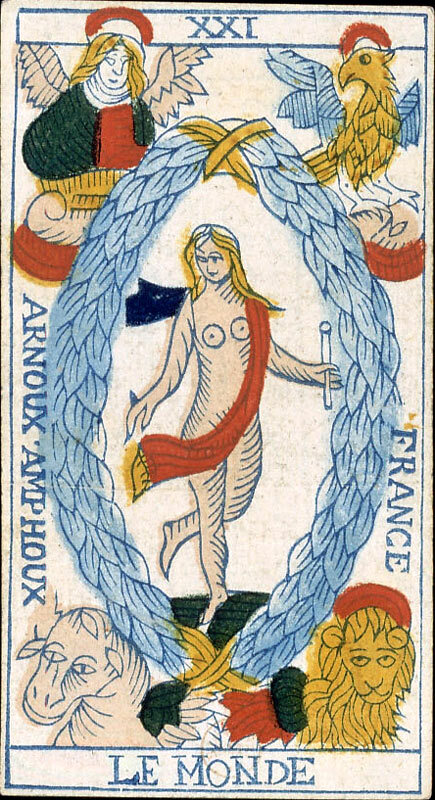 Indeed, besides the fact that it is the oldest known Tarot having preserved the phœnix in IIII of Disks and in II of Cups, it is one of the rare Tarots realized in Marseilles preserved. 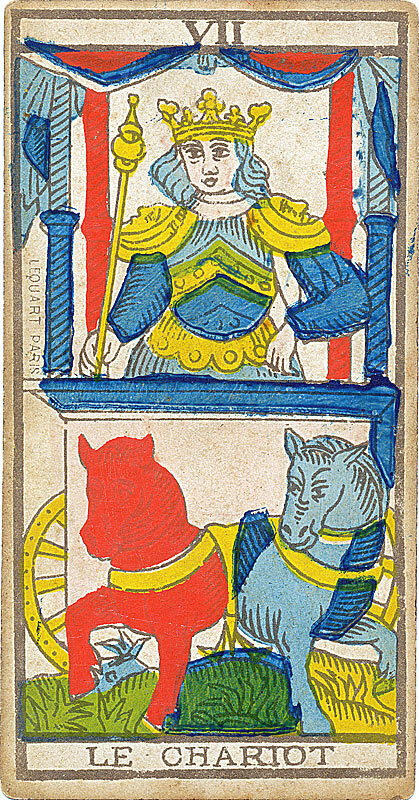 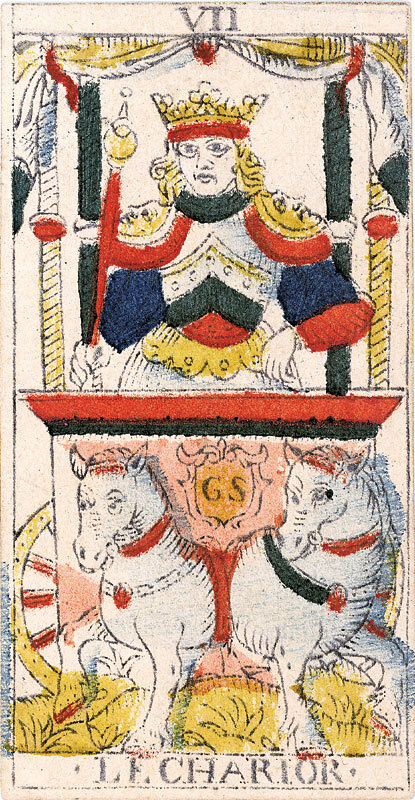 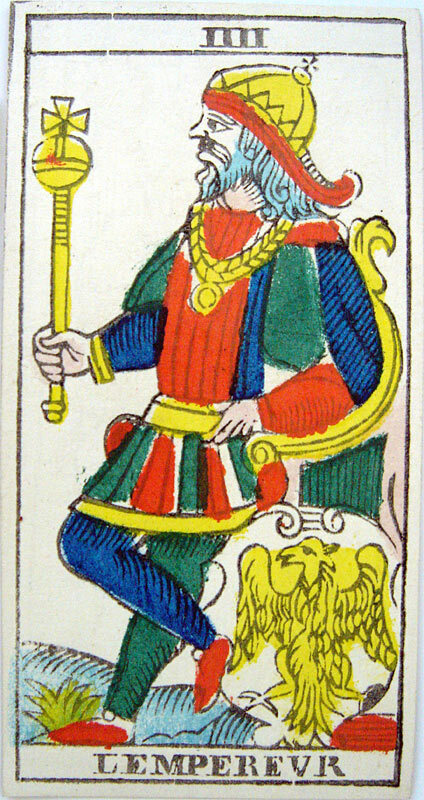 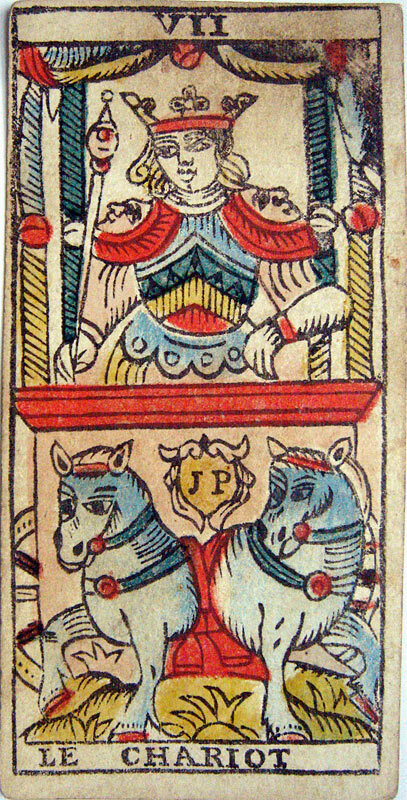 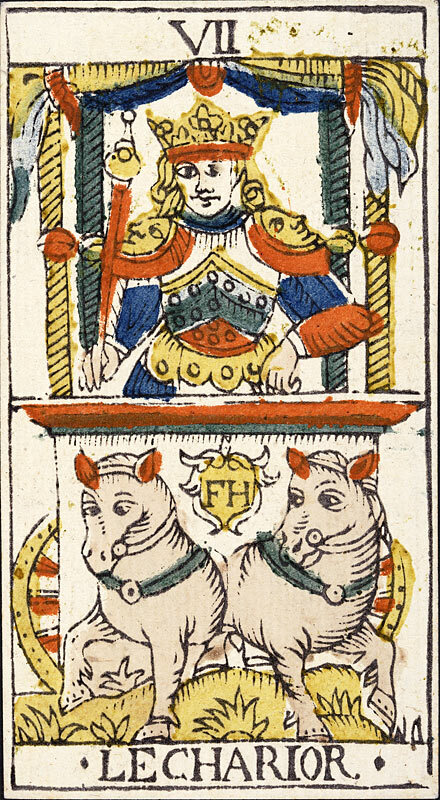 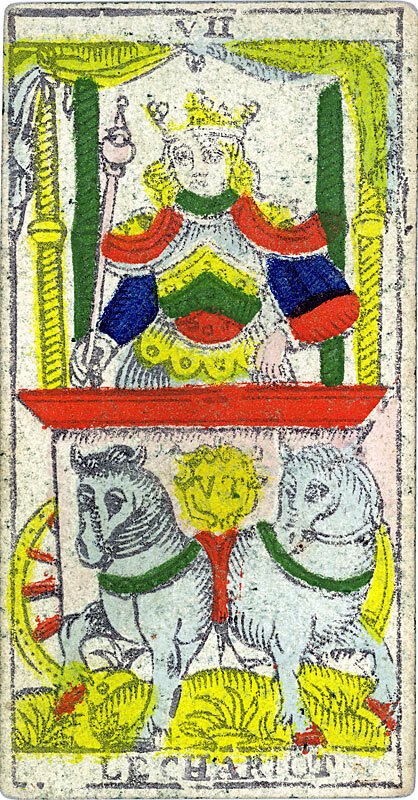 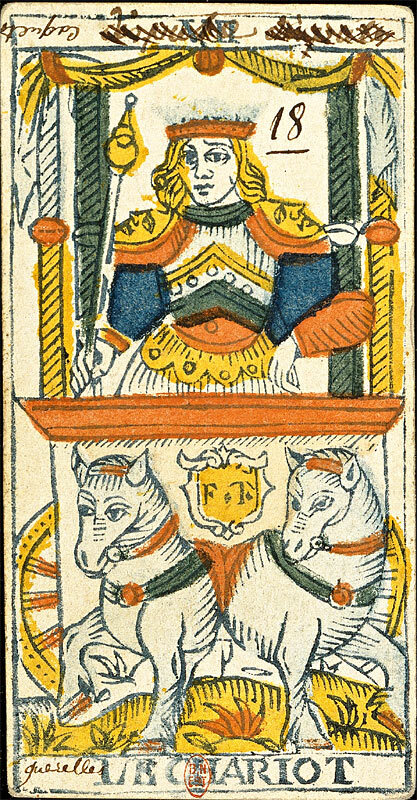 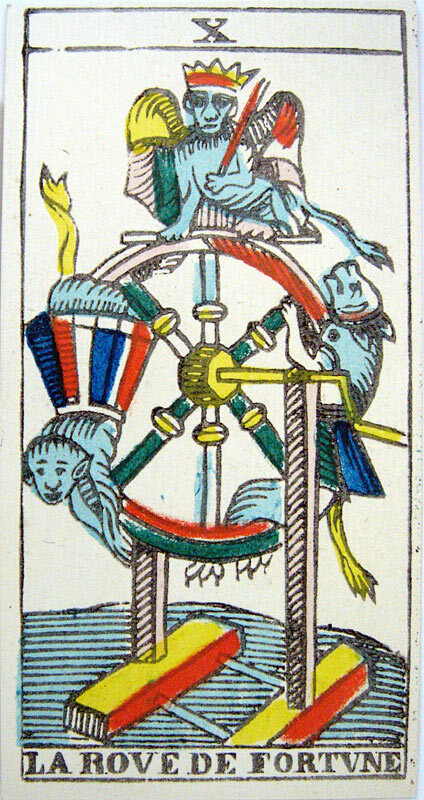 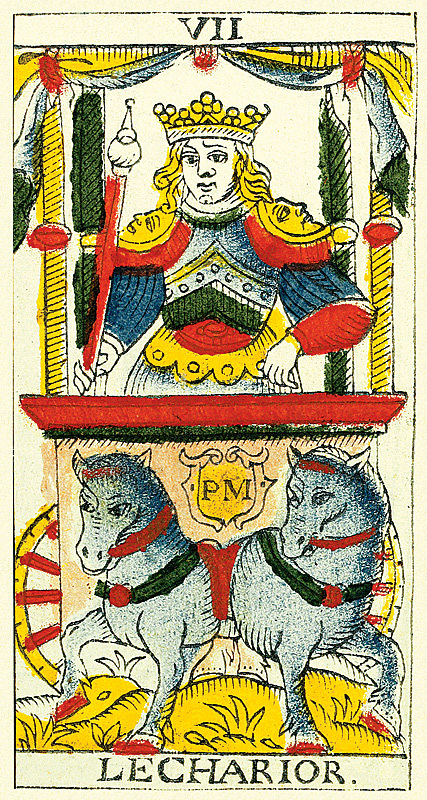 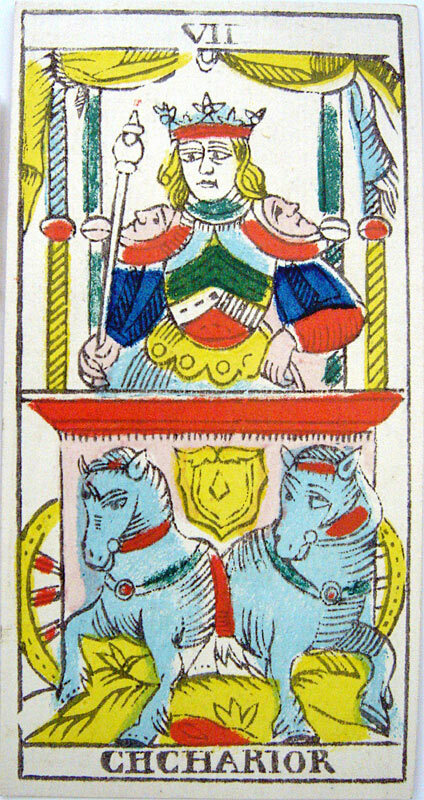 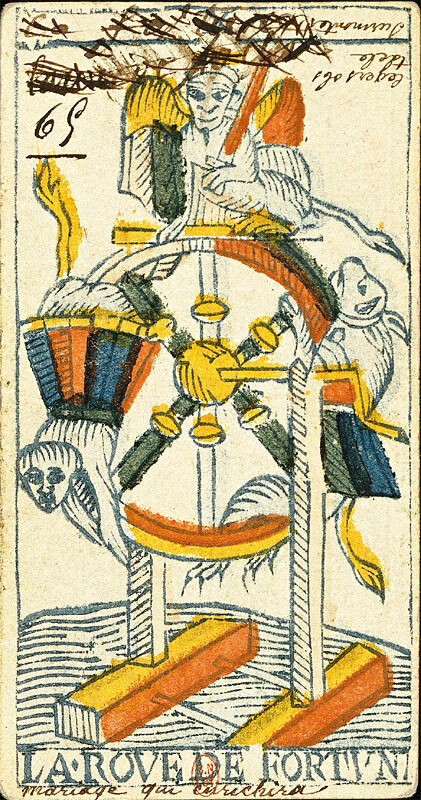 On the other hand, this deck is characteristic of a certain break with the tradition as far as, besides the evident decline of the traditional iconography of the Arcana, certain cards have their traditional name altered (LE CHARIOT instead of LE CHARIOR, LETOILLE instead of LESTOILLE (ancient Provençal word of the XIVth century) while preserving all the Vs for Us and Is for Js. 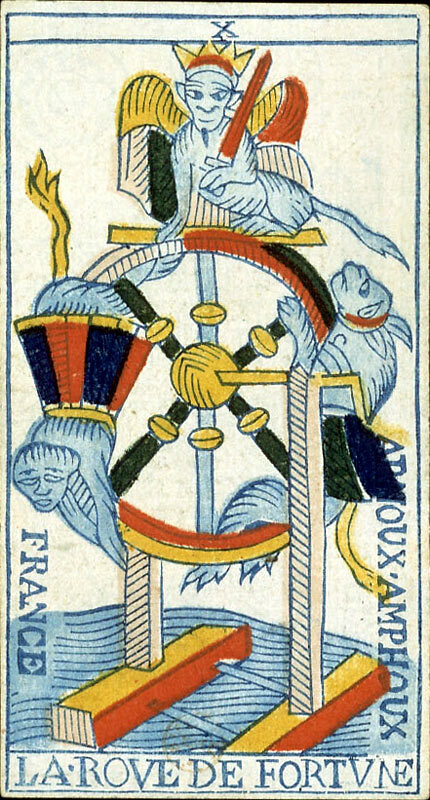 It is afterward, as we shall see lower, in particular with the Tarot of Nicolas Conver, realized in Marseilles in 1760, that the names were really altered, and that their alphabet was definitely modernized. 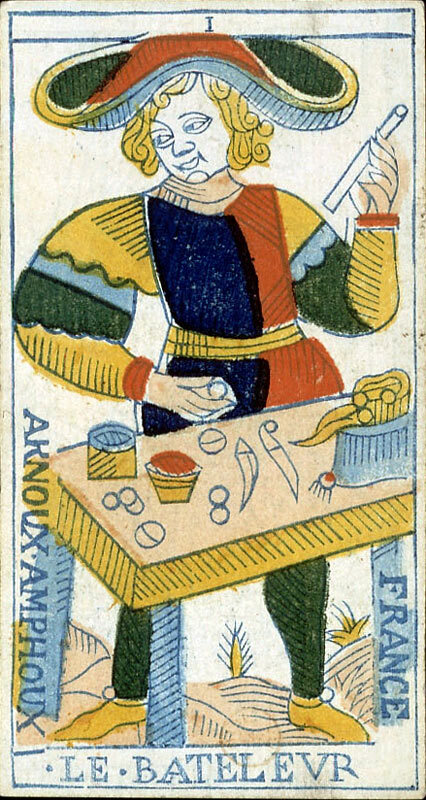 For anecdote, according to Paul Marteau, which possessed this deck (before making donation of his whole collection of decks to the BNF), the handwritten writing on the cards would be of Miss Lenormand, famous fortune-teller of the beginning of the XIXth century. 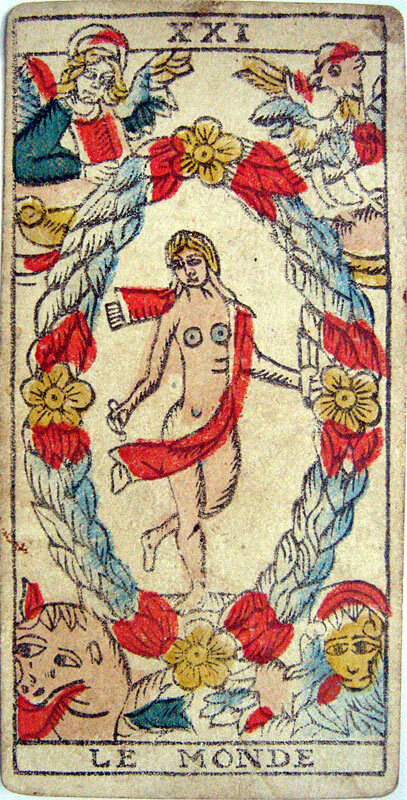 This Swiss Tarot, although altered in some respects, contains details which are precious for iconographic research. 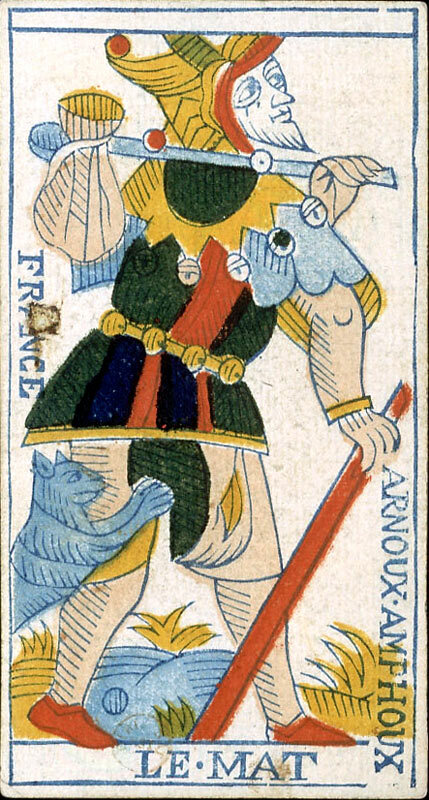 So, as in some other ancient decks, we find the baguette behind and not in the hand of the character of the Arcana I LE BATELEVR, the naked foot of the character of the Arcane XII LE PENDV (clear in some other ancient decks too), the bull of the Arcane XXI LE MONDE with his two horns and its halo, XV TLE DIABLE with his lunar croissants on the breast, the beams of XVIIII THE SUN wide and colored, etc. 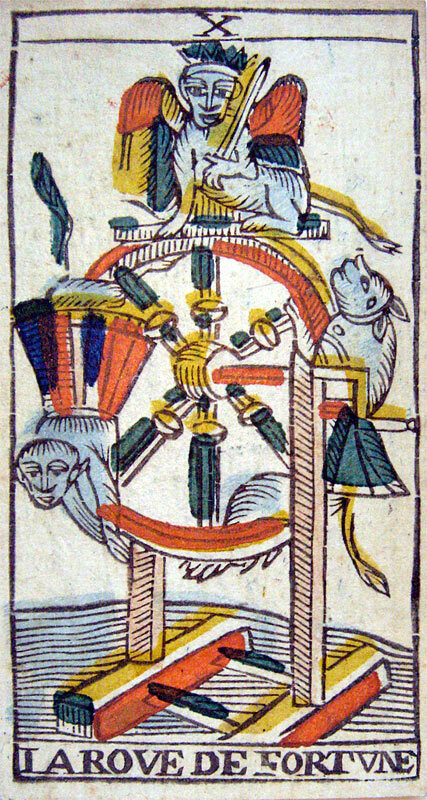 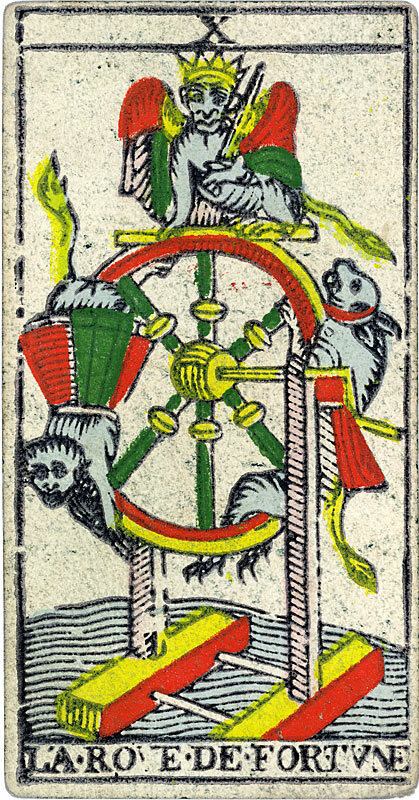 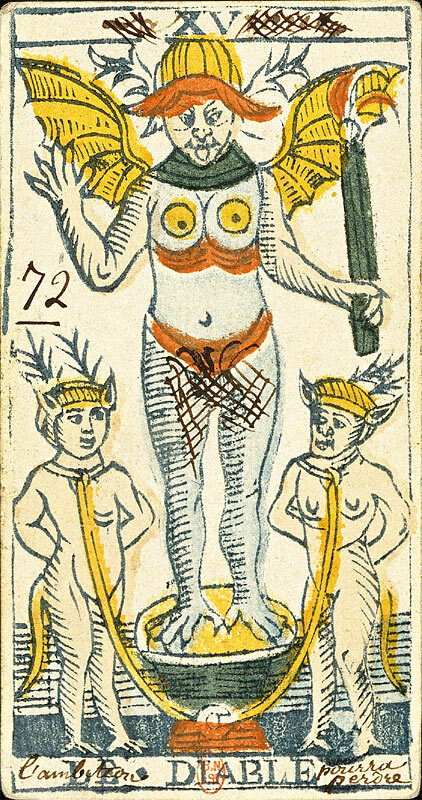 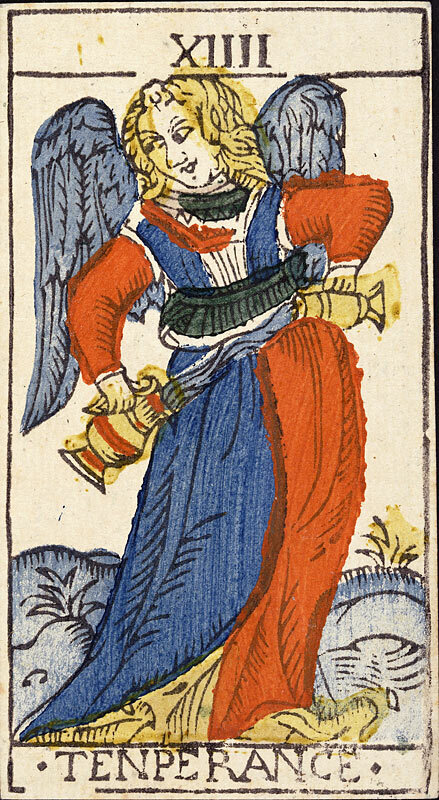 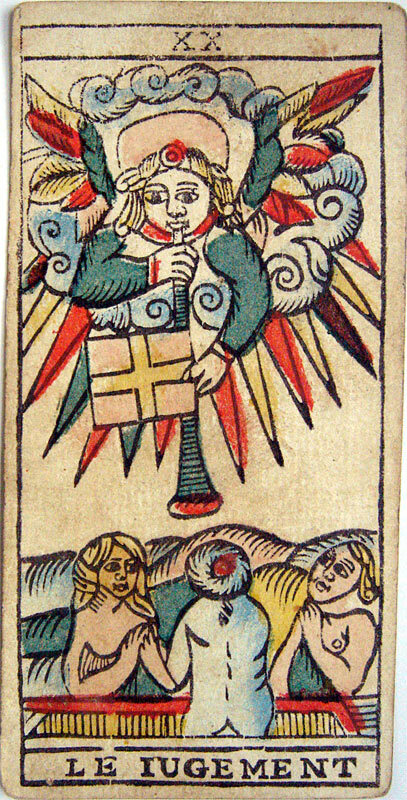 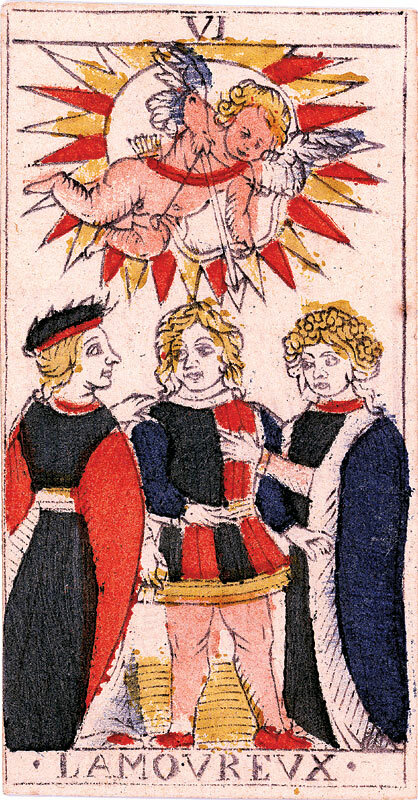 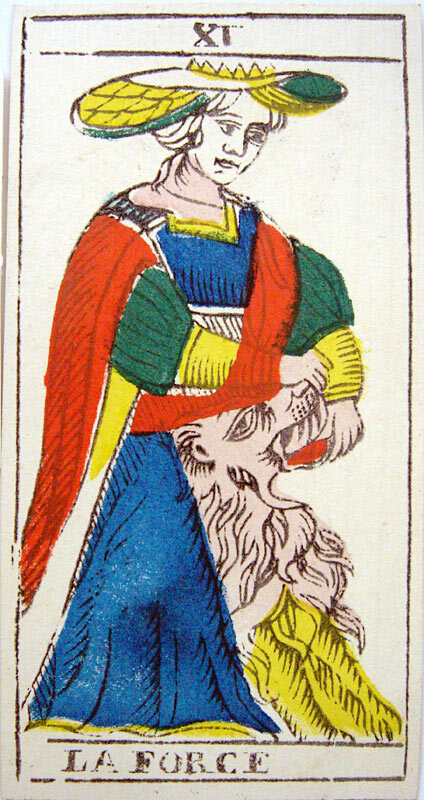 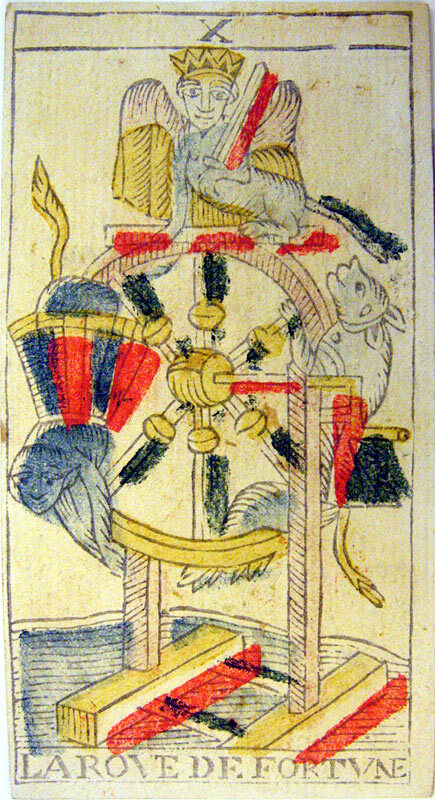 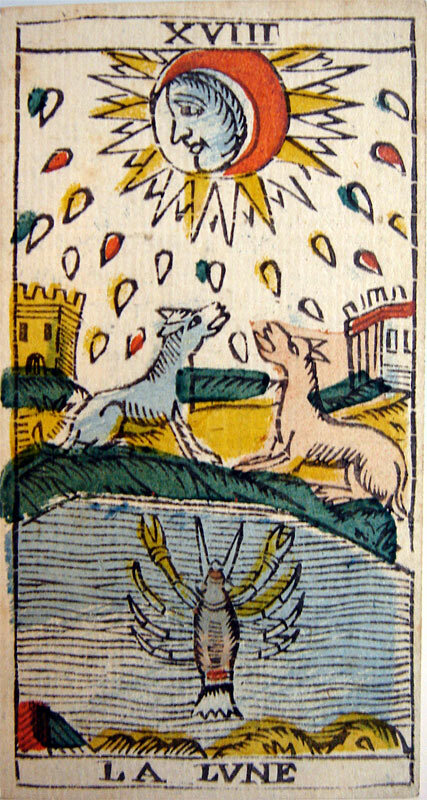 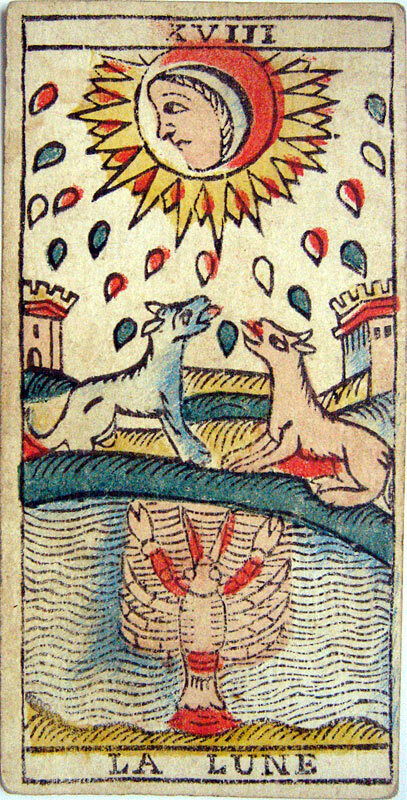 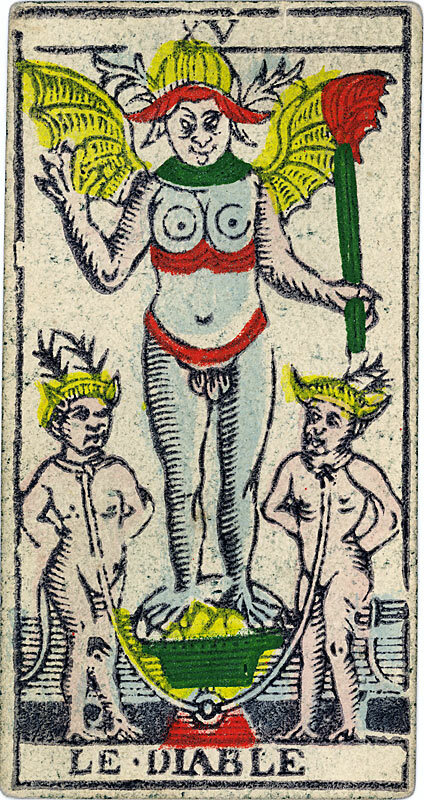 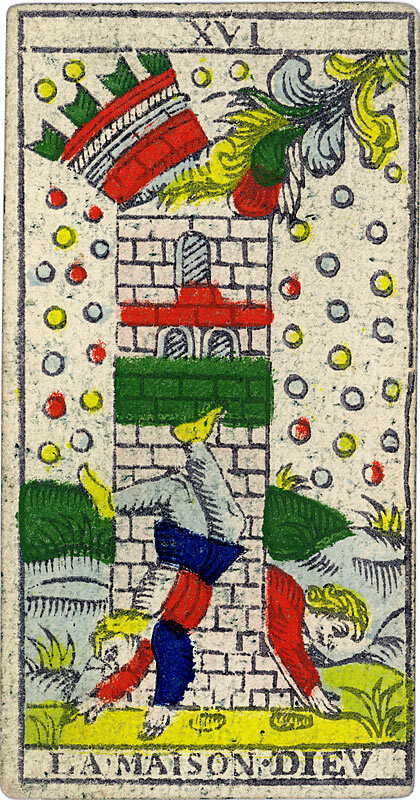 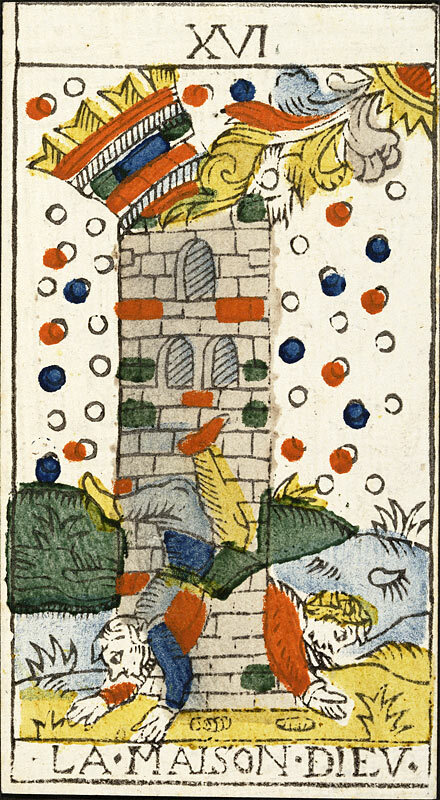 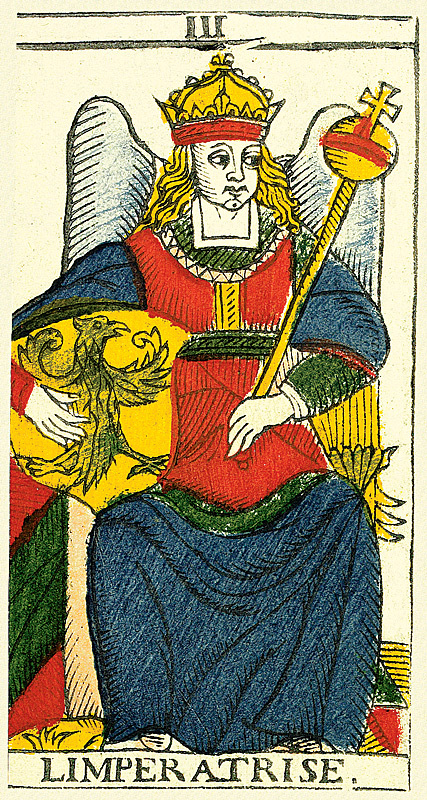 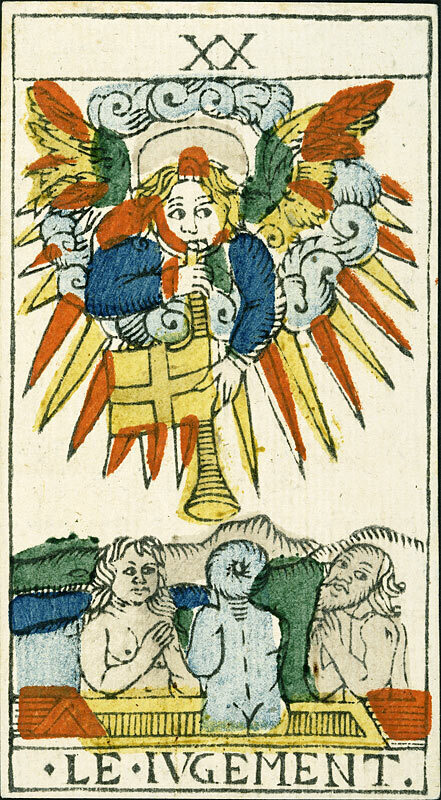 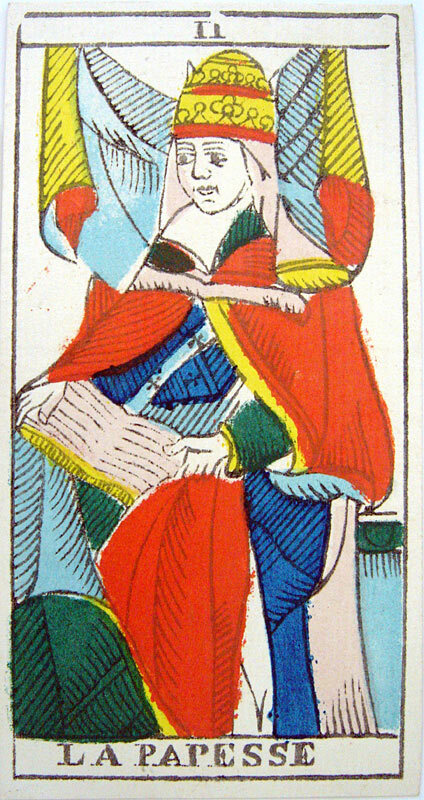 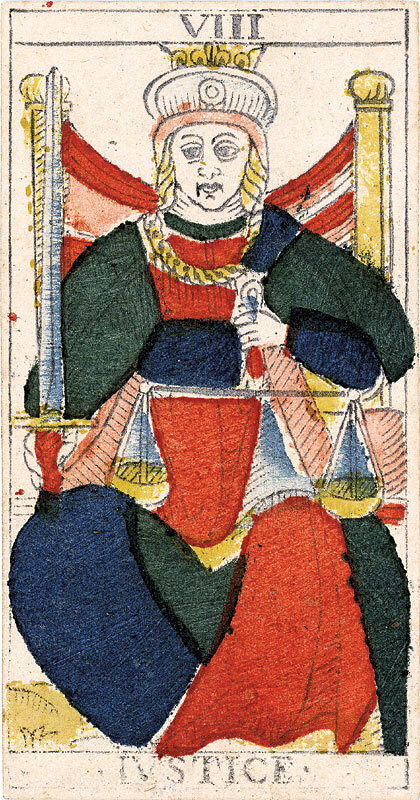 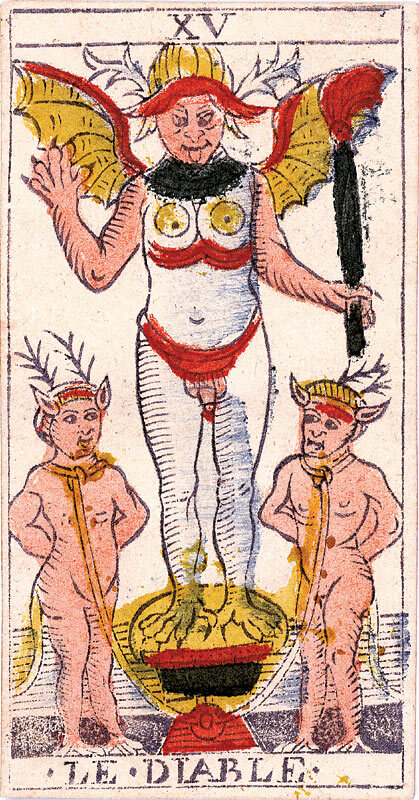 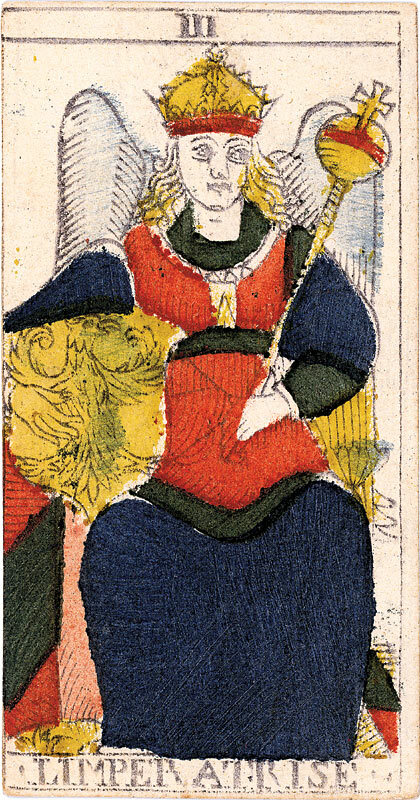 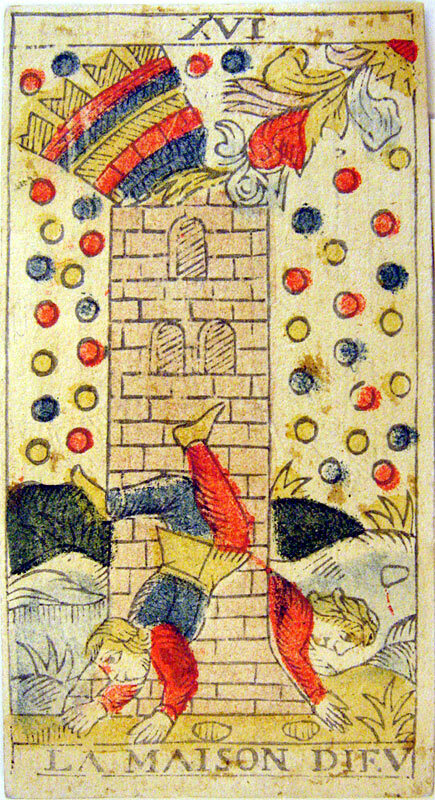 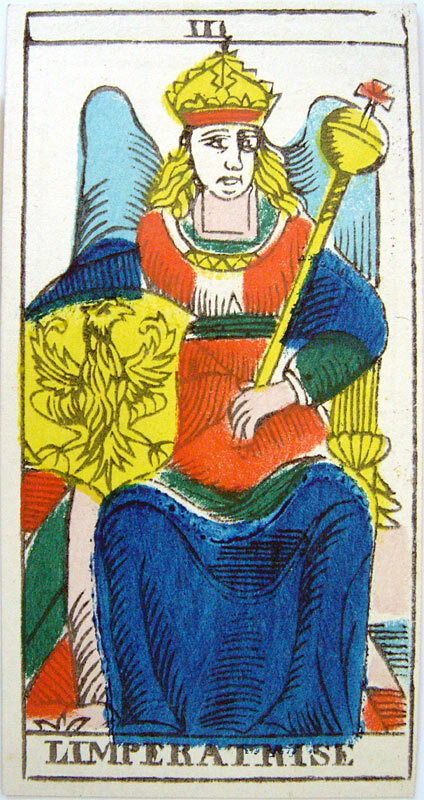 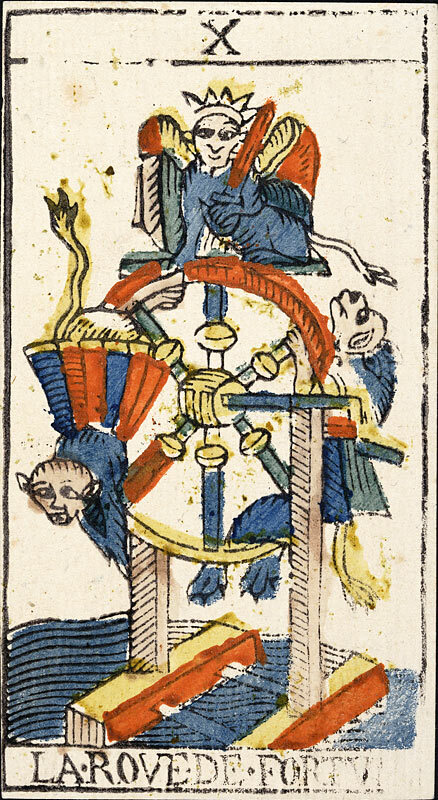 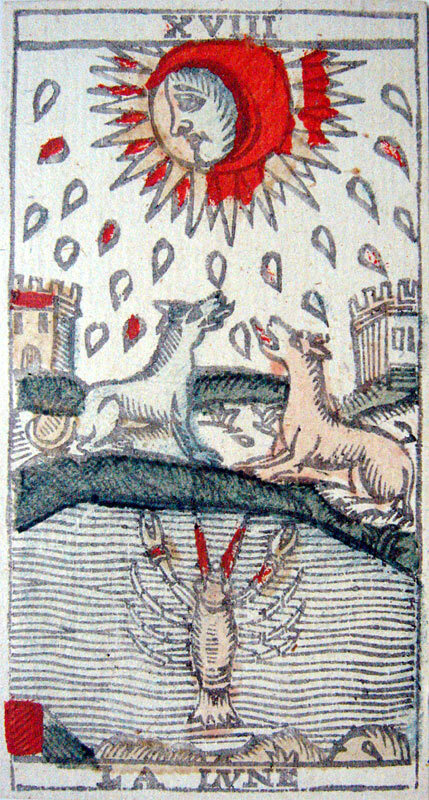 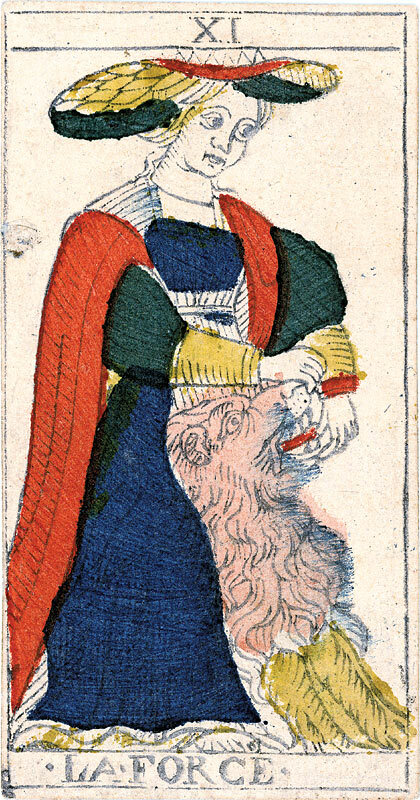 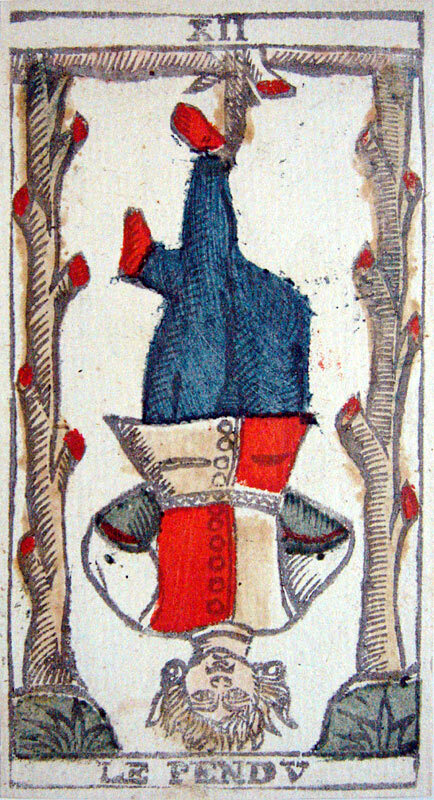 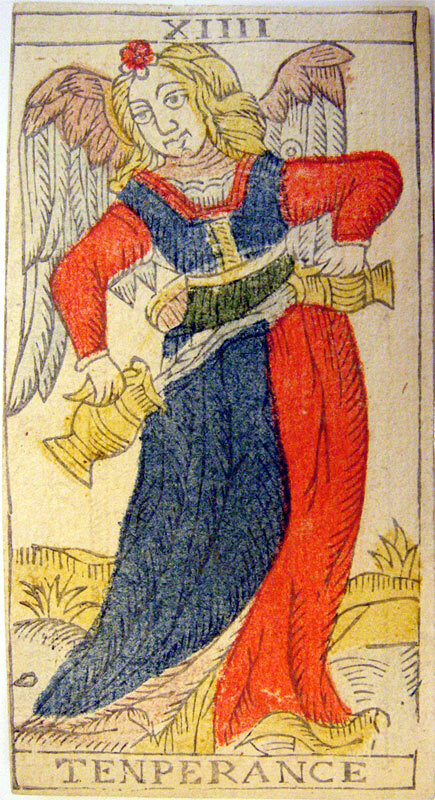 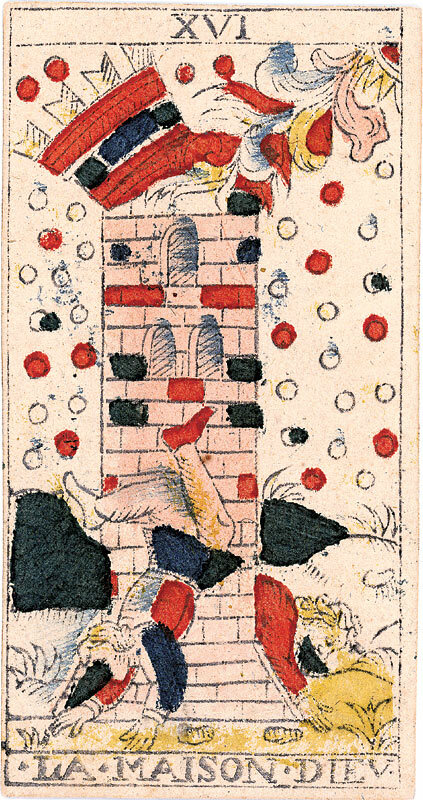 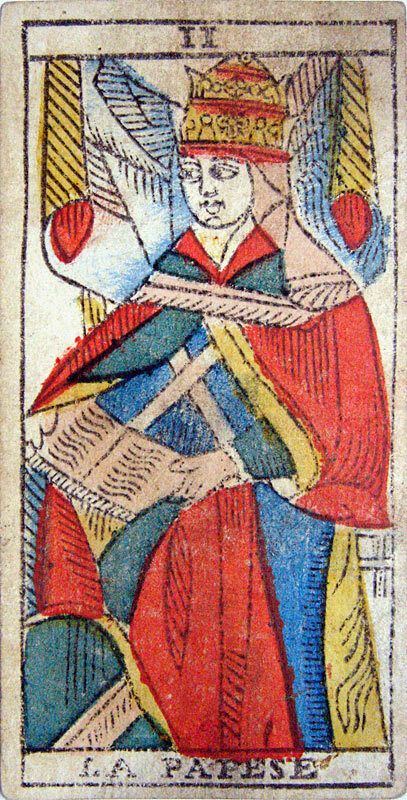 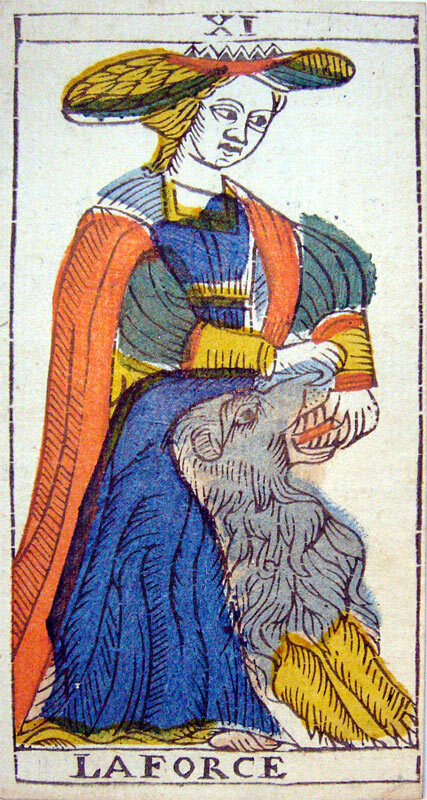 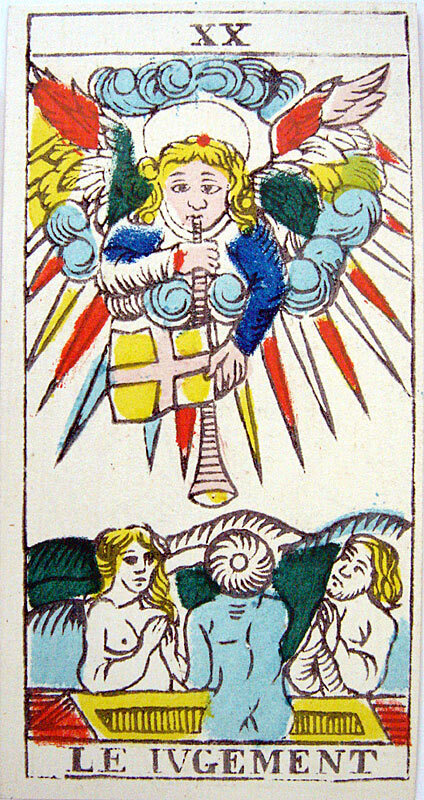 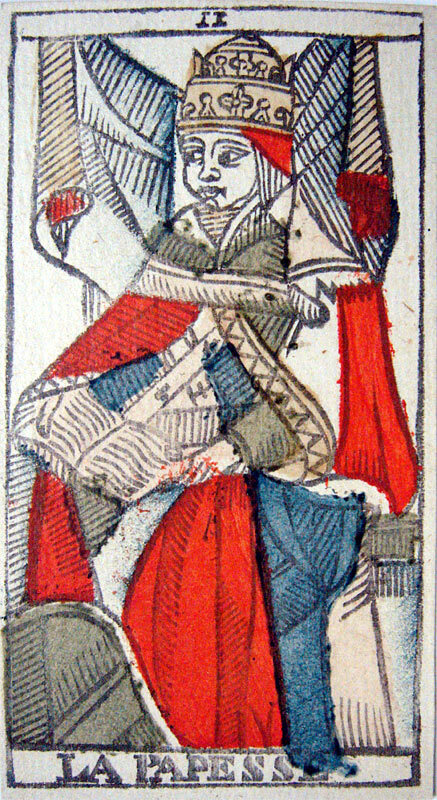 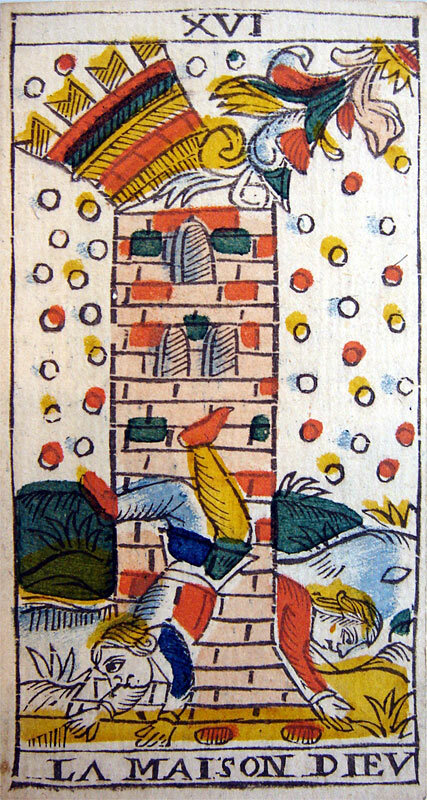 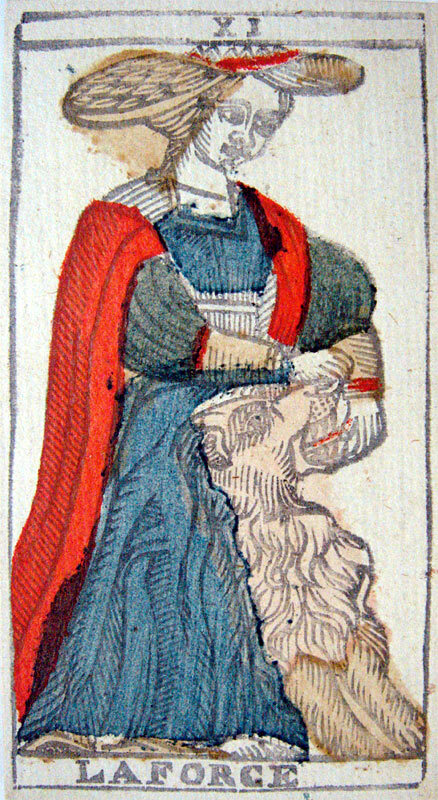 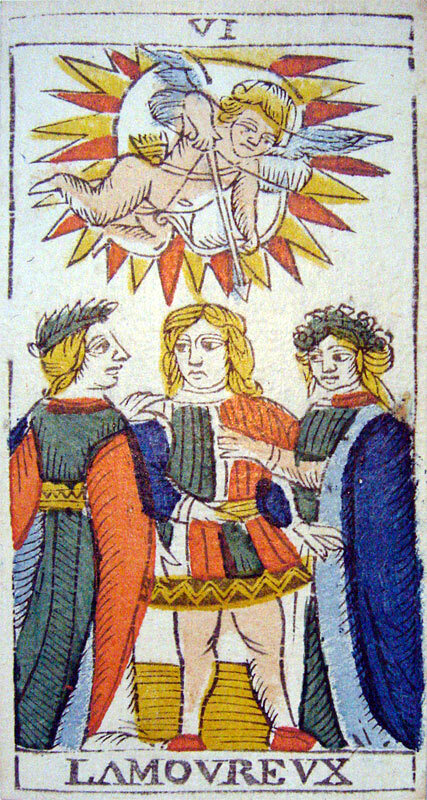 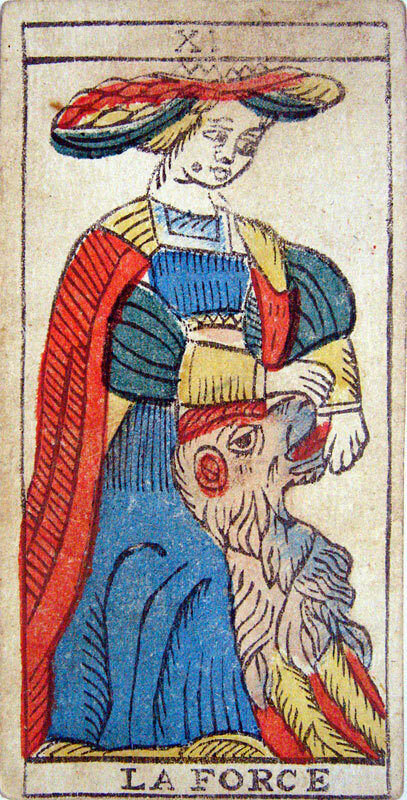 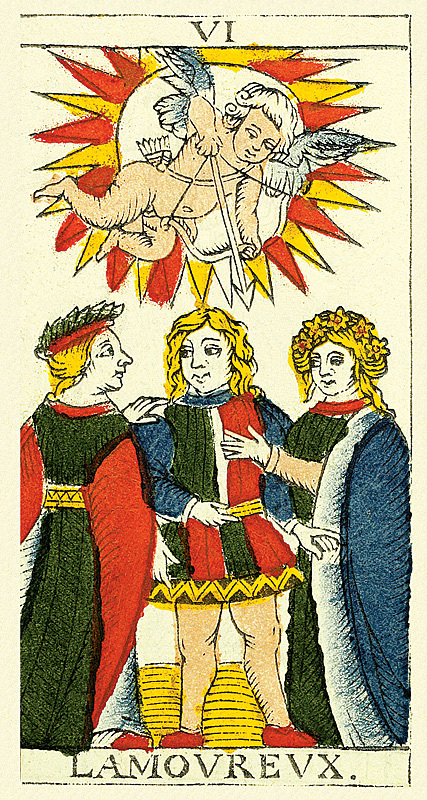 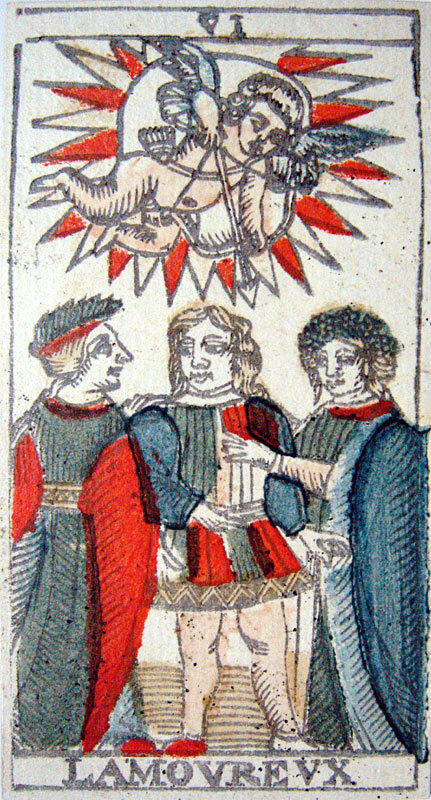 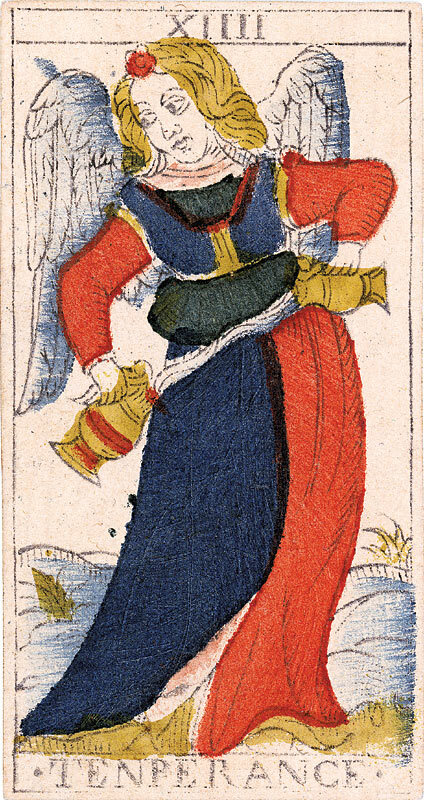 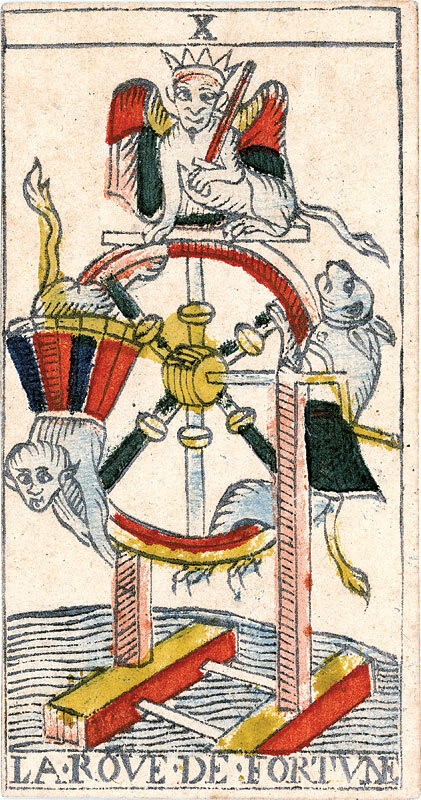 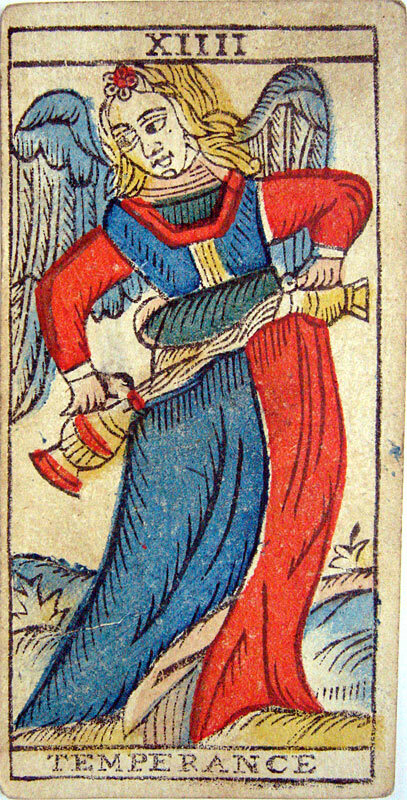 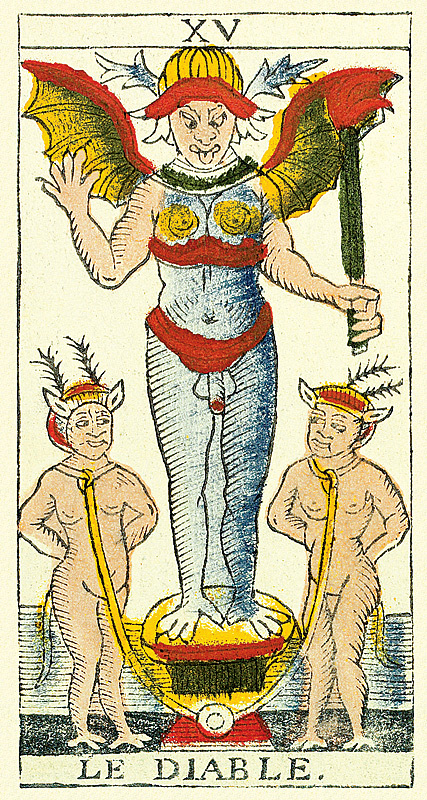 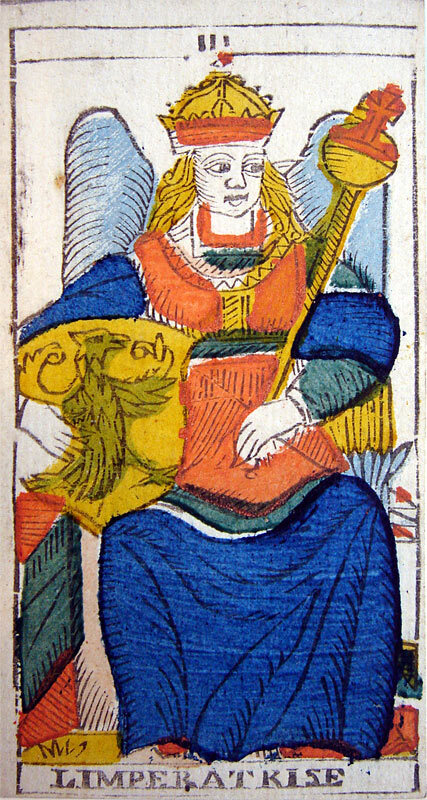 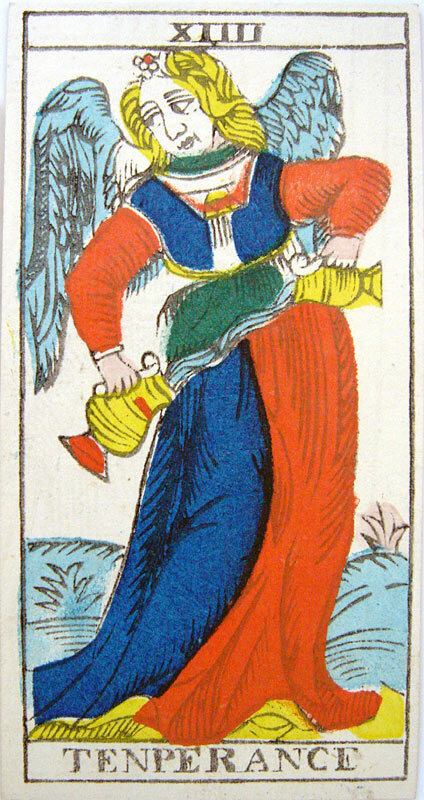 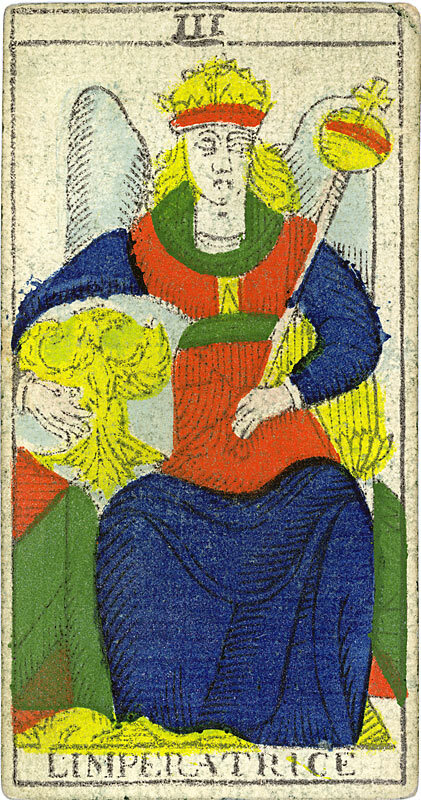 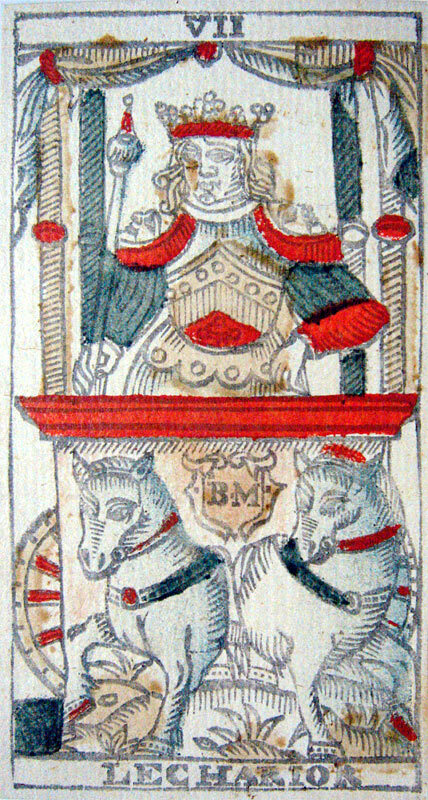 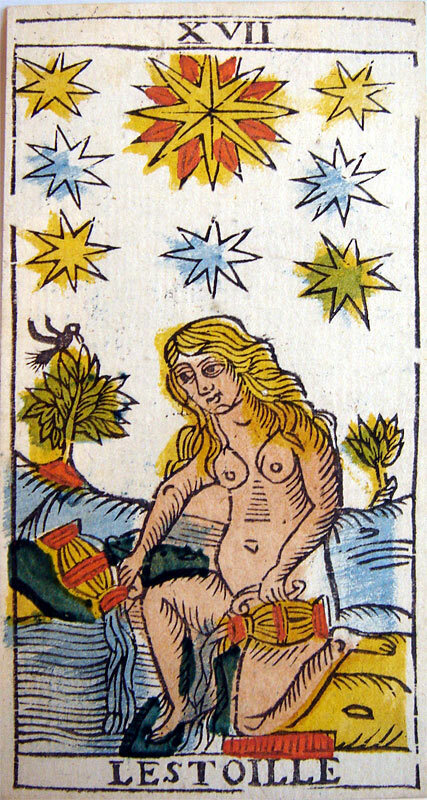 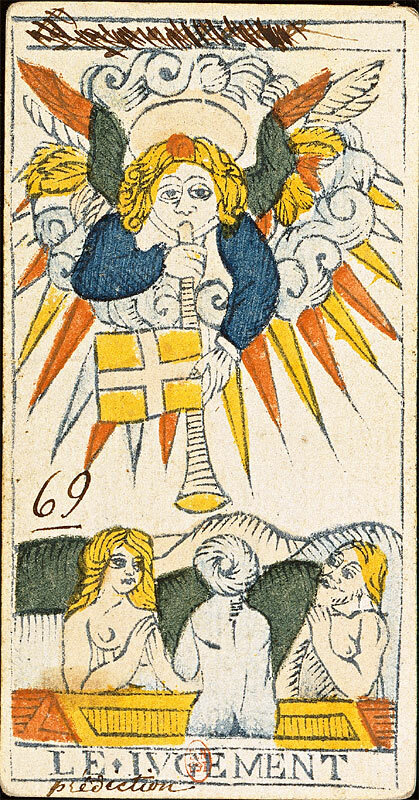 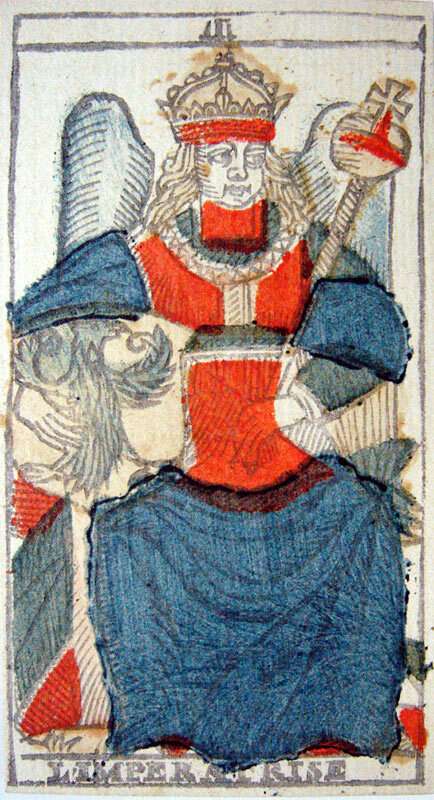 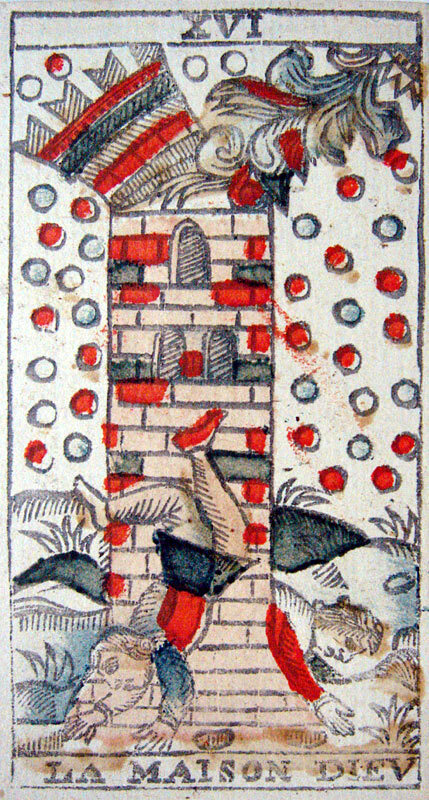 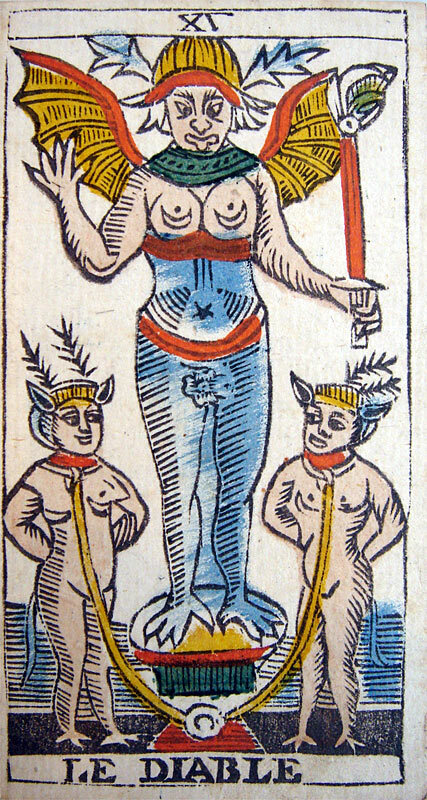 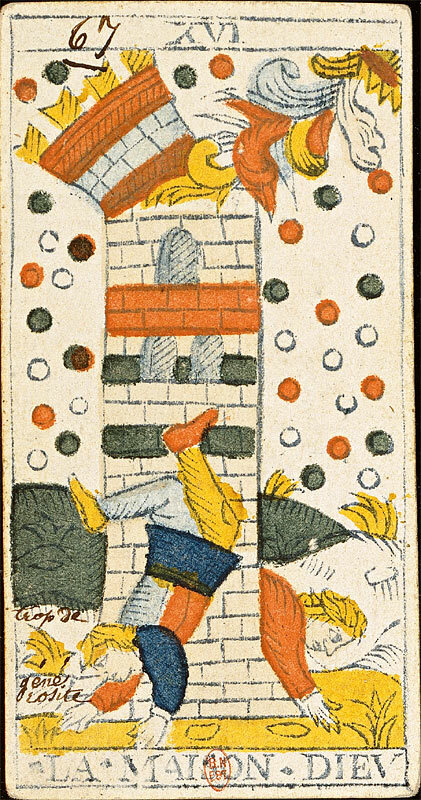 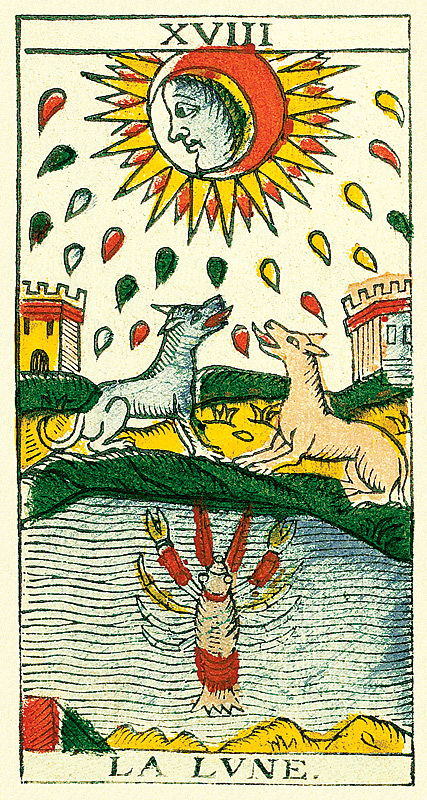 Switzerland, situated between Germany and Northern Italy, so produced Tarots, which, if the known copies are altered on certain points (as the festonnage of the skirt of IIII LEMPEREVR and VI LAMOVREVX), preserved well certain details (as the original names of cards), and no doubt the main part of the traditional cannon of the Tarot said “ of Marseilles ”. 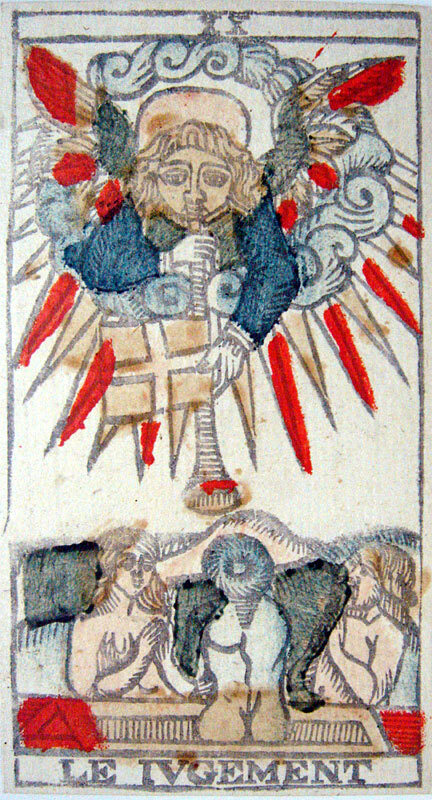 The copy presented here is preserved in the Blumenstein museum in Solothurn, Switzerland. 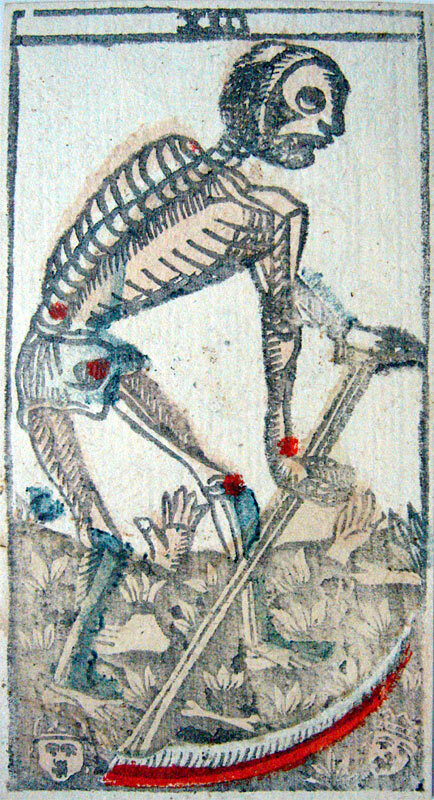 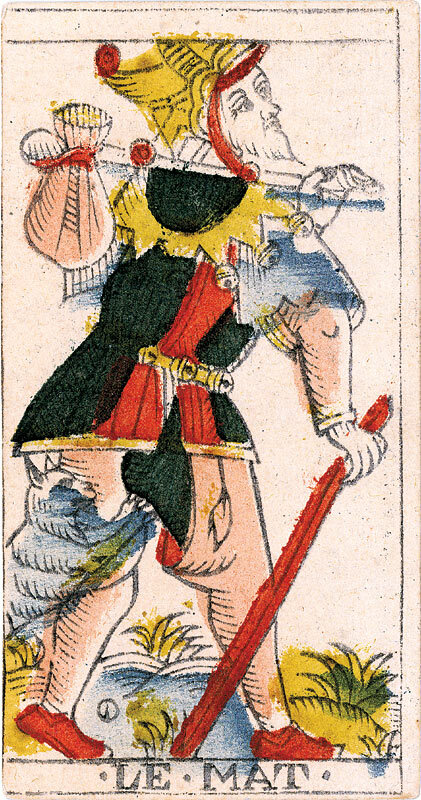 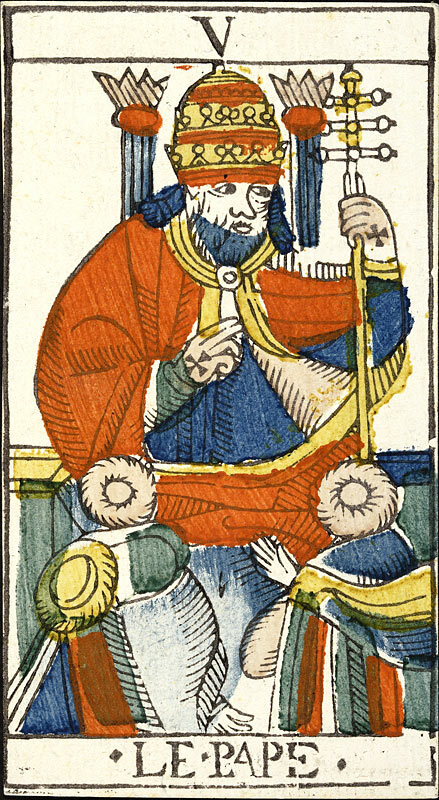 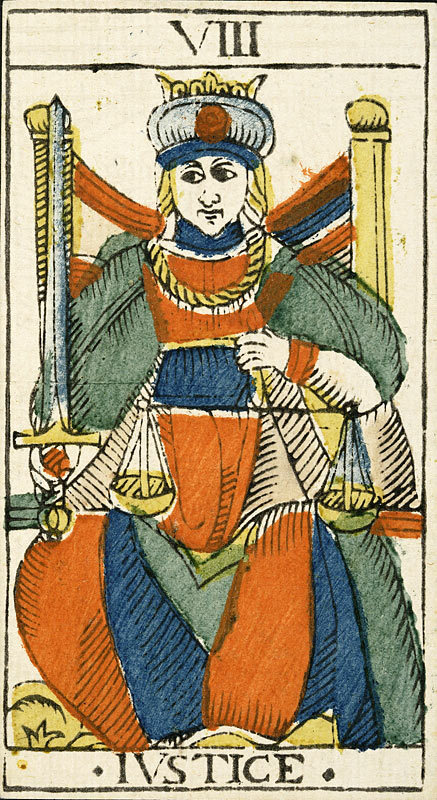 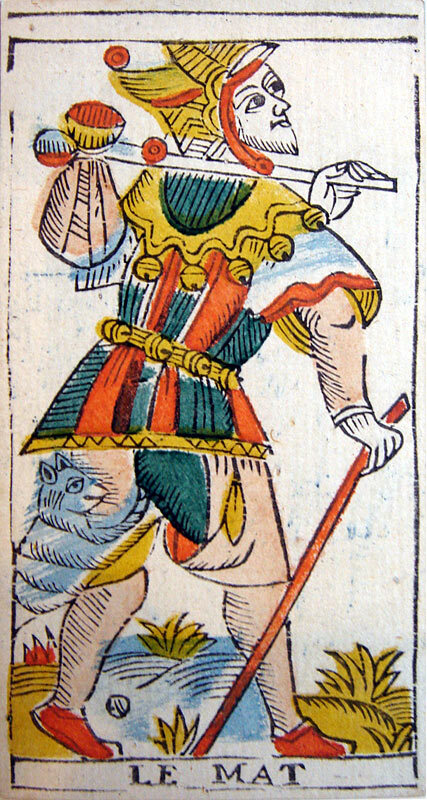 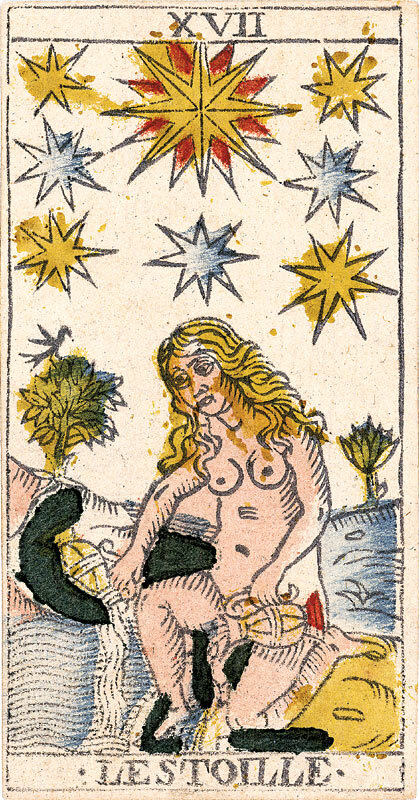 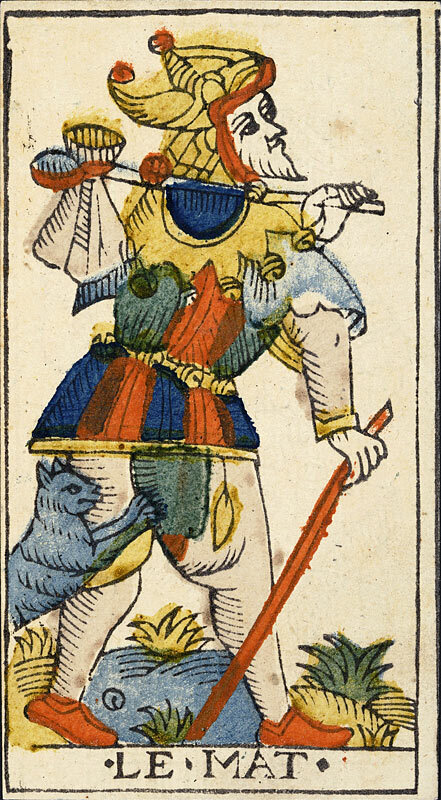 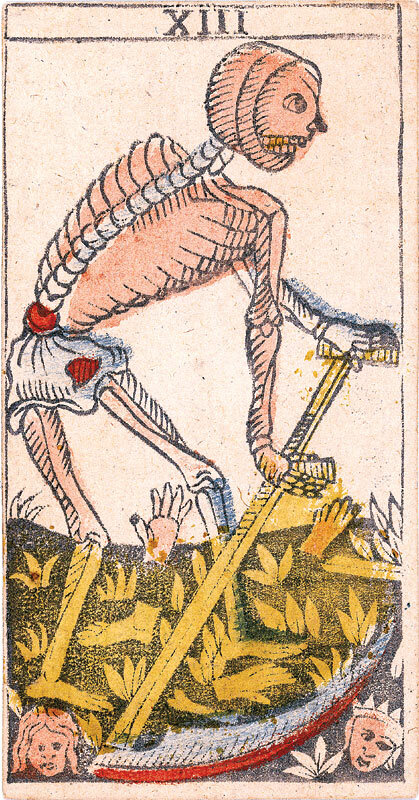 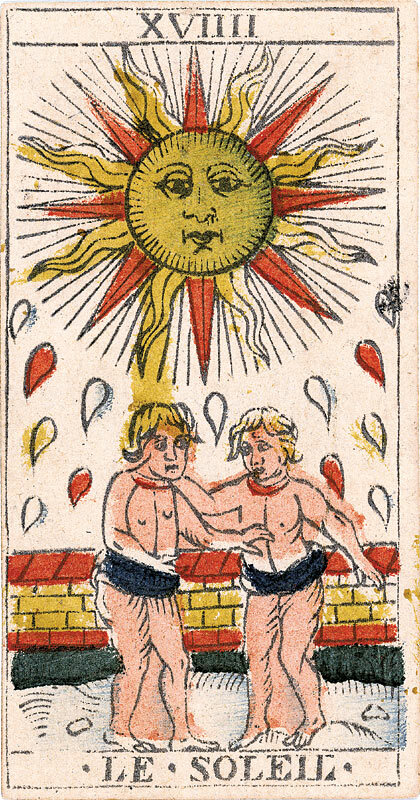 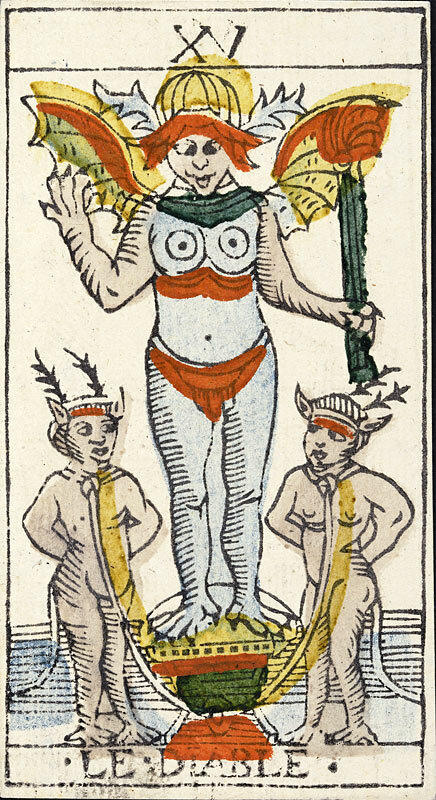 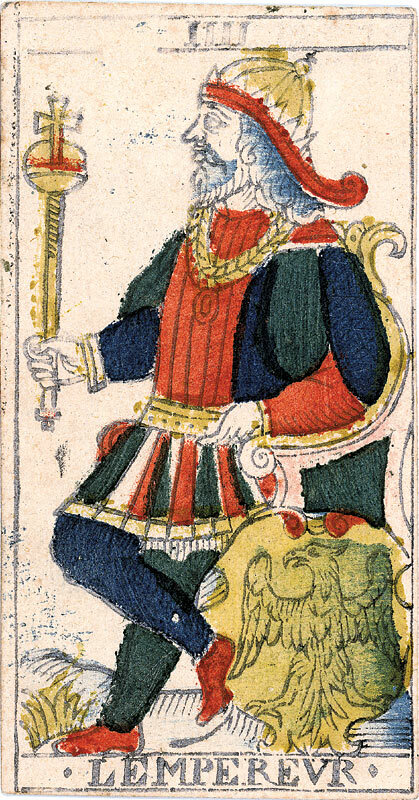 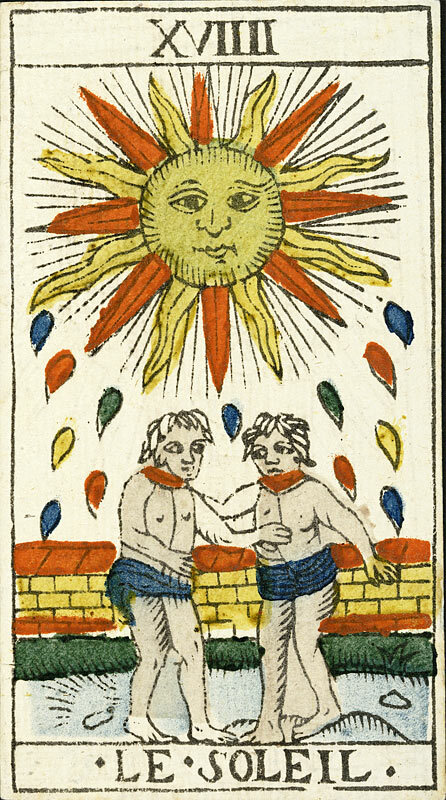 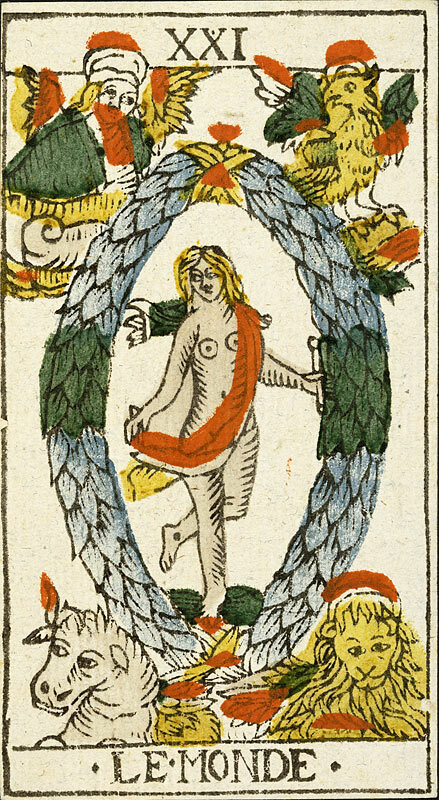 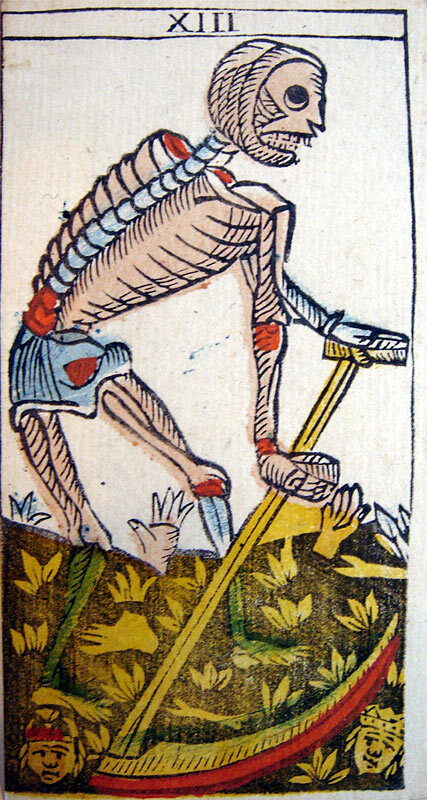 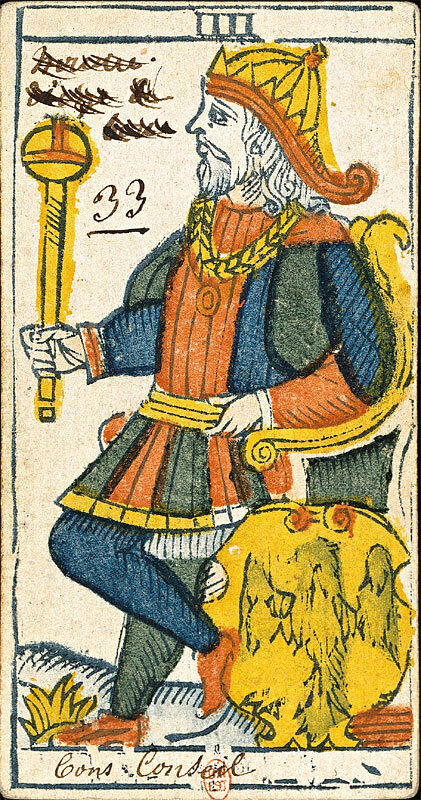 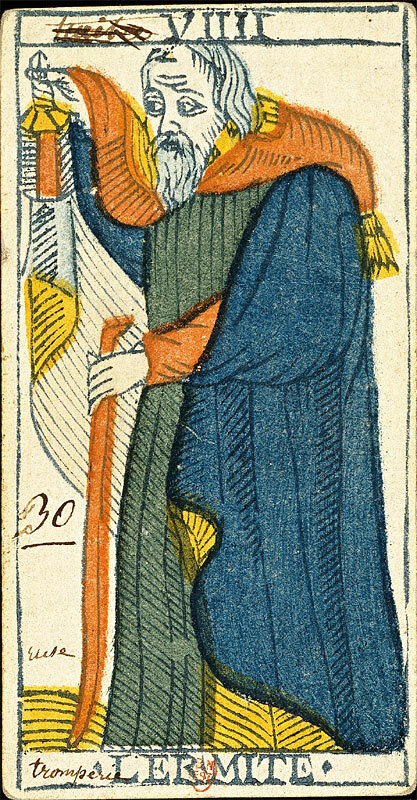 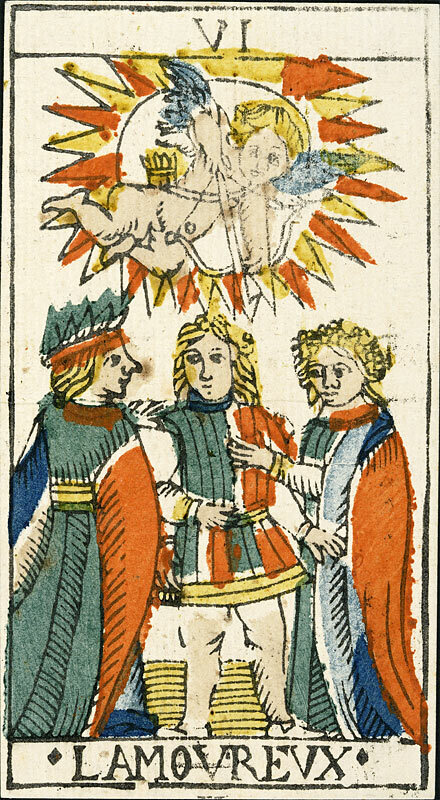 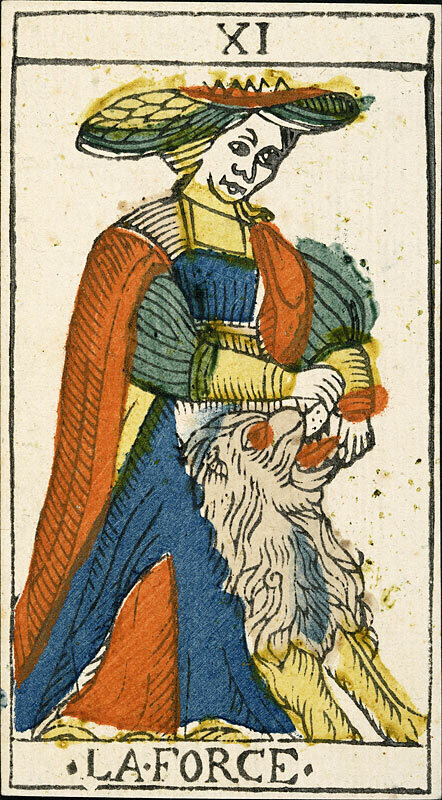 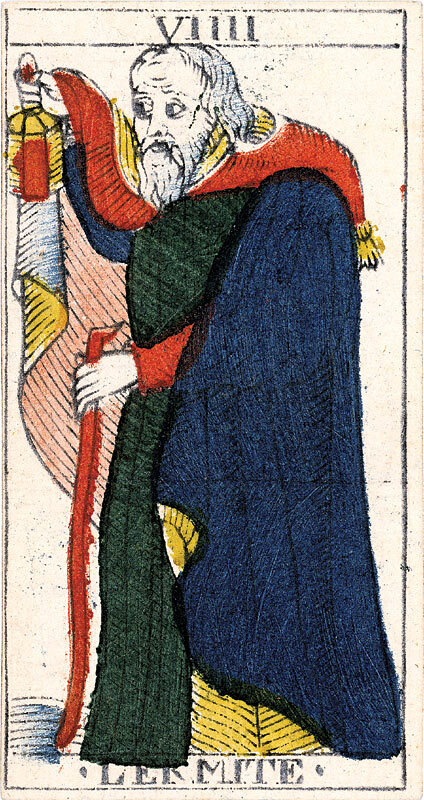 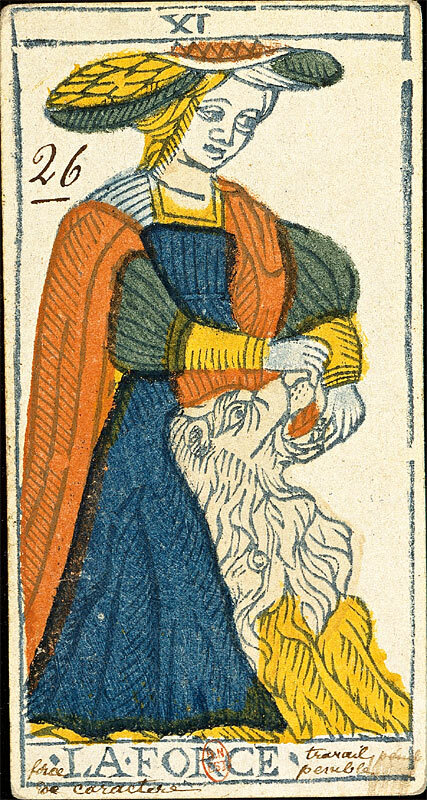 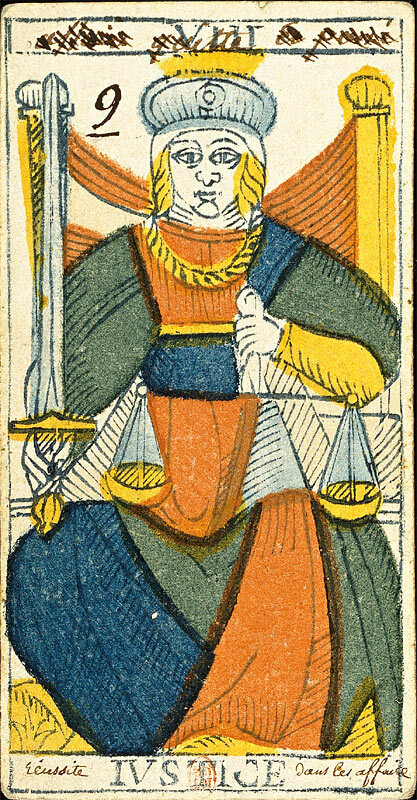 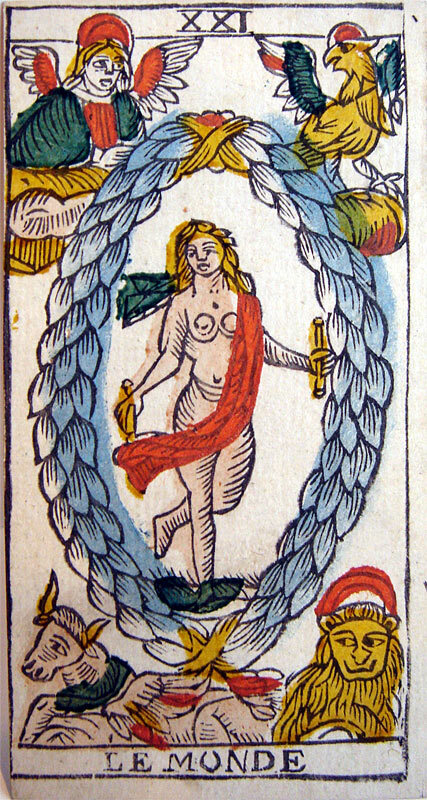 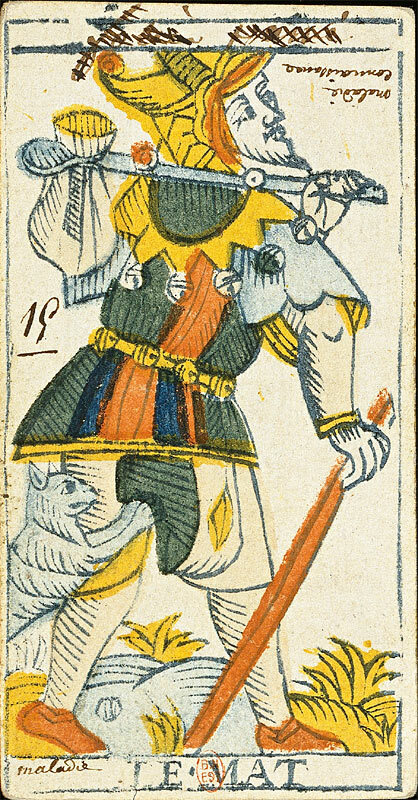 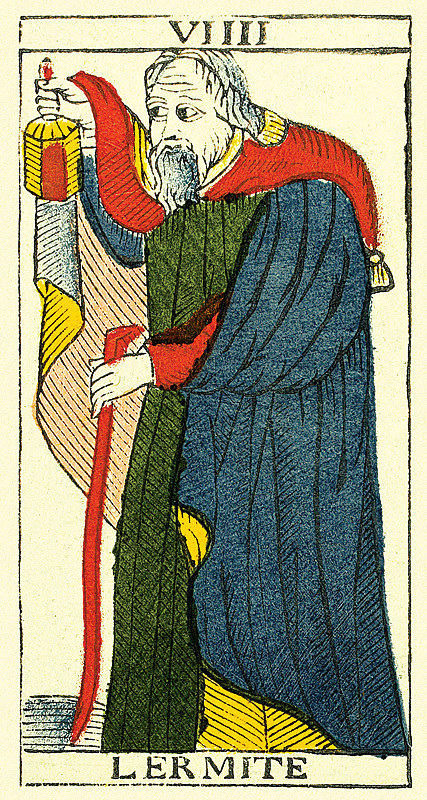 This Swiss Tarot, quite as that of Rochus Schär, also contains precious details for researchers. 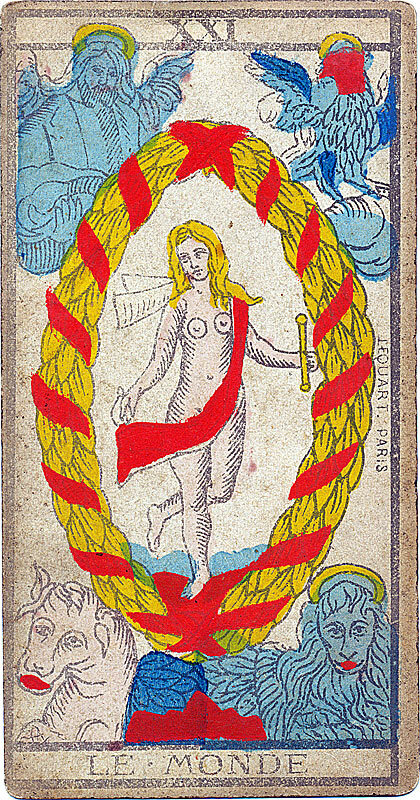 So, we also find here the baguette behind the hand of the character of the Arcana I THE BATELEVR, the foot clearly naked – although colored in red – of the character of the Arcana XII LE PENDV, XV LE DIABLE with his lunar croissants on the breast, here flesh colored, rays of XVIIII LE SOLEIL wide and colored, etc. 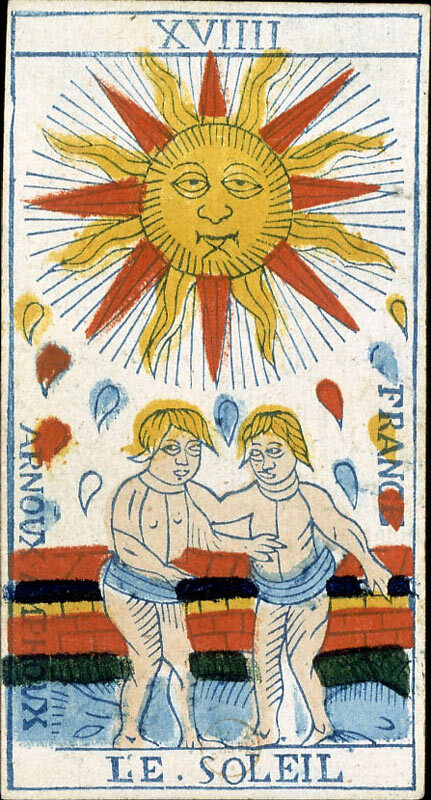 The copy of the deck presented here, in excellent state of preservation and with vivid colors, is preserved in the national museum of the arts and the popular traditions (MNATP), in Paris, France. 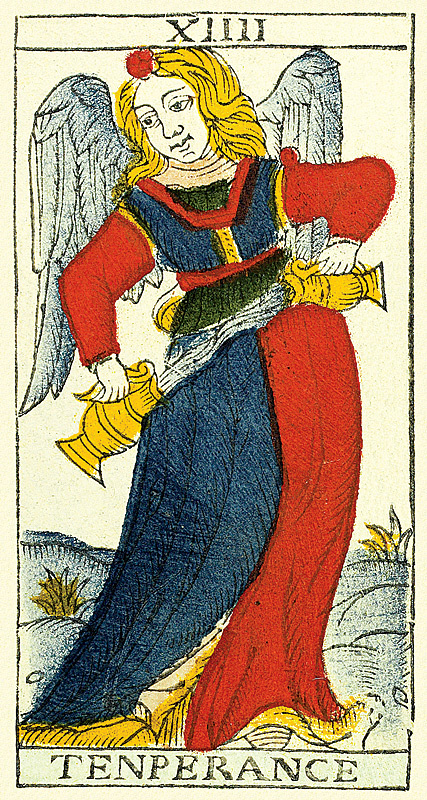 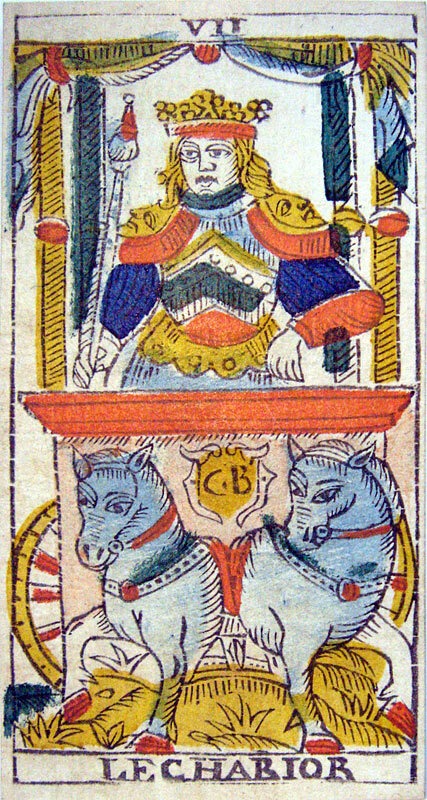 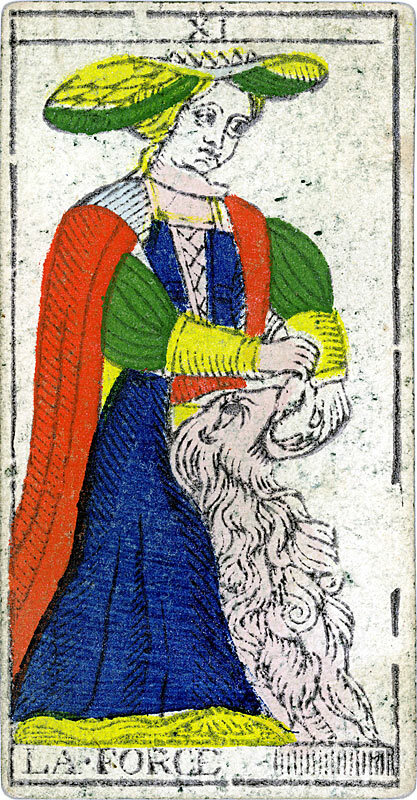 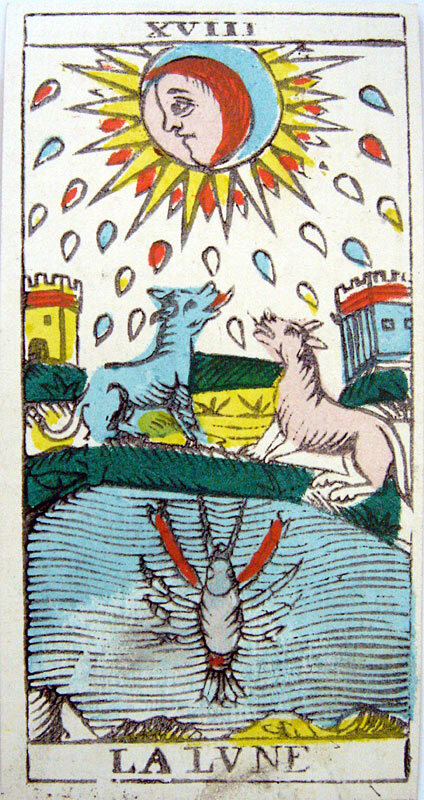 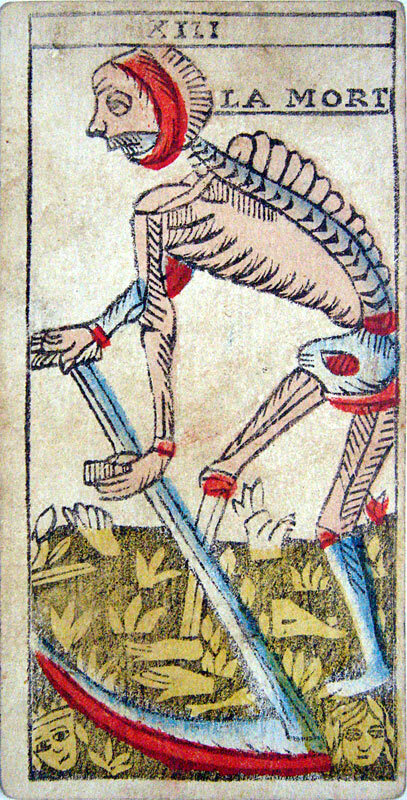 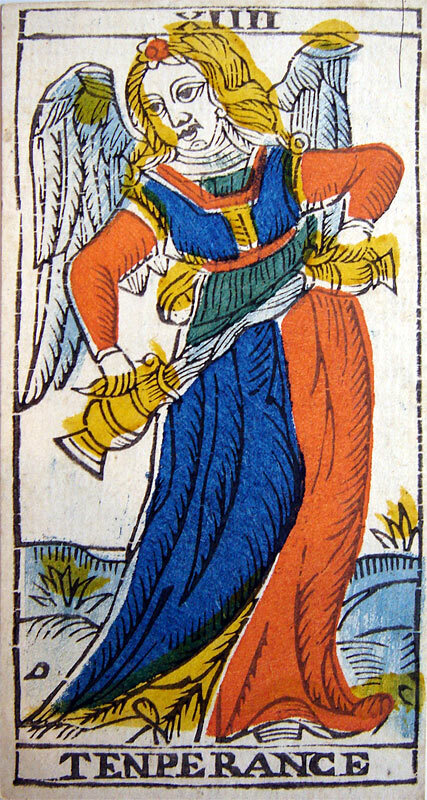 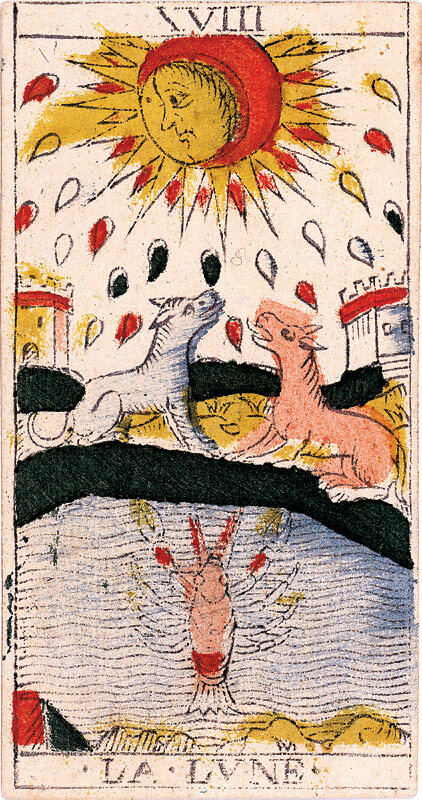 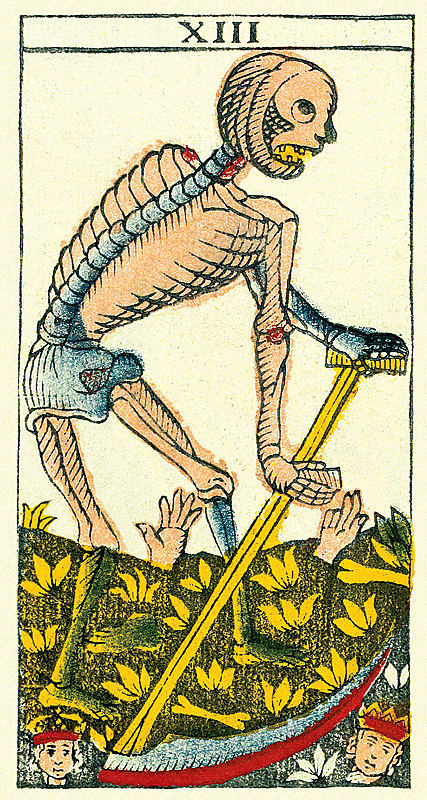 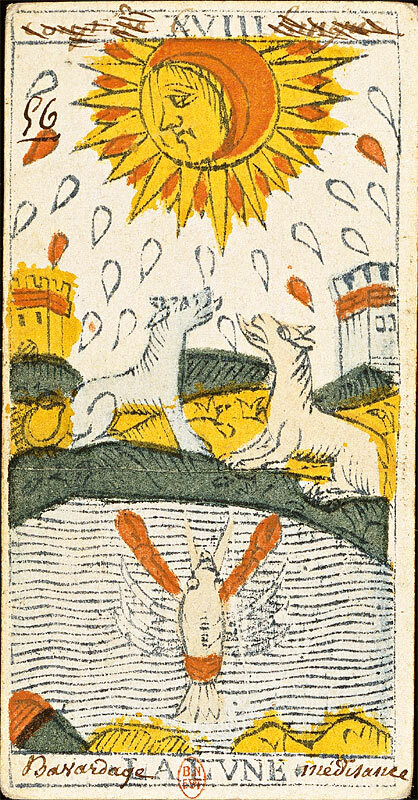 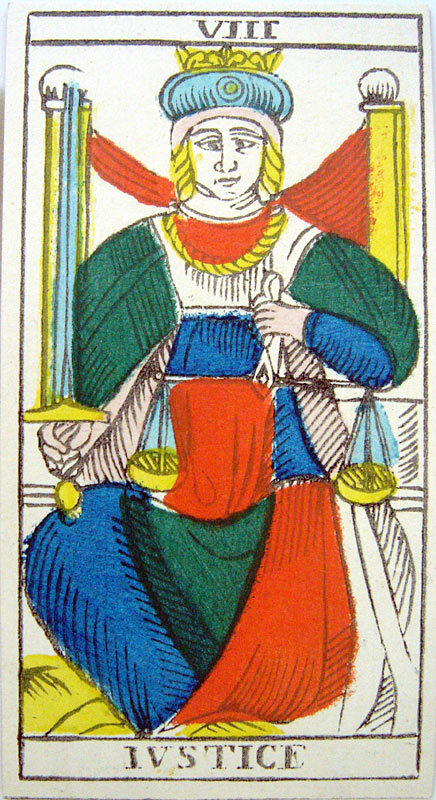 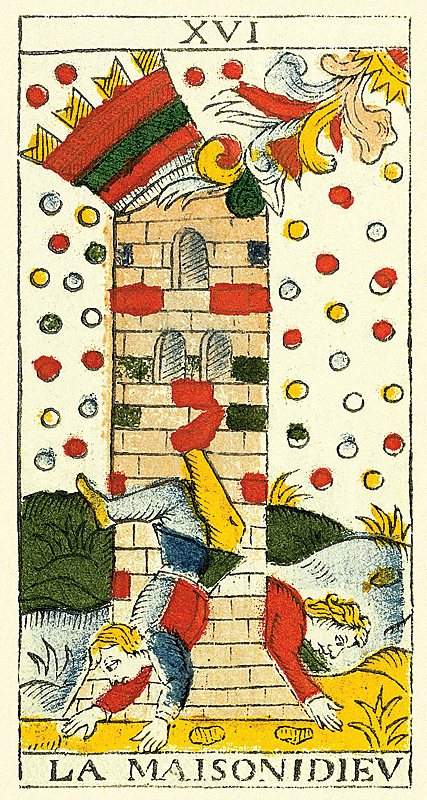 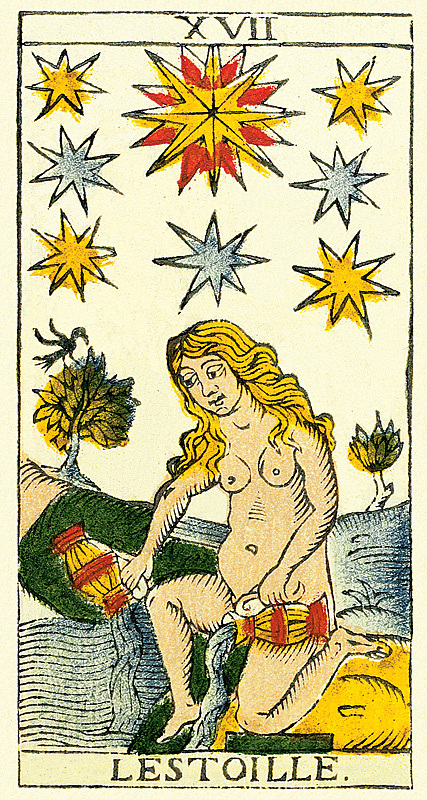 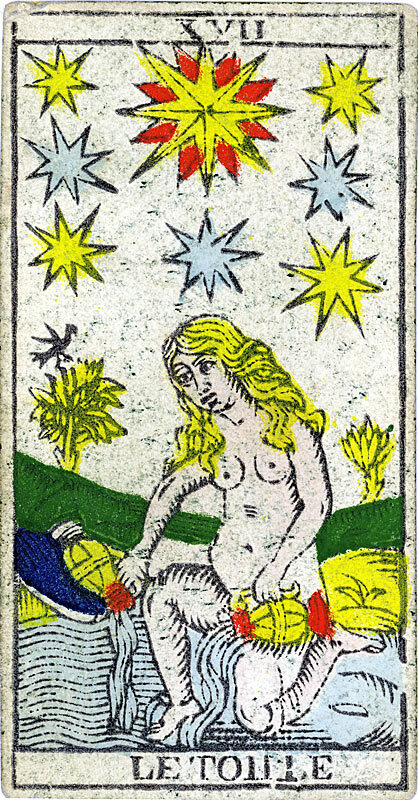 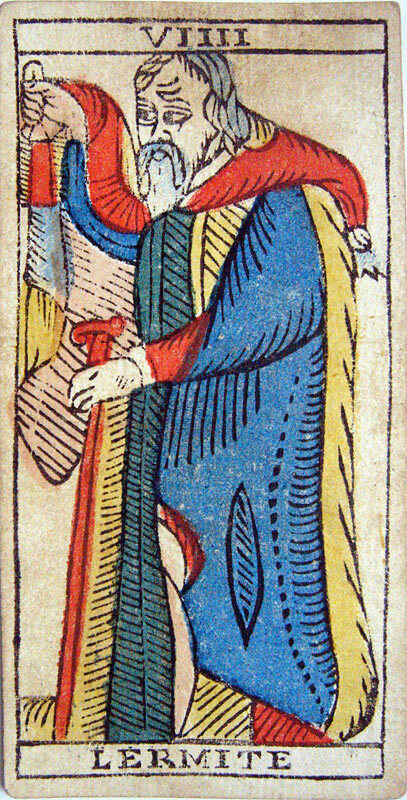 This Tarot of Marseilles constitutes, with the Tarot republished by Paul Marteau in the Editions Grimaud in 1930, the Tarot the most known in the world. 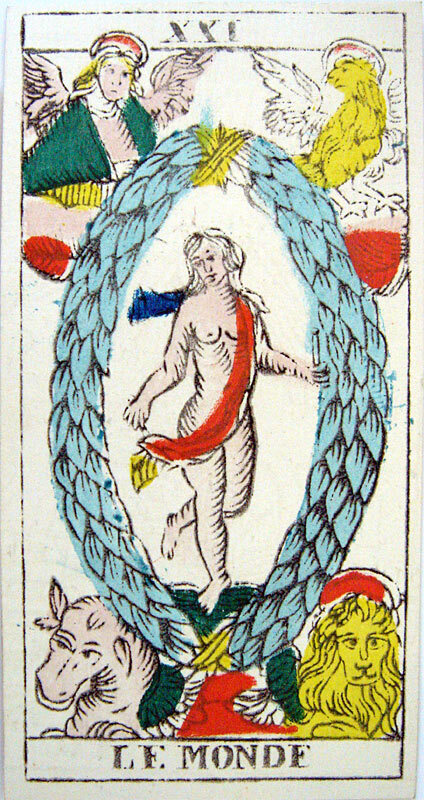 Often taken wrongly for the original of the Tarot of Marseilles, or for the model of reference, this deck is in reality a late production, which is already not any more in agreement with the tradition. 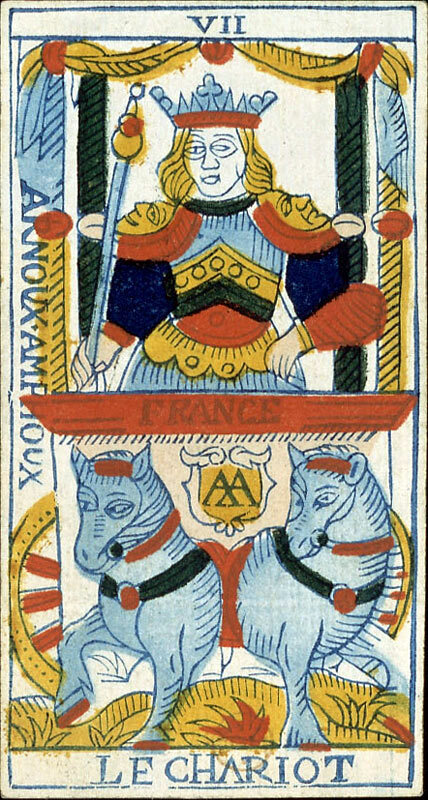 It suffices to compare for example the Arcana XI LA FORCE and XVIII LA LVNE with those of more ancient Tarots, as that of the Pierre Madenié 1709, that of the François Chosson 1736, that of François Héri 1718 (and of course that of the Tarot of Marseilles Millennium Edition, 2011), to realize it at once. 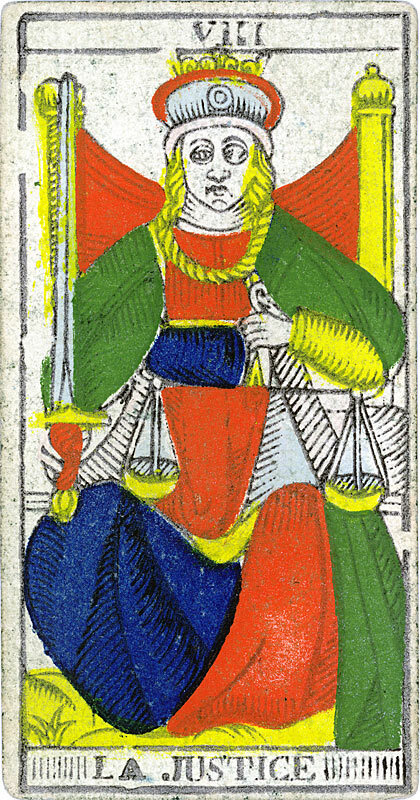 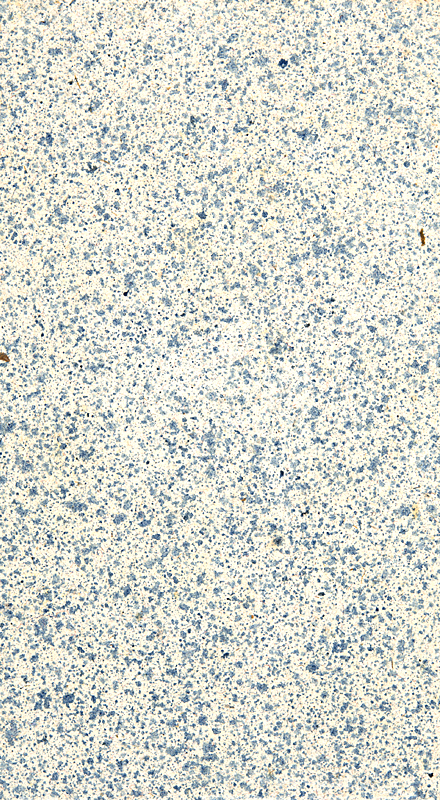 We can also notice important changes at the level of the colorization of this edition, due to errors and excesses (light blue for instance), but also at the level of the names of the cards, which underwent the humanist normalization of the XVIIIth century, the letters V and I (Those corresponding to J) being replaced by letters U and J respectively. 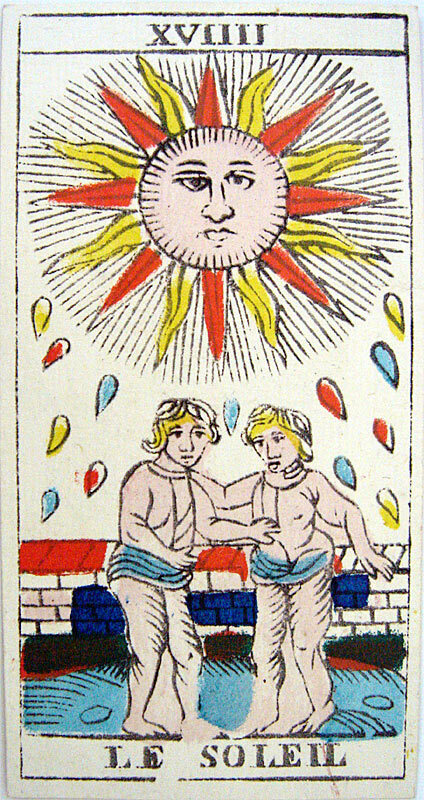 The copy of the deck presented here (1860 edition) is part of a private collection. 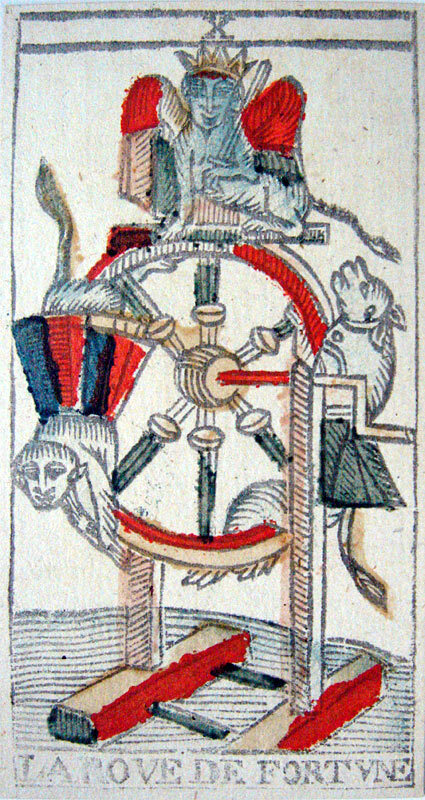 This Tarot, charming though presenting an iconography very much altered with regard to the traditional cannon, is very interesting. 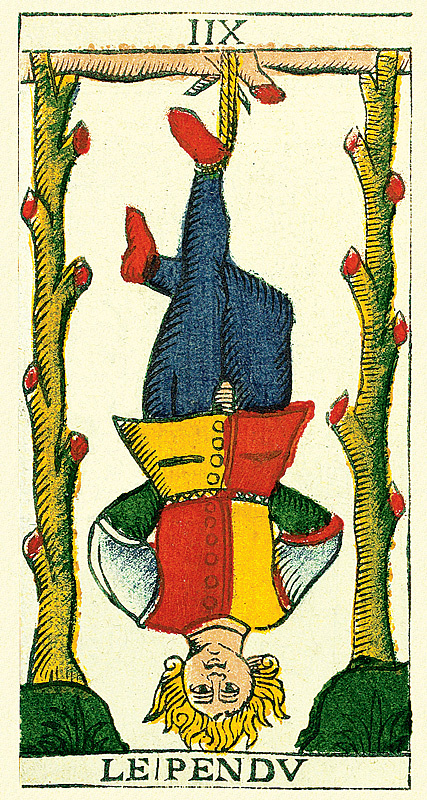 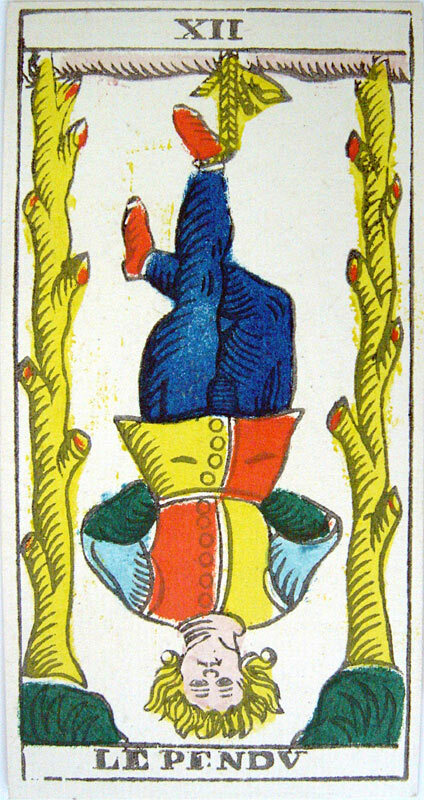 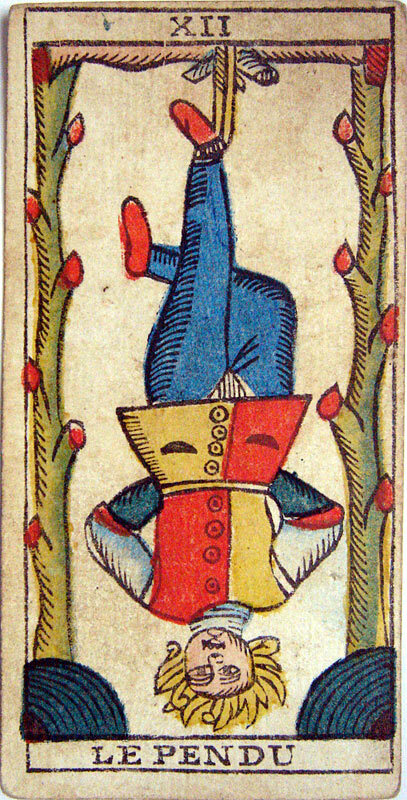 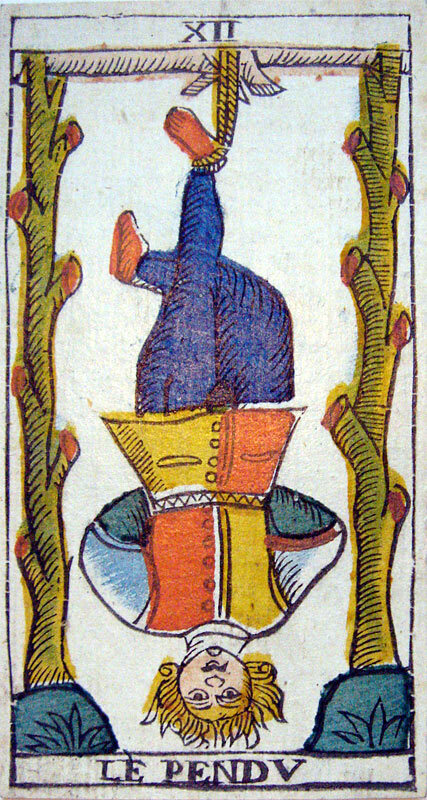 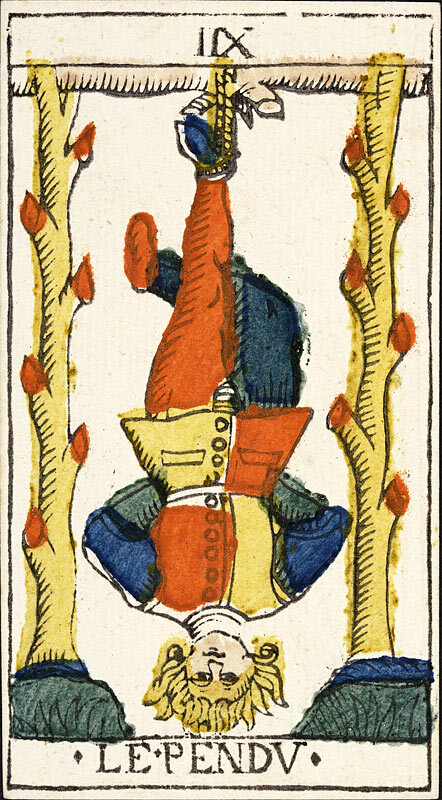 Indeed, by the inversion of the orientation of several cards, it demonstrates (with other ancient decks) that the cards of the Tarot of Marseilles were sometimes printed in the one or the other direction. 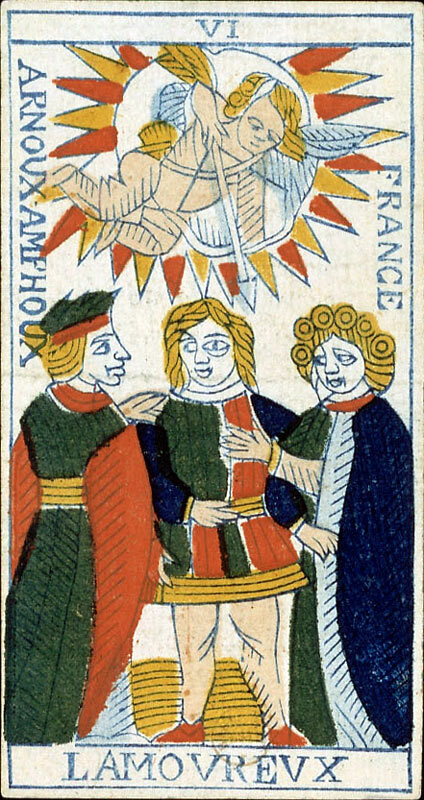 By the way, Arcanum XIII meets here in the traditional orientation (as in most of oldest decks known, in particular Italian, yet of another category), while Arcana LA ROVE OF FORTVNE and XVIIII LE SOLEIL are actually inverted. 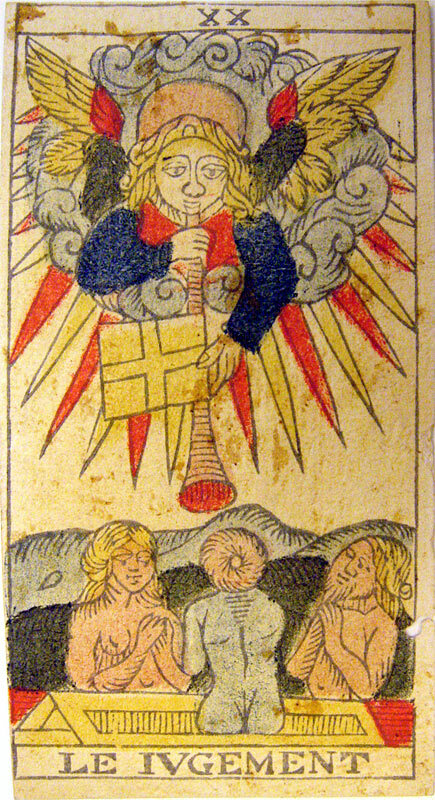 The copy presented here is preserved in the national museum of Schaffhausen in Switzerland. 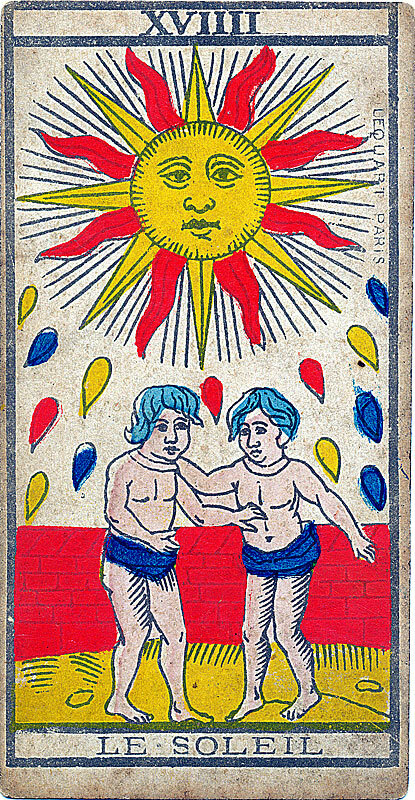 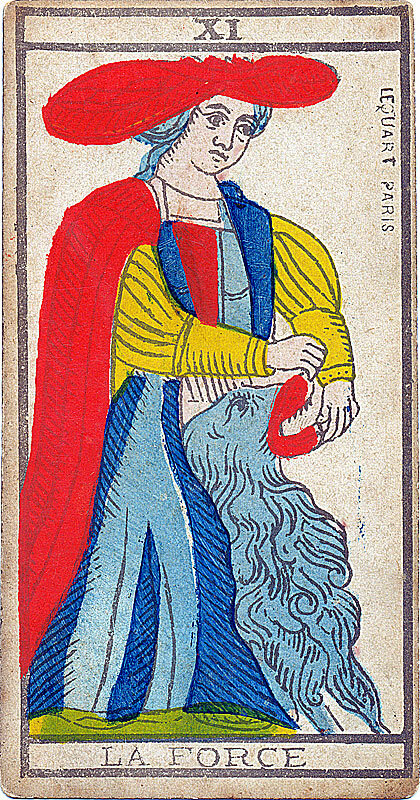 This Tarot of Marseilles, stylized copy of the deck of François Tourcaty 1745, has been realized by the meeting of two master cardmaker from Marseilles, Arnoux and Amphoux. 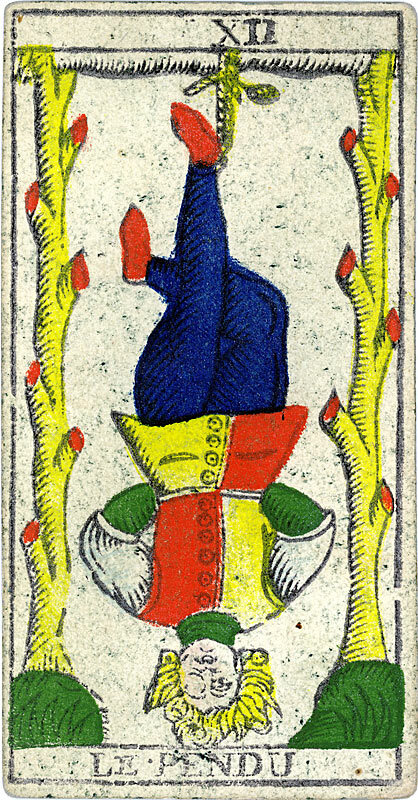 It demonstrates to which point, towards the end of the XVIIIth century, the iconography of the cards was very much altered, both at the level of details and geometry. 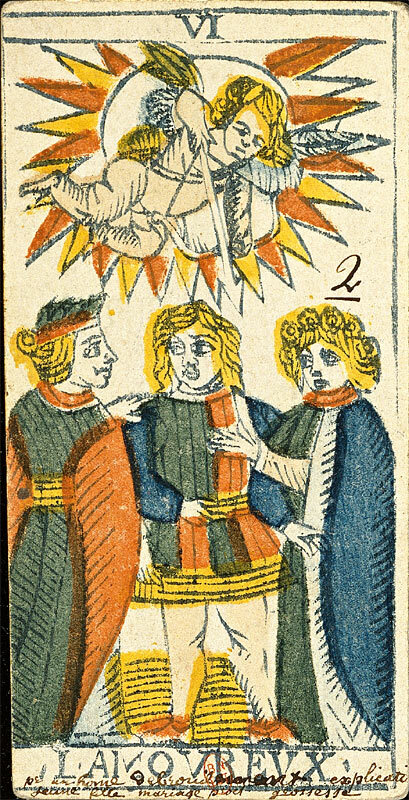 For this demonstrative value, and because it is one of the rare Tarots realized in Marseilles preserved, this copy, with beautiful and vivid colors, is presented here. 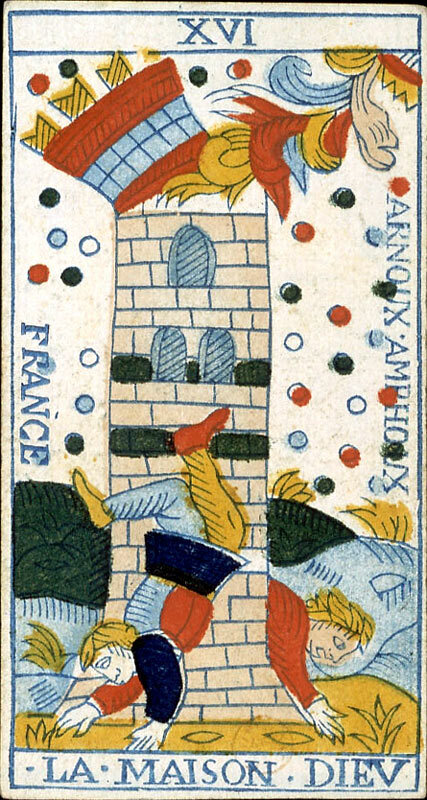 It is preserved in the Bibliothèque Nationale de France (BNF, french national library), Paris, except Arcanum XV THE DEVIL, missing in the BNF copy, which comes from another collection. 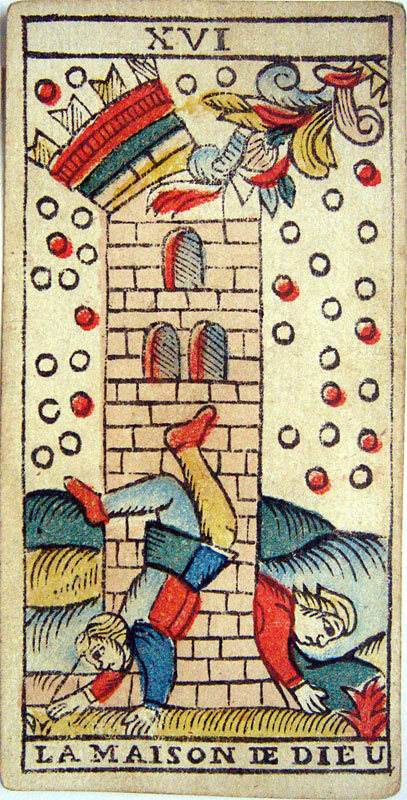 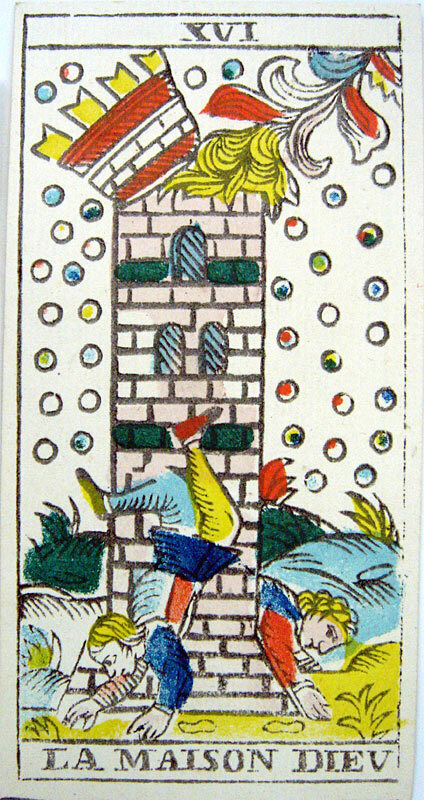 This Tarot of Marseilles was realized by one of last traditional master cardmaker of the city of Marseilles. 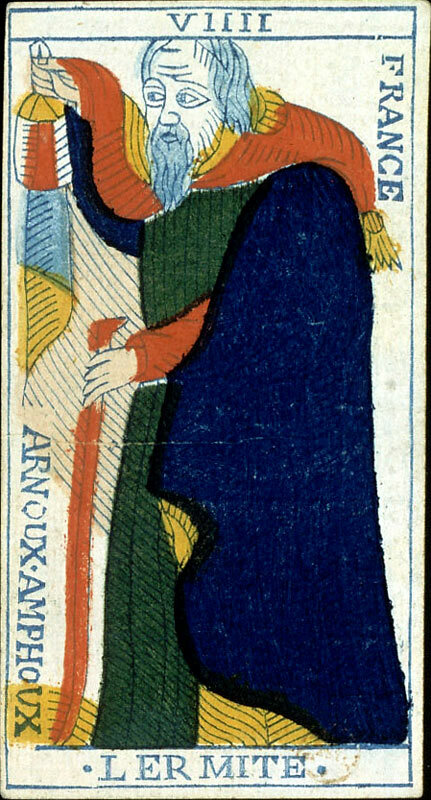 With the Tarot of Arnoux and Amphoux, it shows, as we can notice it with the series of decks presented this before, alterations always more important of the iconography of the cards as we move forward in time. 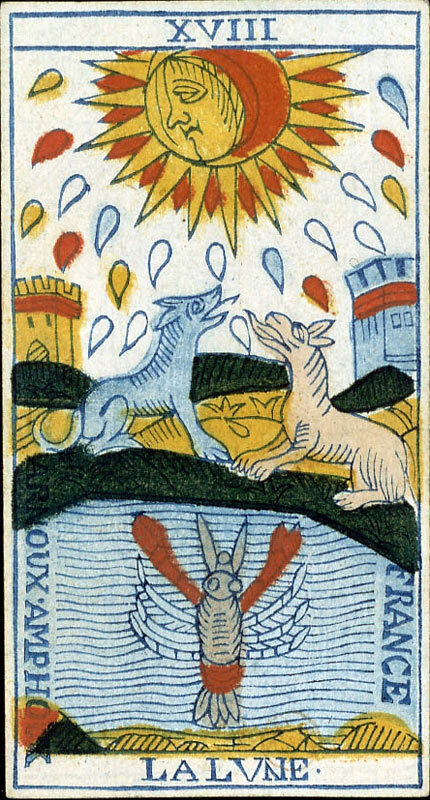 However, in spite of these damages, we remain fascinated by the beauty and the mystery of these icons, and by the aura of mystery which surrounds them. 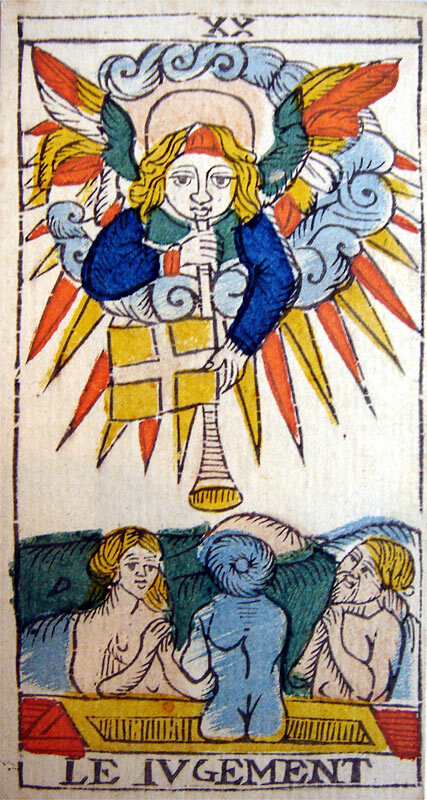 The copy presented here is preserved in the national museum of Schaffhausen in Switzerland. 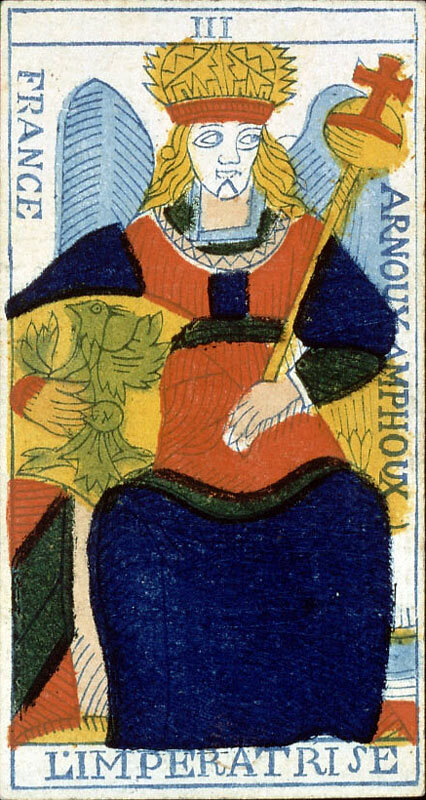 This Tarot of the XVIIIth century, the first known publishing of which, presented here, was realized by the House Lequart in 1890, is maybe the most mysterious, and certainly one of the most precious of all the known historic Tarots. 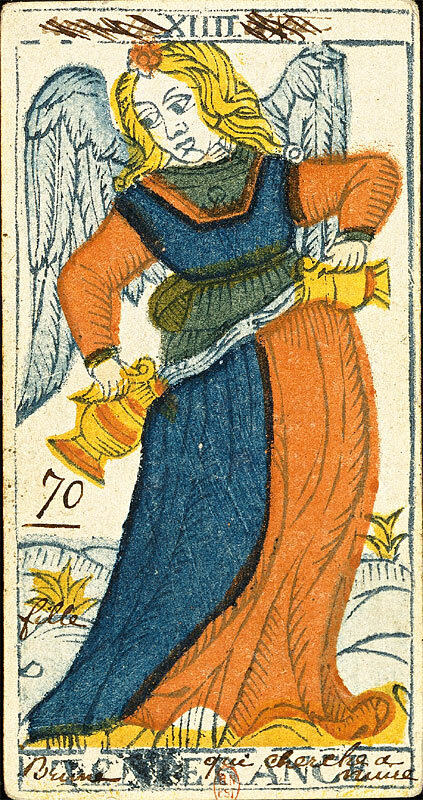 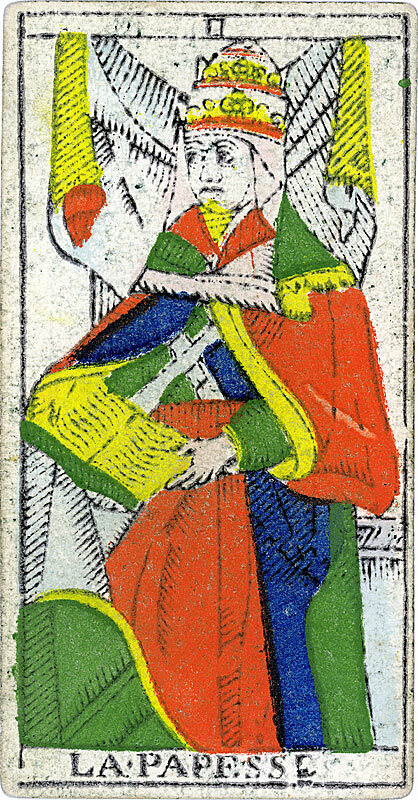 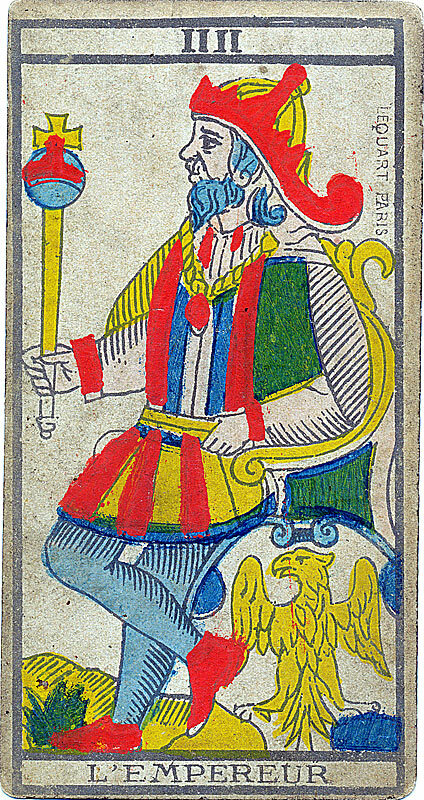 Indeed, if the iconography of this deck –- in reality very certainly realized by the House Lefer between 1778 and 1800 – is very altered compared to the traditional iconography of the Tarot of Marseilles, that we can admire on models oldest (such as the Tarot of Pierre Madenié 1709 and that of the François Chosson 1736), it presents however the peculiarity unique to be of an extraordinary geometrical purity and correctness, containing, according to Wilfried Houdouin, geometrical “ markers ” allowing to find the very place of the cards in their sacred geometry matrix. 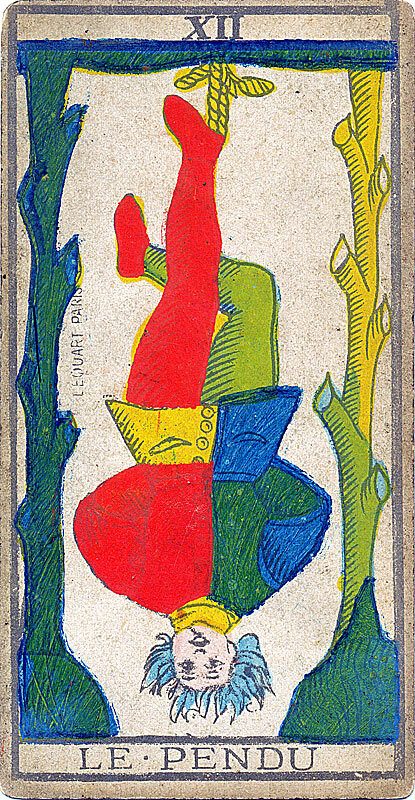 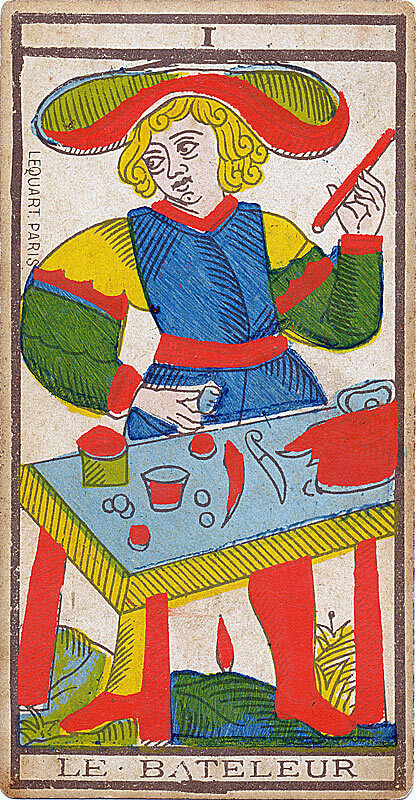 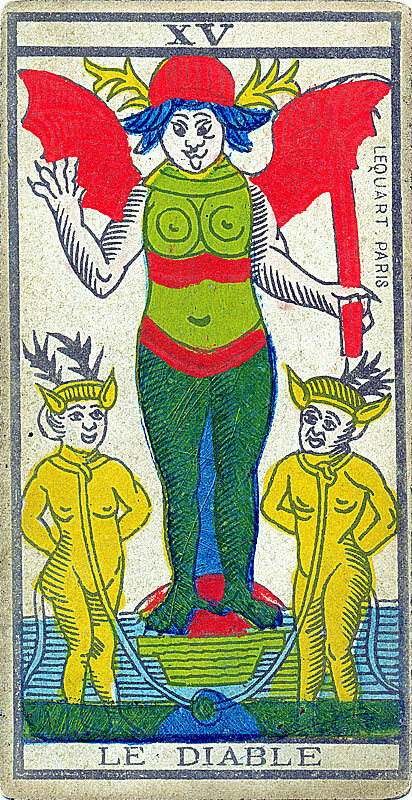 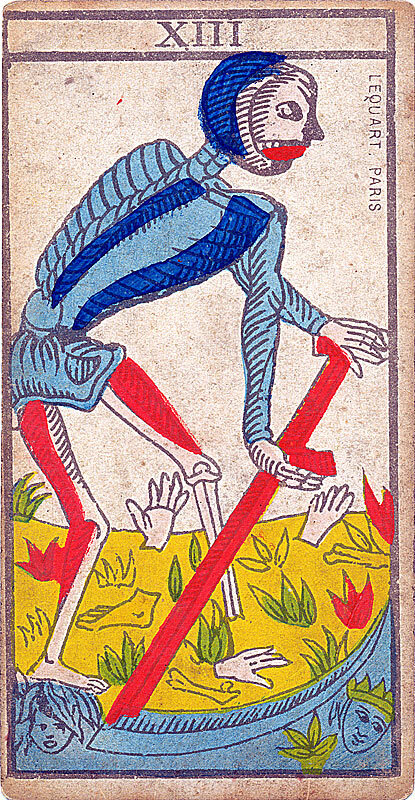 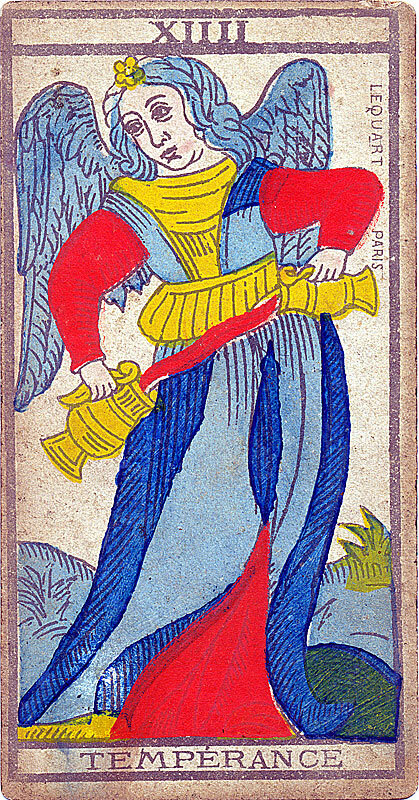 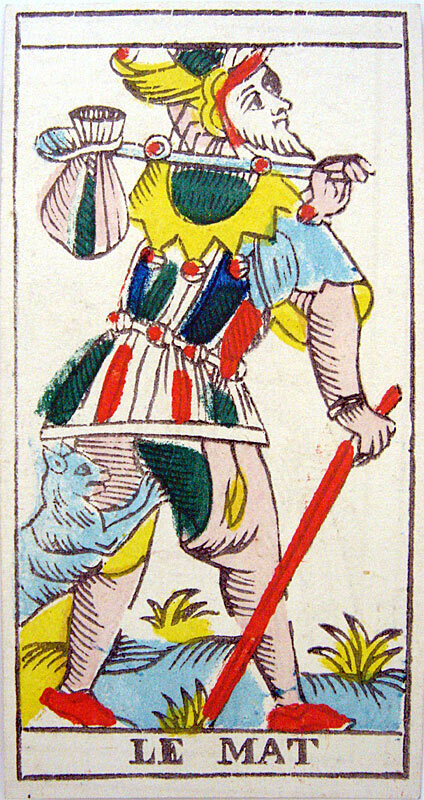 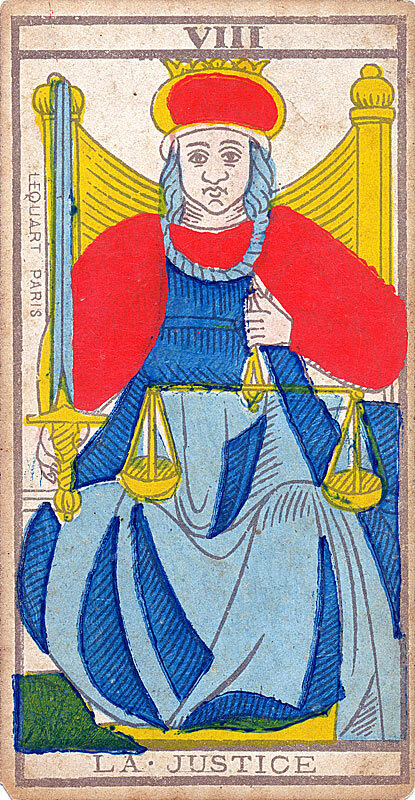 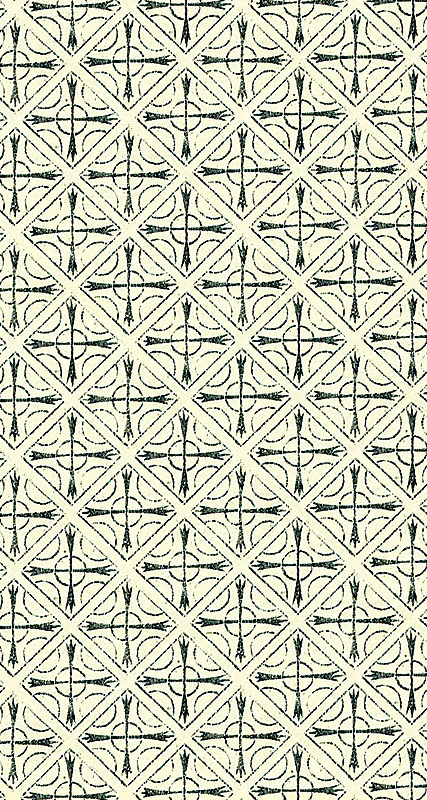 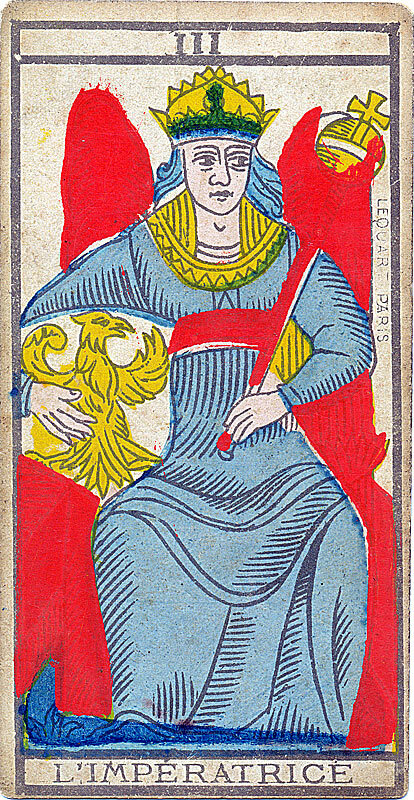 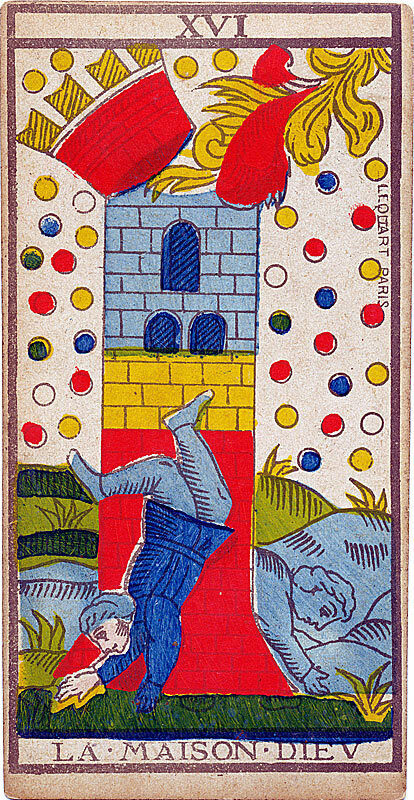 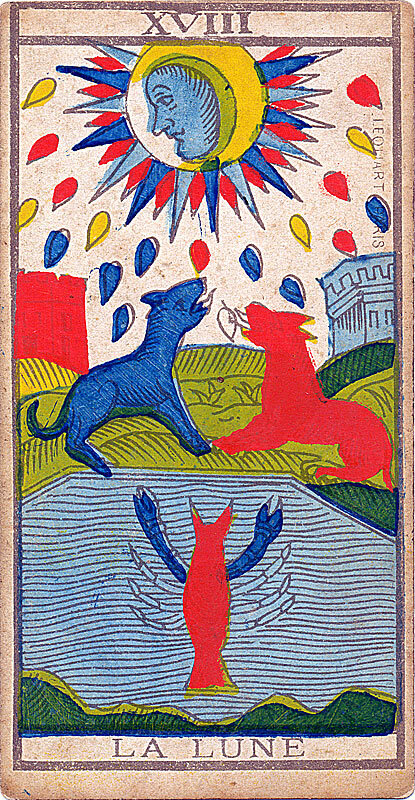 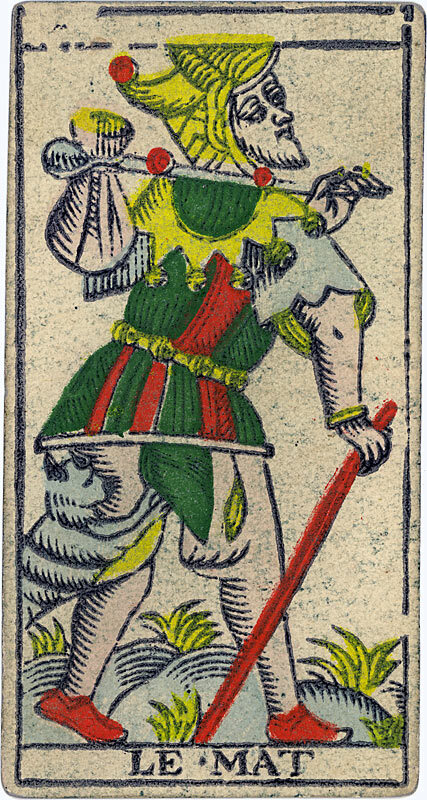 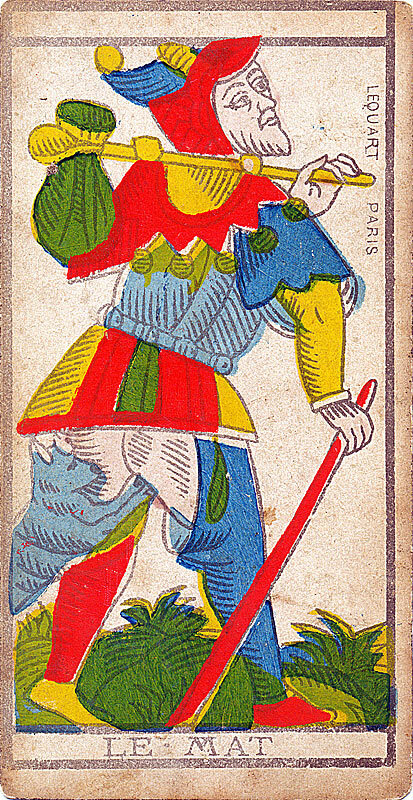 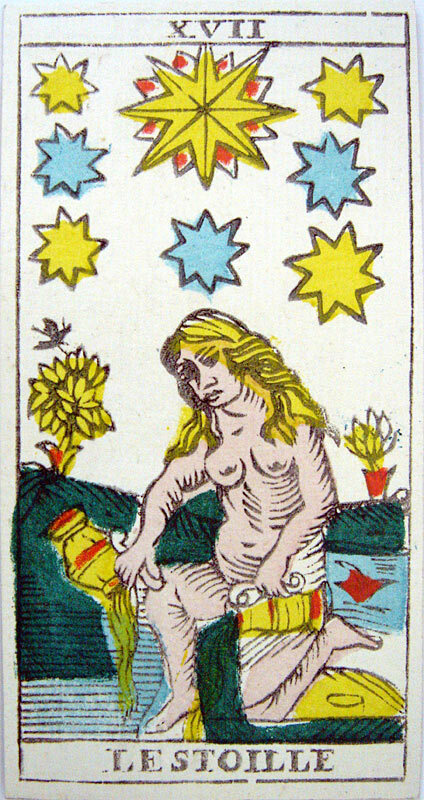 Besides, it is the present deck which was republished by Paul Marteau in 1930, realizing the Tarot of Marseilles the most known in the world (still published by Grimaud Editions), even though it contains, as this first publishing of Lequart realized in 1890, colored with stencils, its second publishing realized the same year but colorized by industrial process, and its third publishing realized in 1891 by Grimaud (also colorized by industrial process), a cannon of fanciful color. 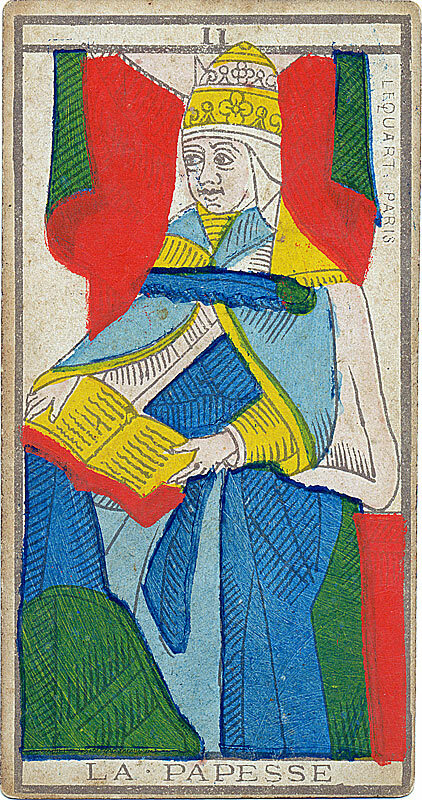 To know more about this unique deck and about its peculiarities, the reader is invited to refer to the book of Wilfried Houdouin Le code sacré du Tarot (Sacred code of the Tarot ), containing a dedicated note. 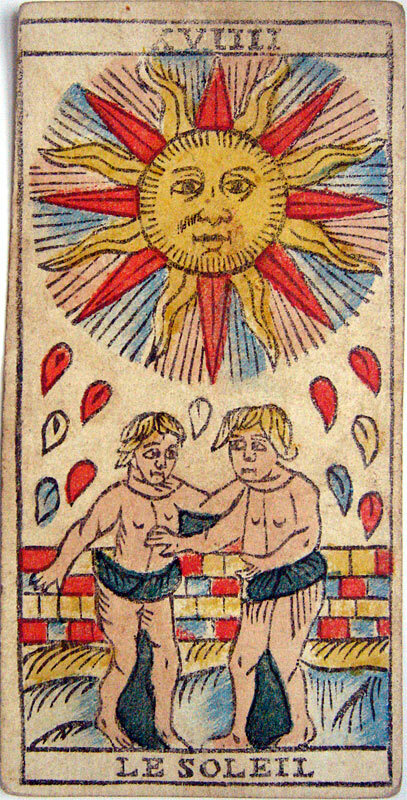 The copy of the deck presented here is preserved in a private collection.